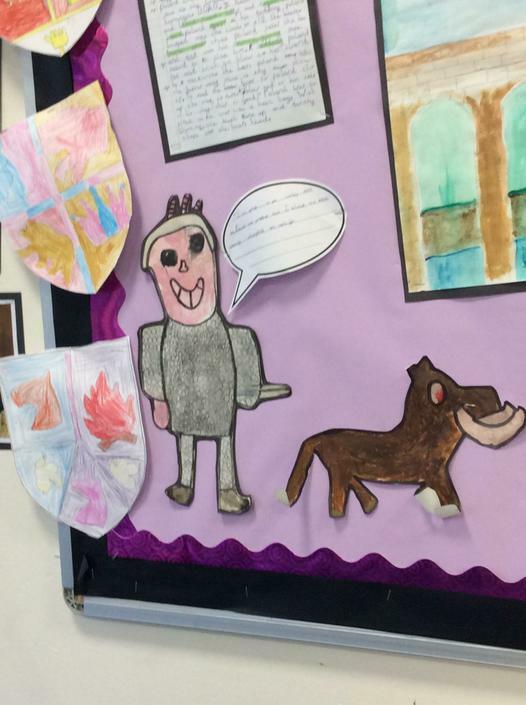 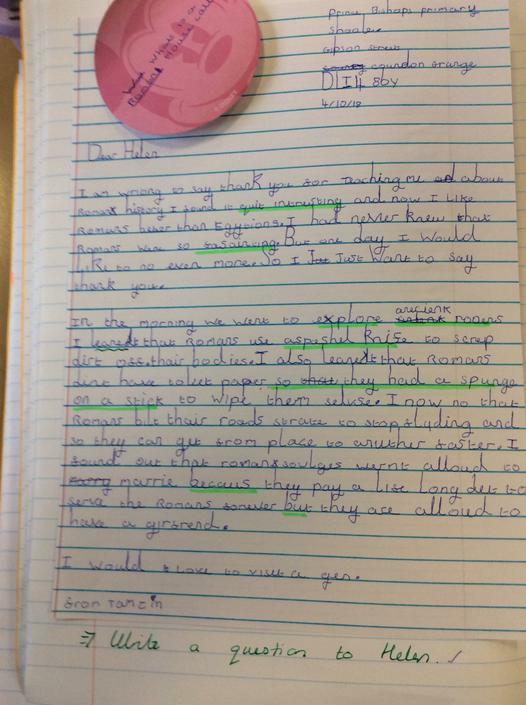 I am really lucky to be working in Year 4 again this year. 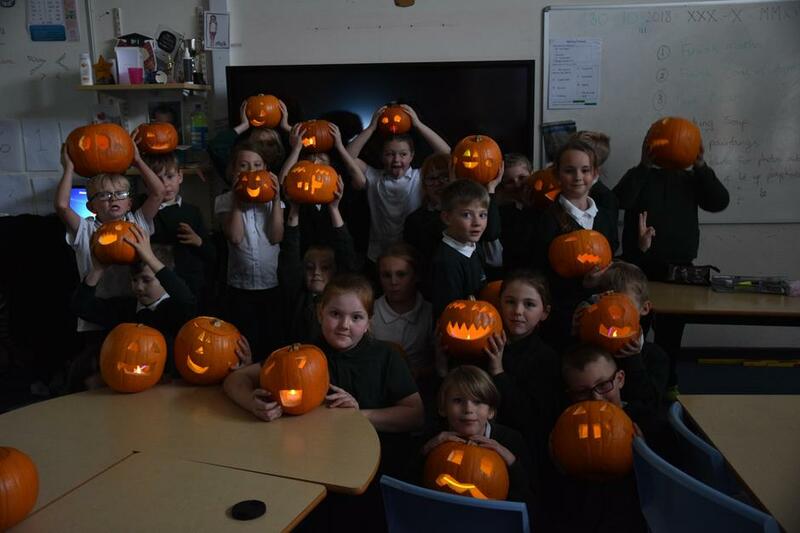 This will be my 25th year in teaching and I still feel excited and extremely fortunate to be working with your fantastic children. 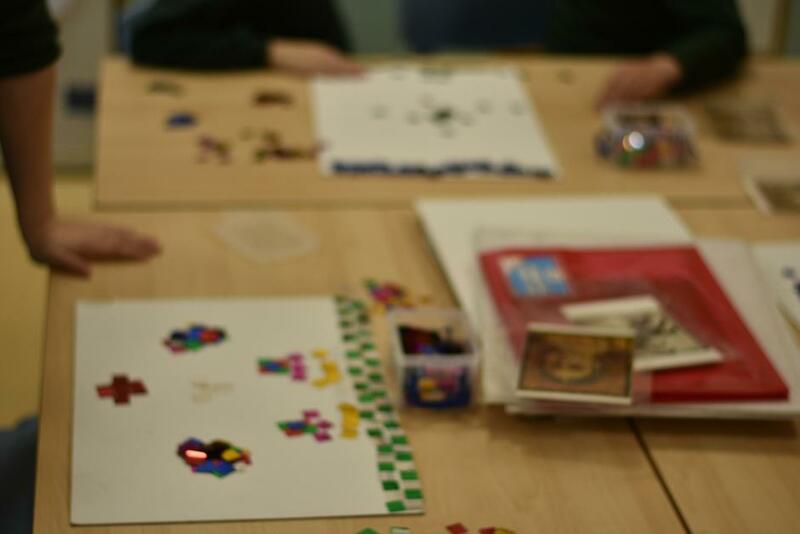 Please do not hesitate to get in touch if you have concerns about anything, we are always happy to help. 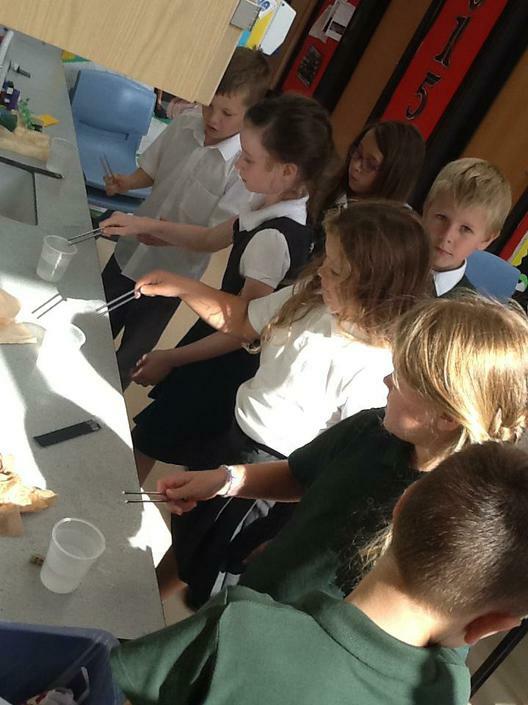 We are also very lucky in Year 4 to have Miss Taylor who is an experienced teaching assistant who wanted to follow this class into Year 4. 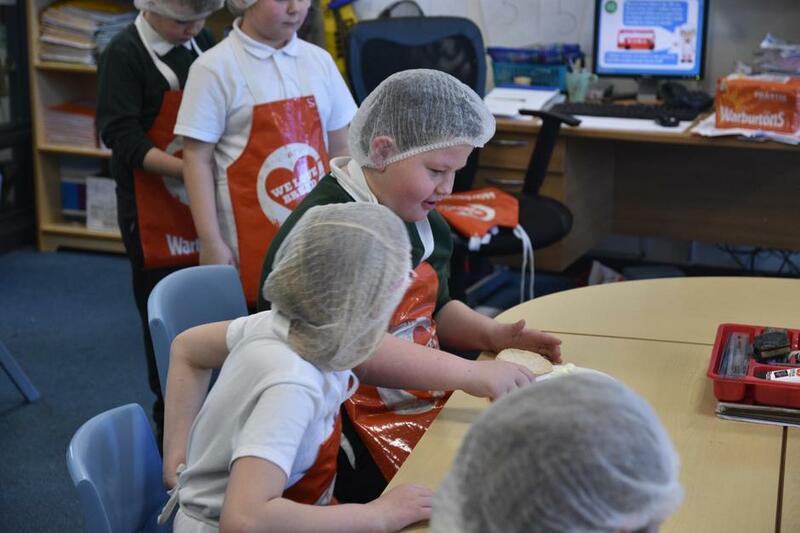 We had a visit from a lady at Warburtons, we talked about healthy eating and the different parts of our diet. 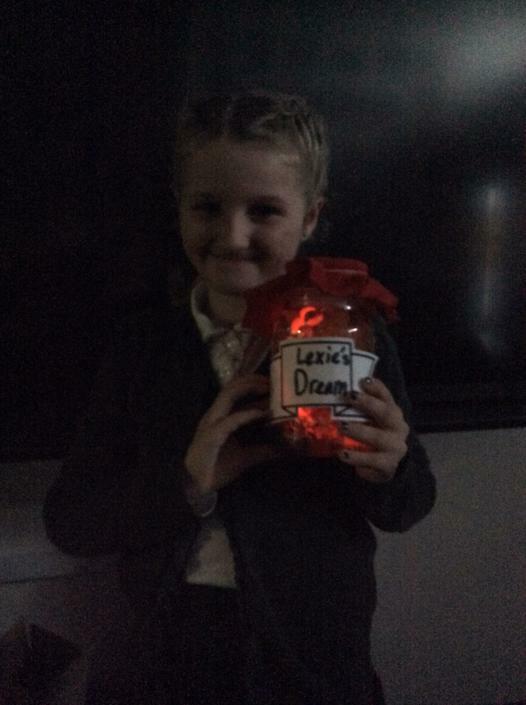 As a class we discussed how much of each food type we should be eating, how much sleep our bodies need and the dangers of energy drinks. 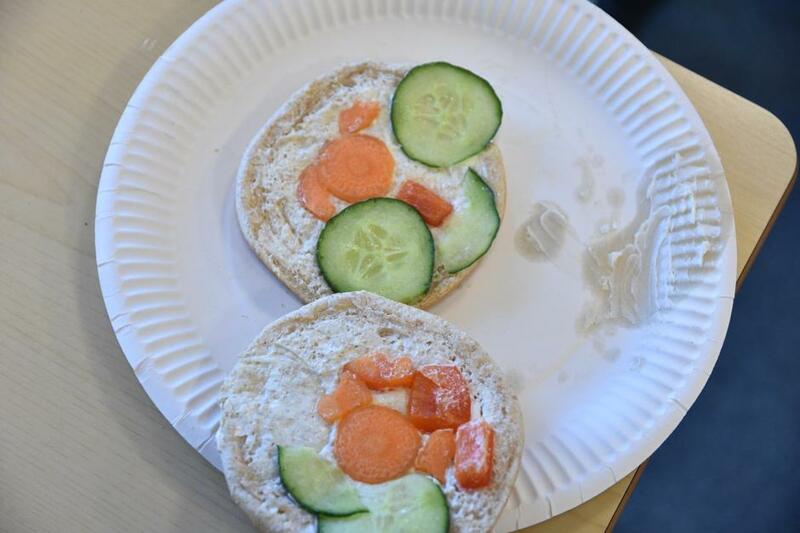 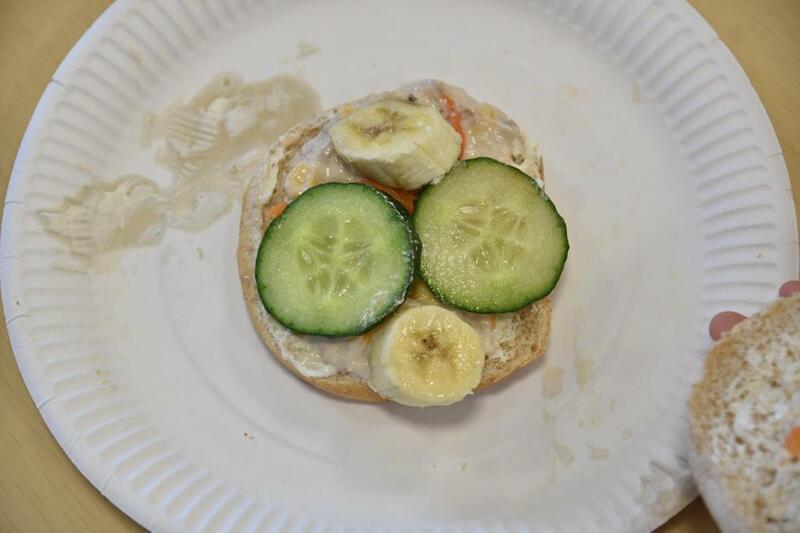 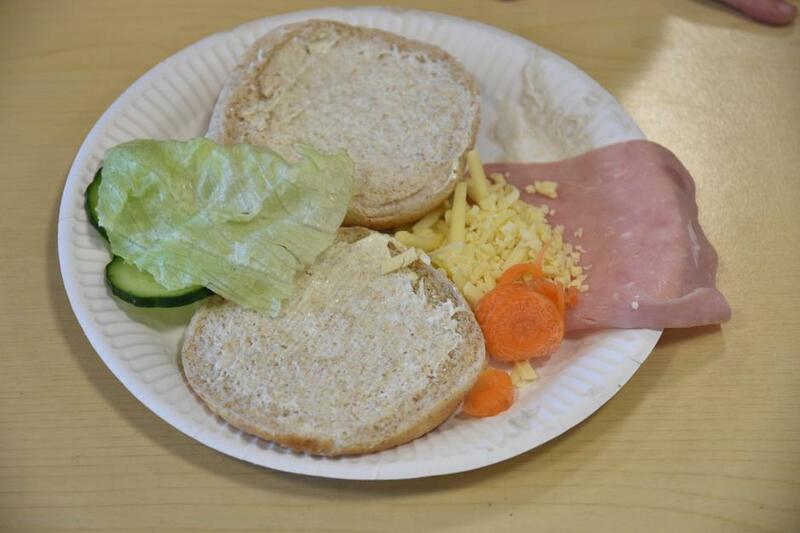 We went on to make healthy sandwiches, many of us tried something new. 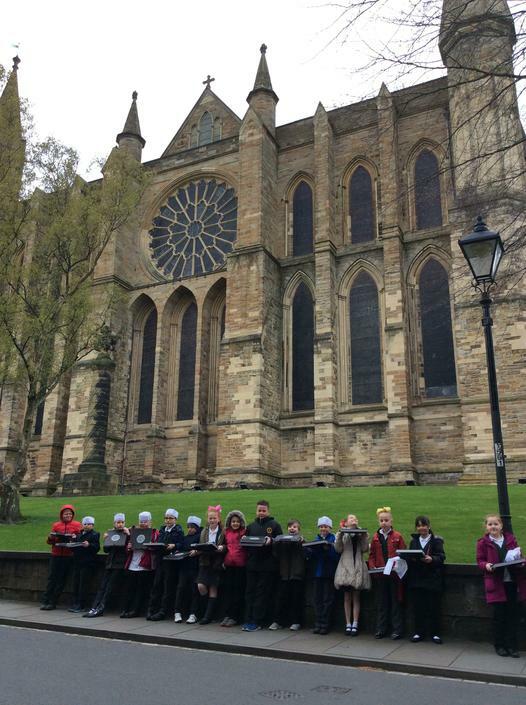 We have been lucky enough to take part in Arts Award and have visited The Catch your Breath exhibition at Palace Green in Durham. 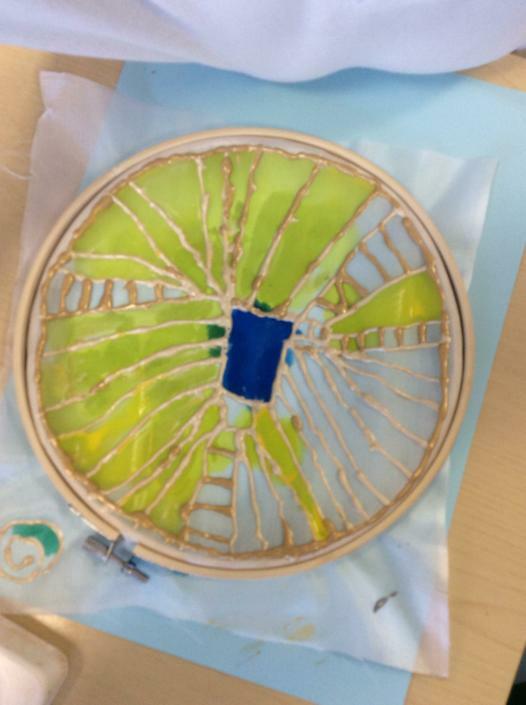 Catch your Breath Art, this work is going to be put into the exhibition in Palace Green Library in Durham City. 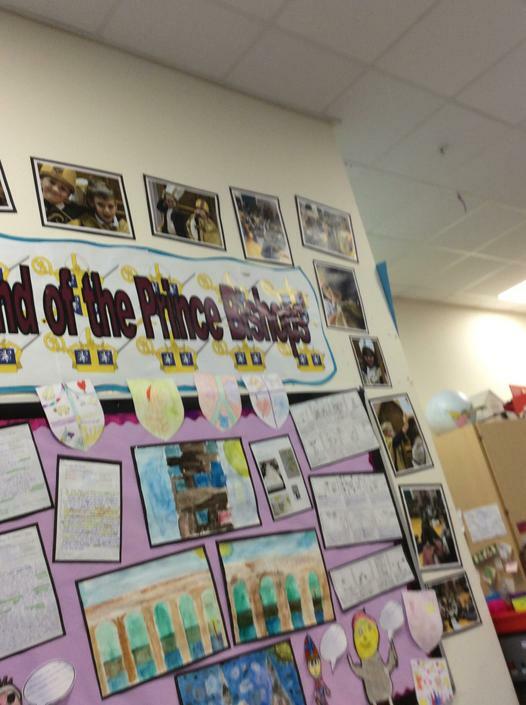 When Palace Green visited us in class. 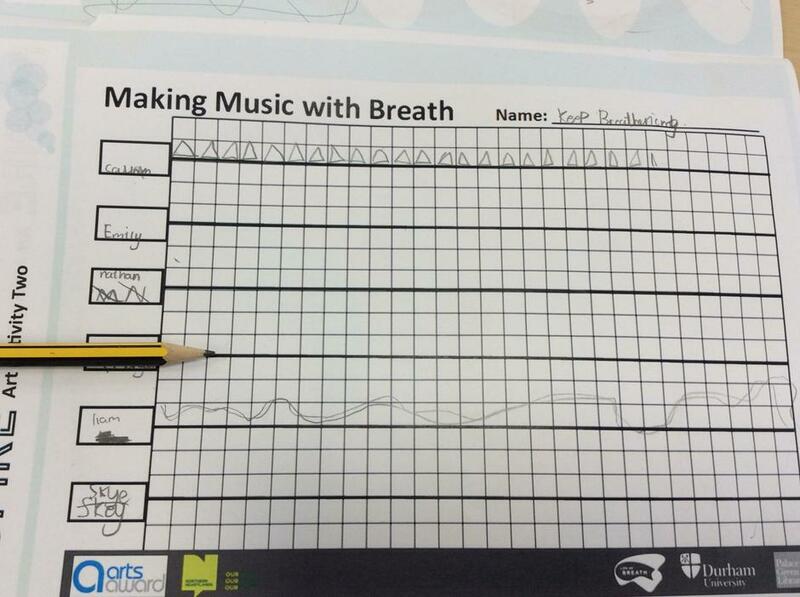 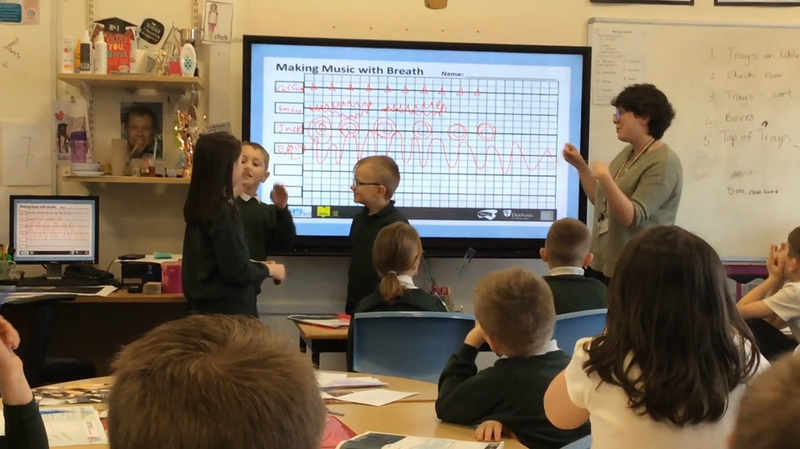 We made music with our breath and produced music as group which we recorded as music and performed in front of the rest of the class. 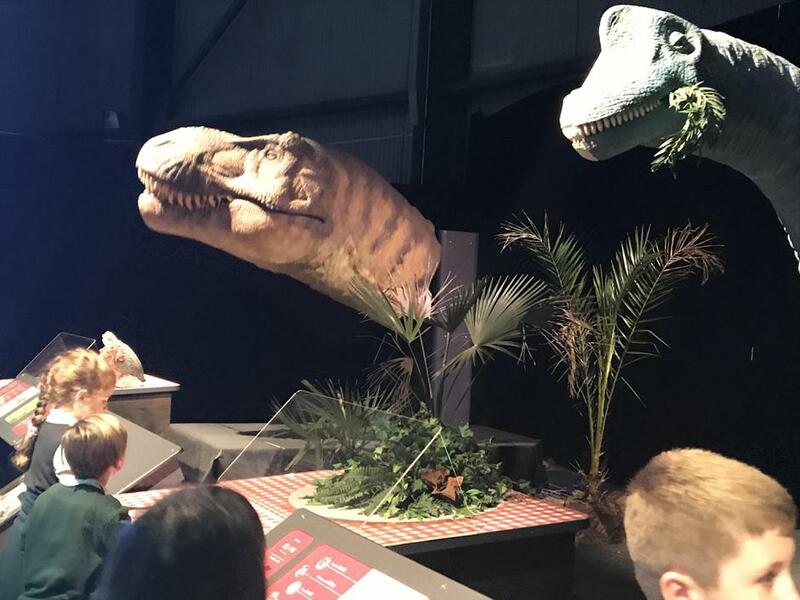 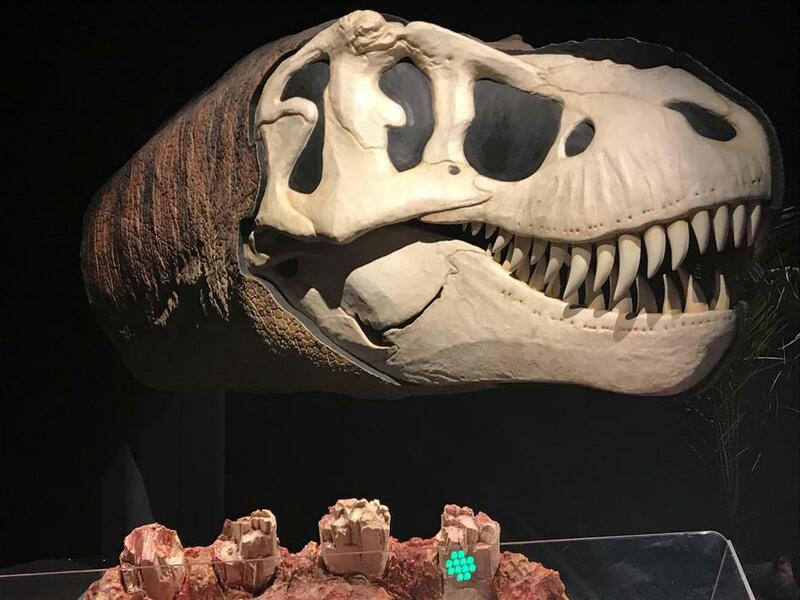 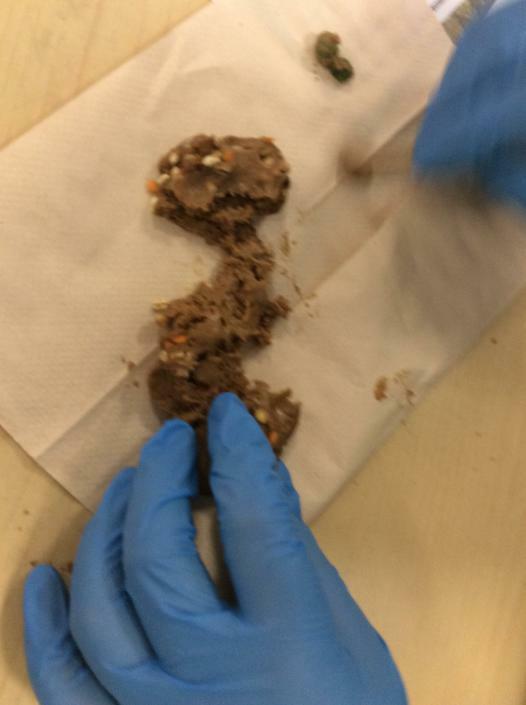 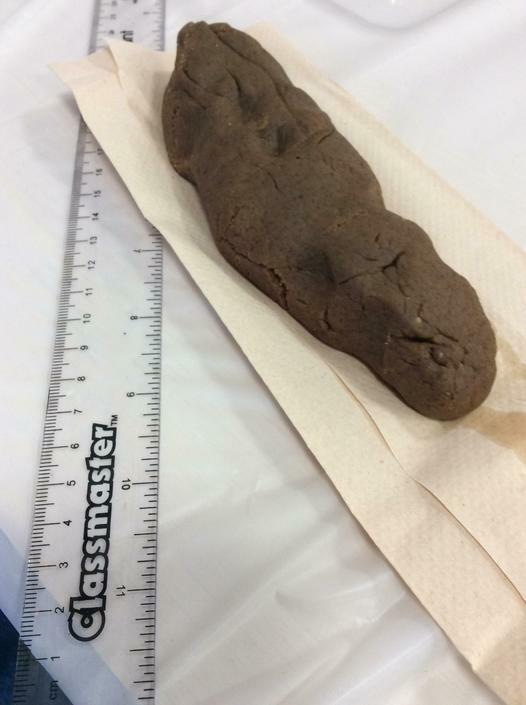 Do you know what coprolite is? 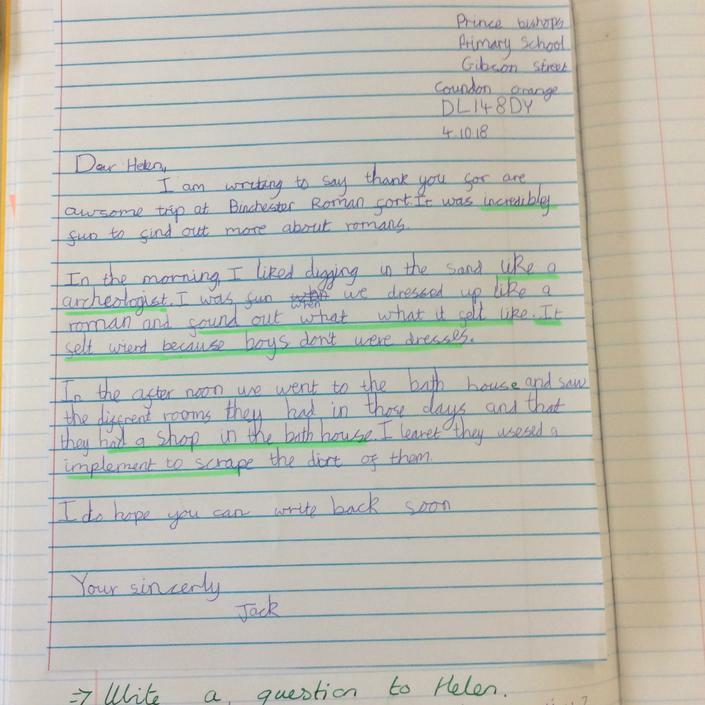 Mrs Freeman told us that she had a text message from Helen at Binchester Fort and she needed our help! 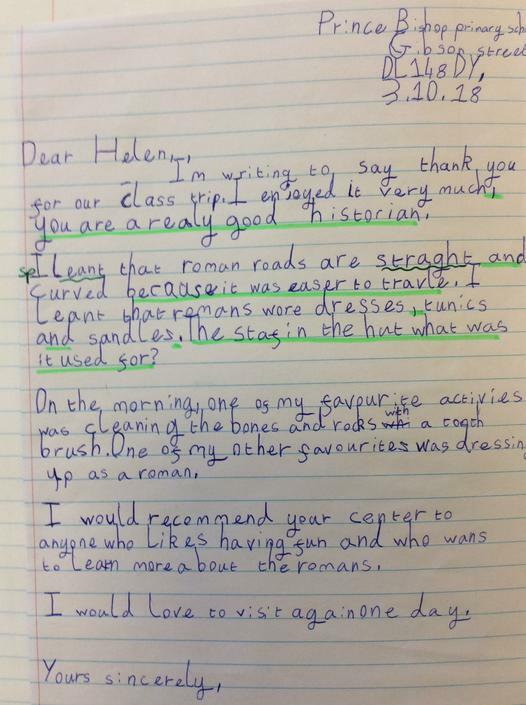 Helen set us the challenge to find out which site the archaeologists needed to dig to find more Roman remains. 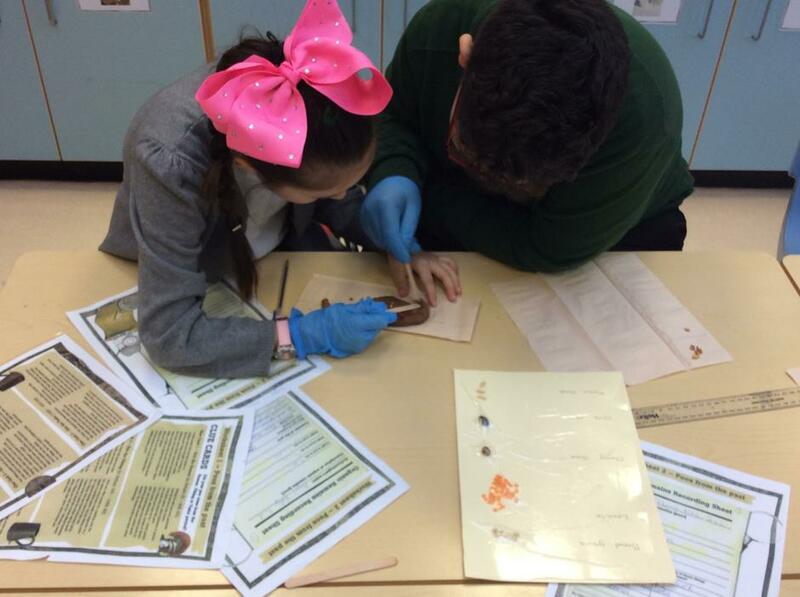 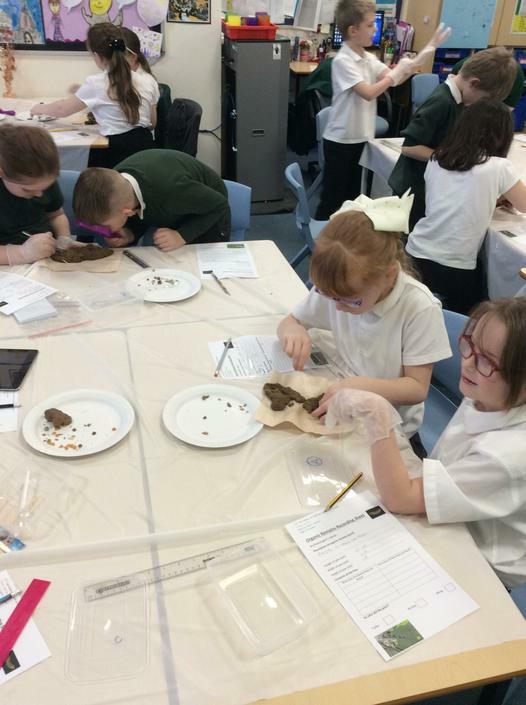 We needed to dissect coprolite that had been found at sites A, B and C. Then we needed to identify the organic remains and read clues to find out what the Romans ate. 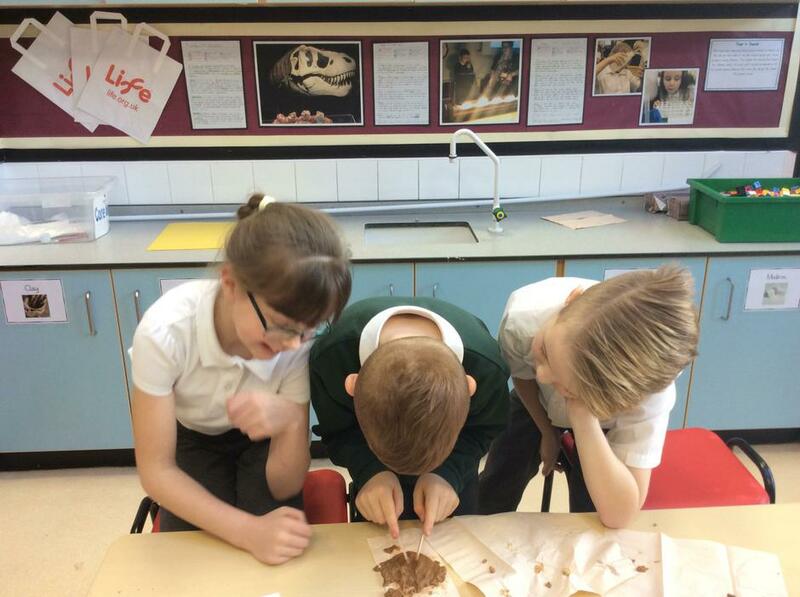 We found out that the coprolite came from 3 different periods in time Roman, Tudor and Viking. 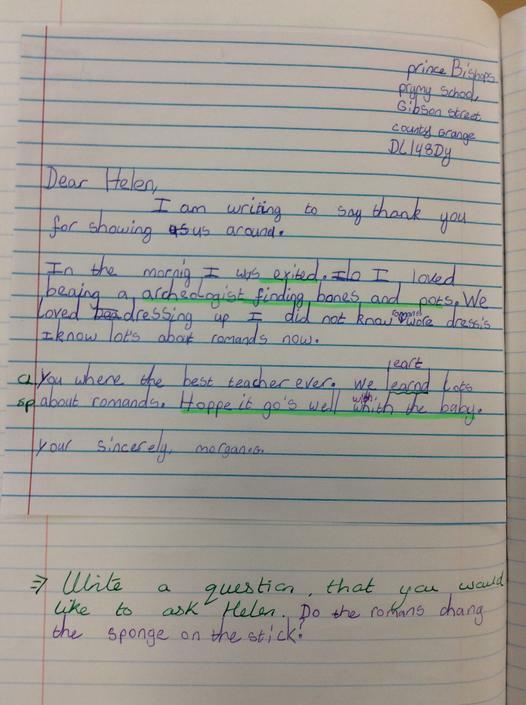 We wrote a letter to Helen explaining our findings and that the archaeologists needed to dig in site A. 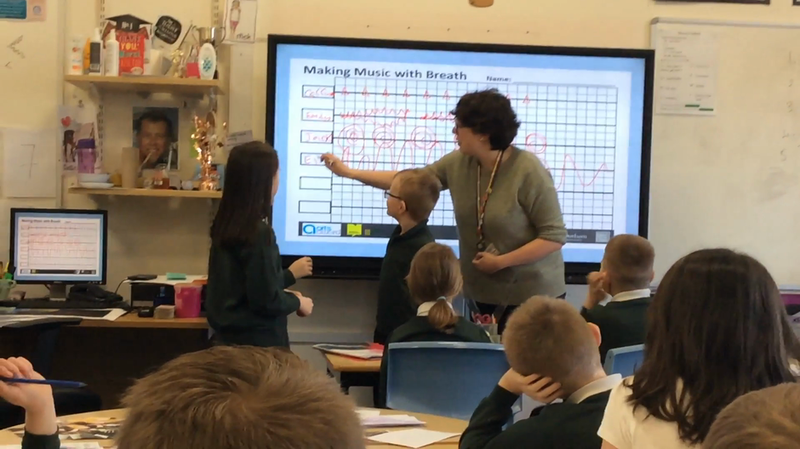 To begin the year we have been looking at the topic of sound, we have looked at how sound travels and how we hear sounds. 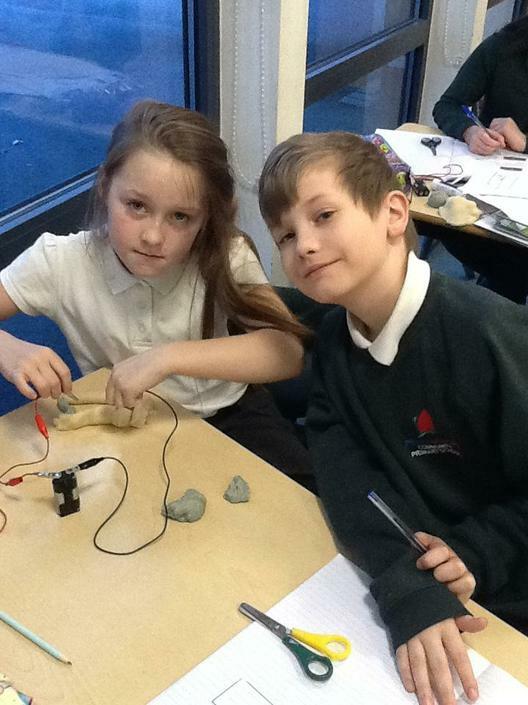 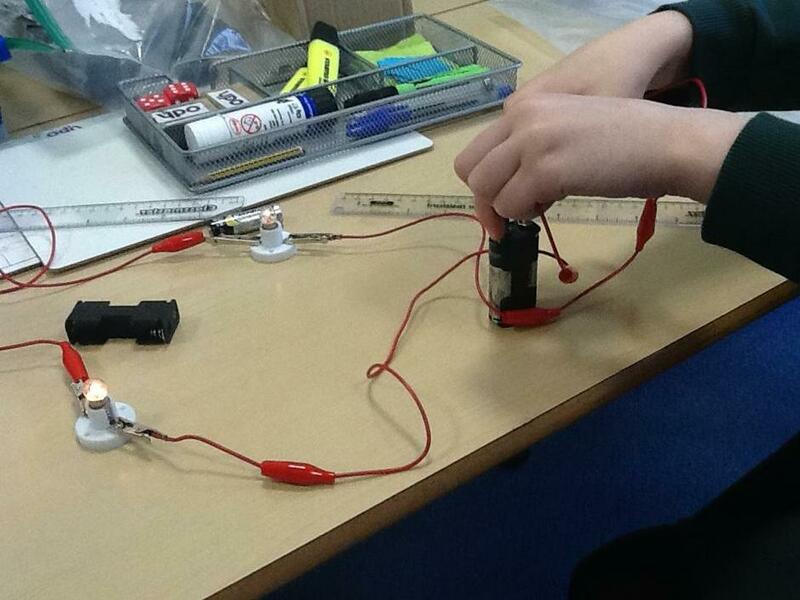 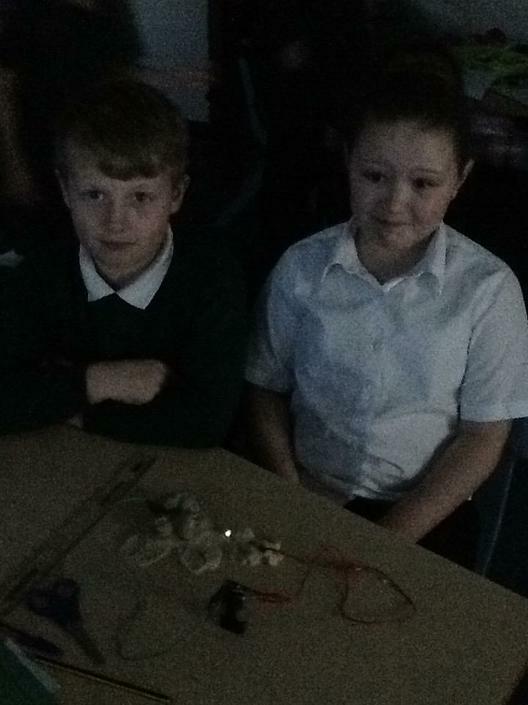 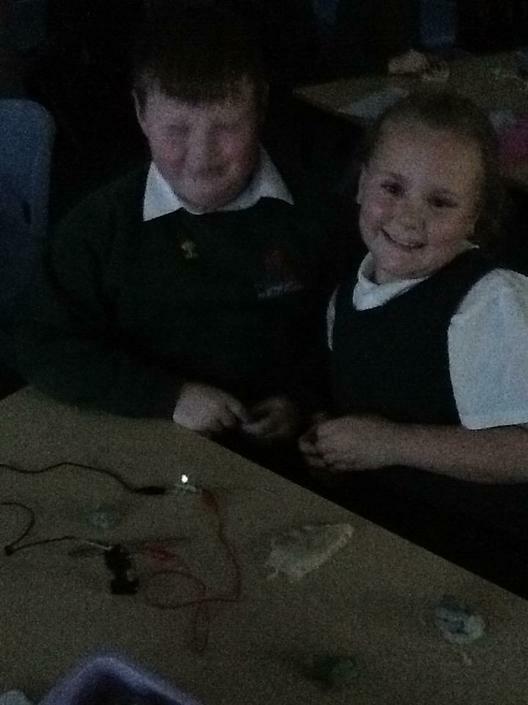 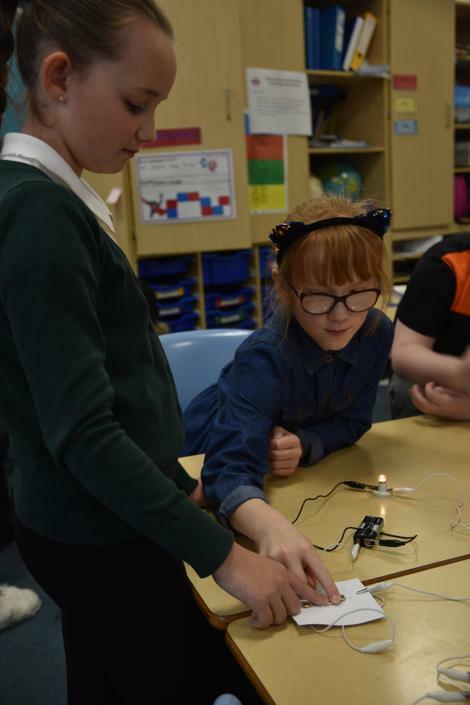 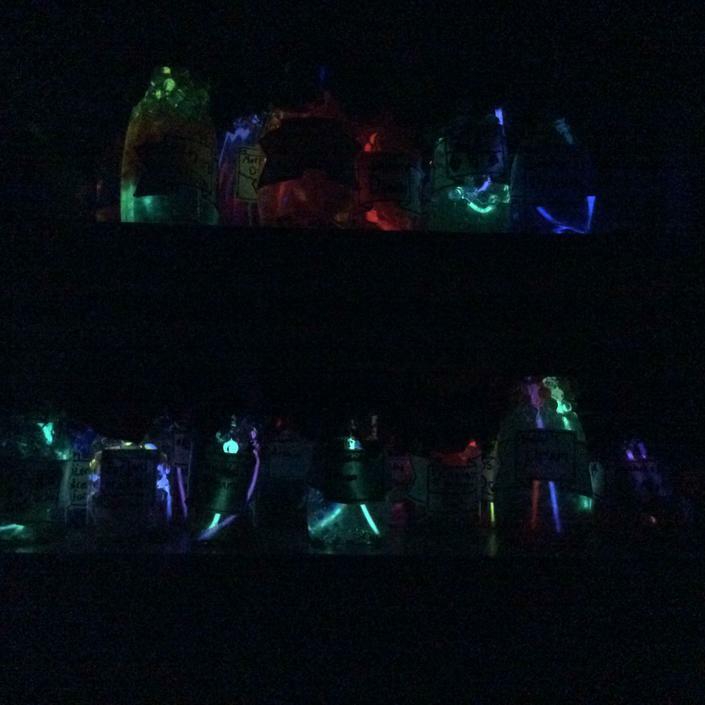 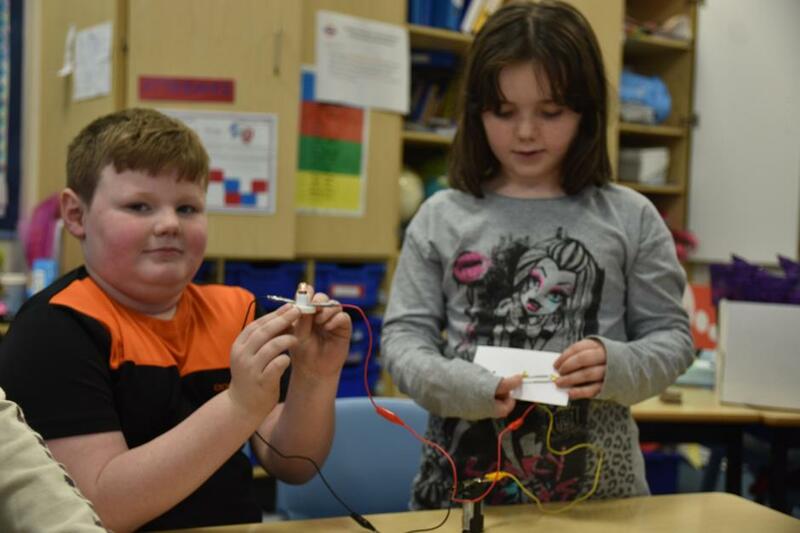 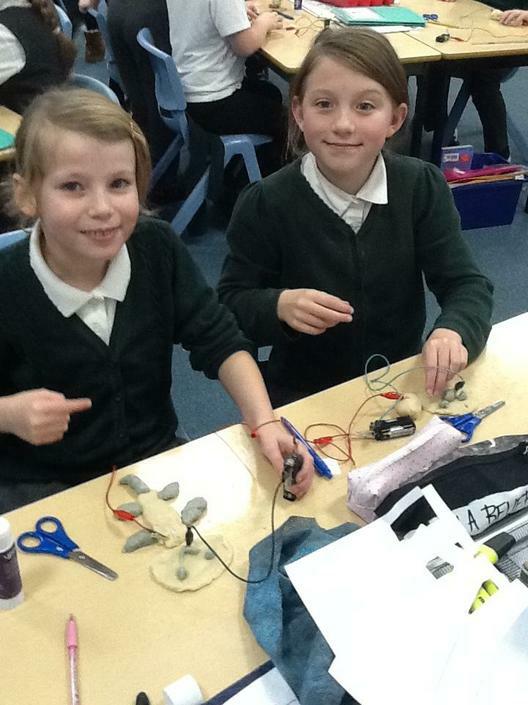 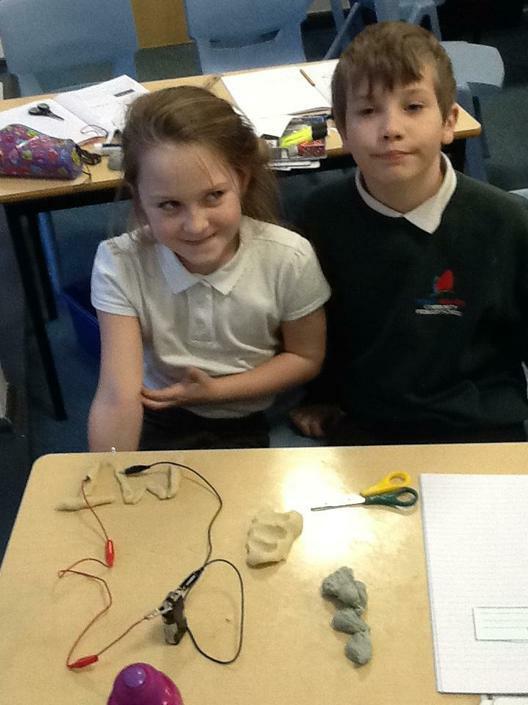 In science we have been learning how electricity is made, what life was like before electricity and where we use it. 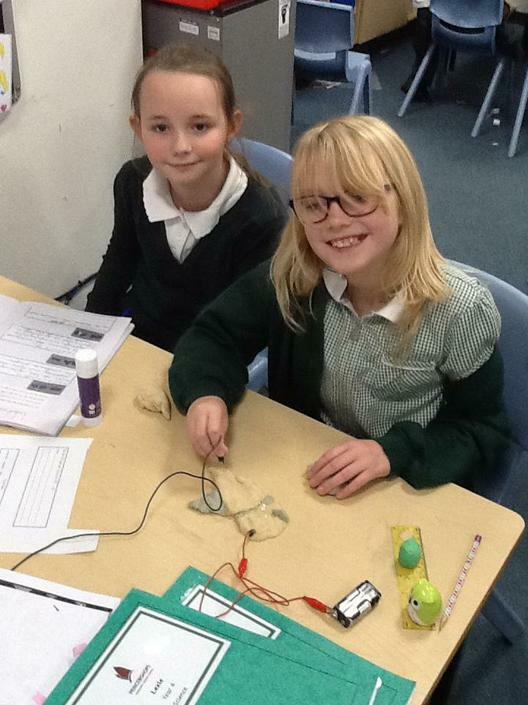 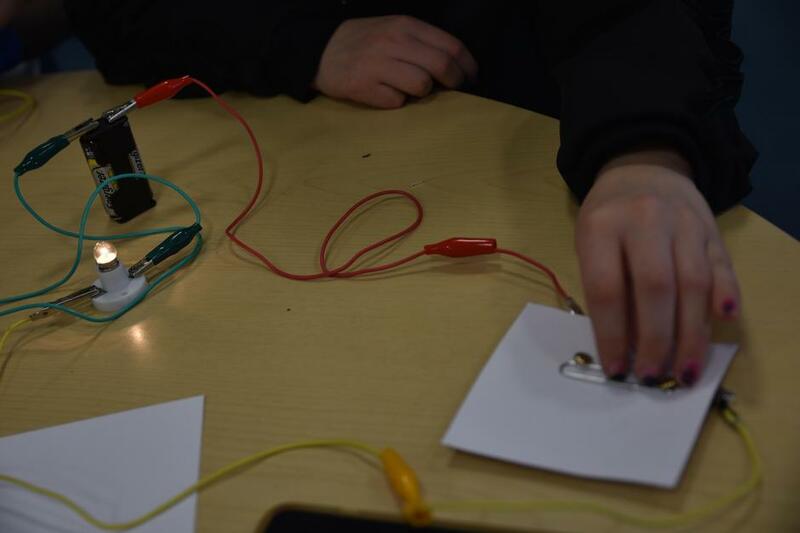 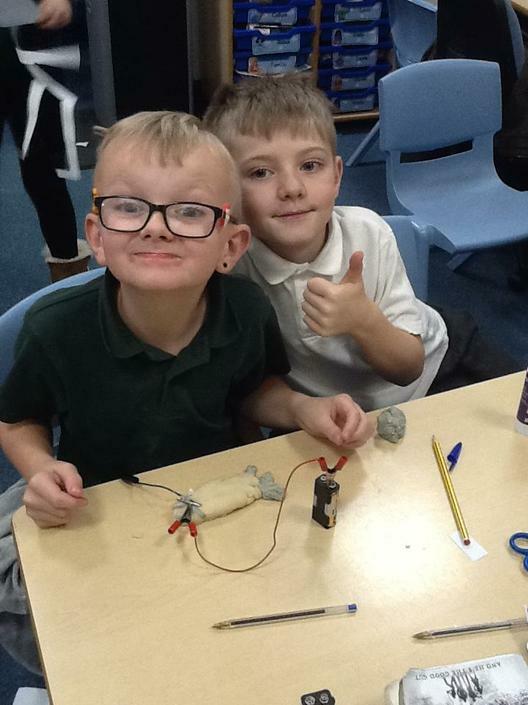 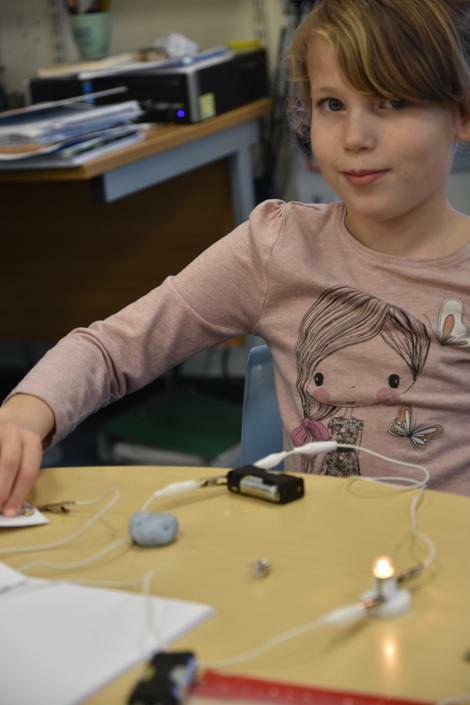 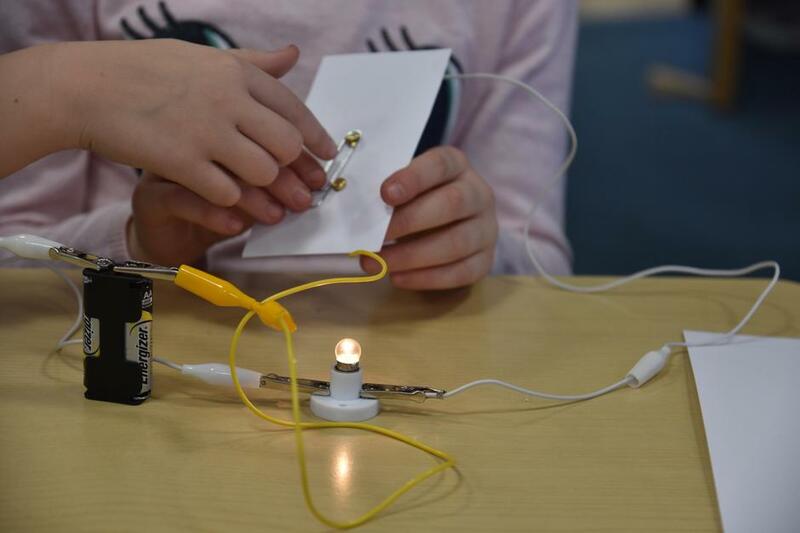 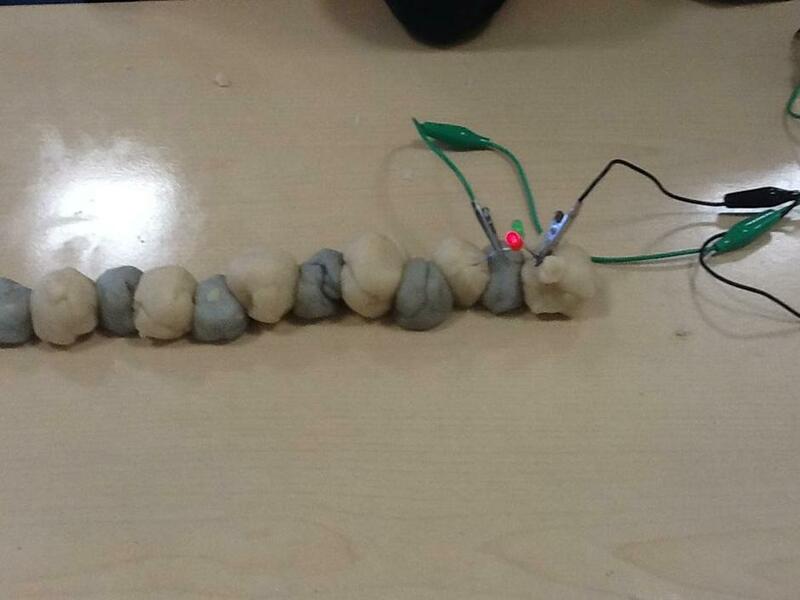 We have made circuits which light bulbs up, we have also made conductive play dough and insulating play dough, we have used these to make models that light up. 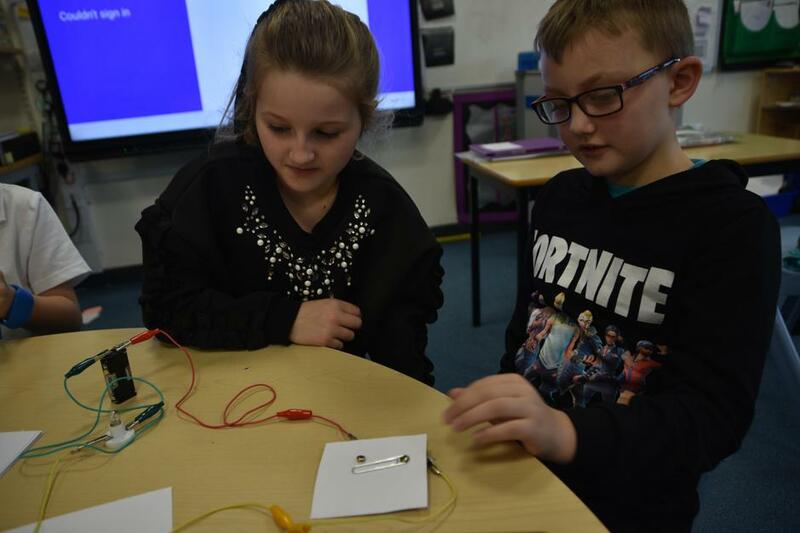 We investigated which materials were conductors and which were insulators, this helped us to decide which materials would be best suited to making a working switch. 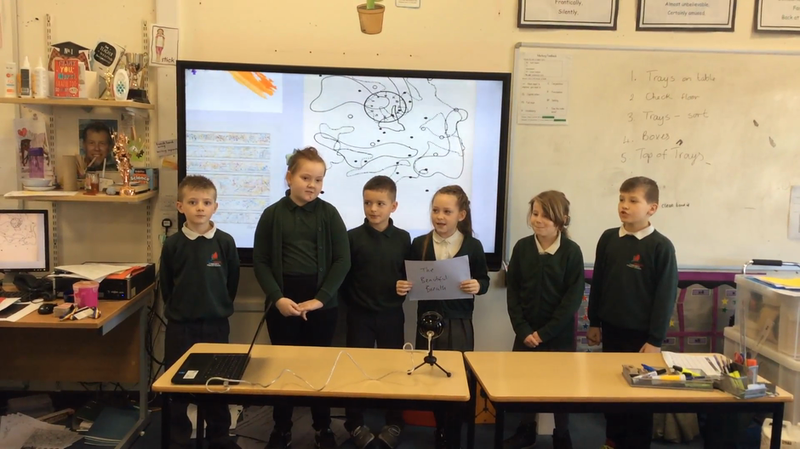 Our local history topic included learning about the Prince Bishops, who they were, what they did and how they were important to the local area. 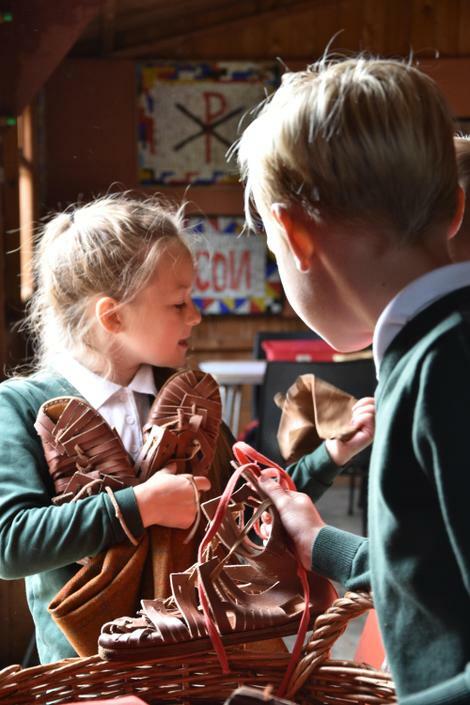 We were lucky enough to have visitors in school from The Auckland Trust and they told us many interesting facts and also the story of The Boar. 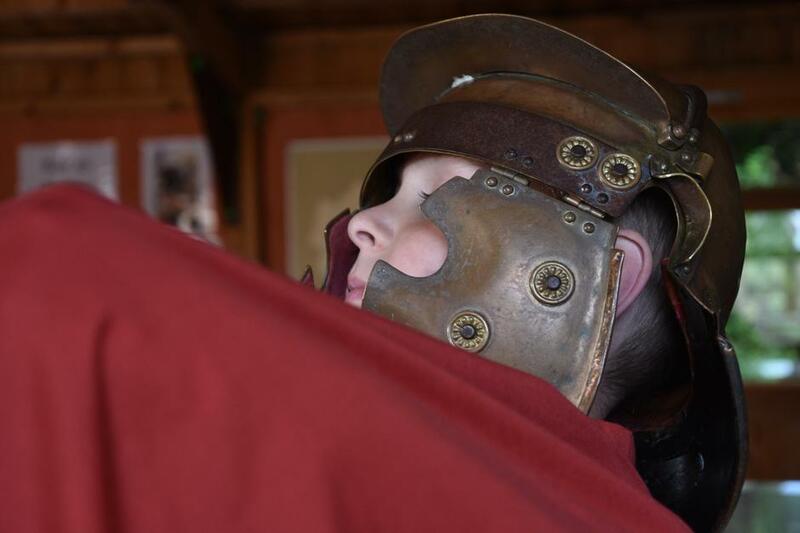 They also brought in artefacts which we were allowed to handle and costumes which we used to act out scenes from history. 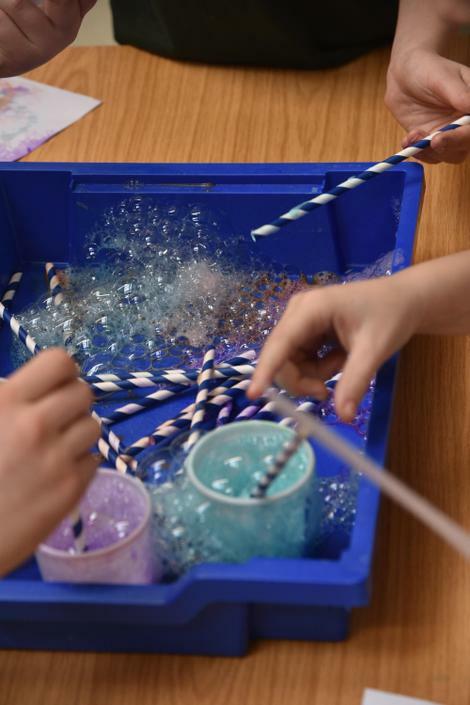 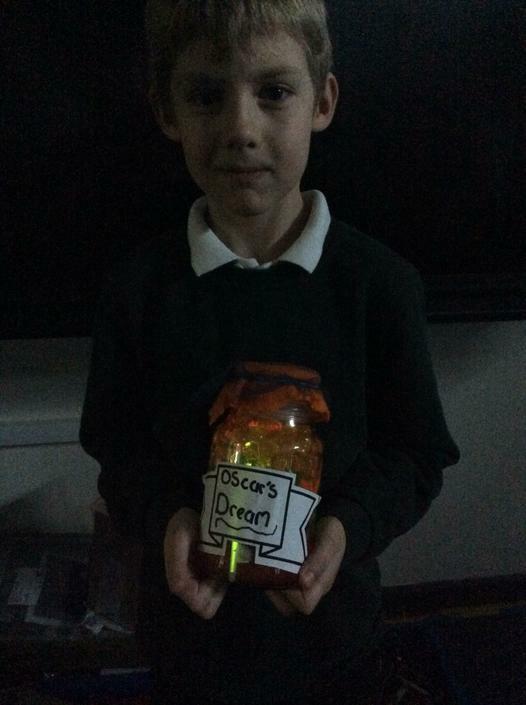 Our class novel this term has been The BFG by Roald Dahl, we have researched his amazing life, looked closely at the language he used and have really enjoyed making our own dream jars and writing about our dreams. 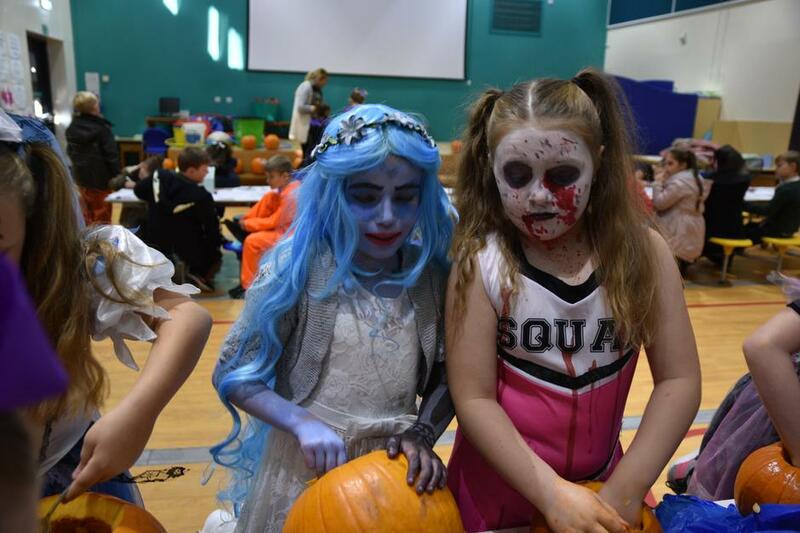 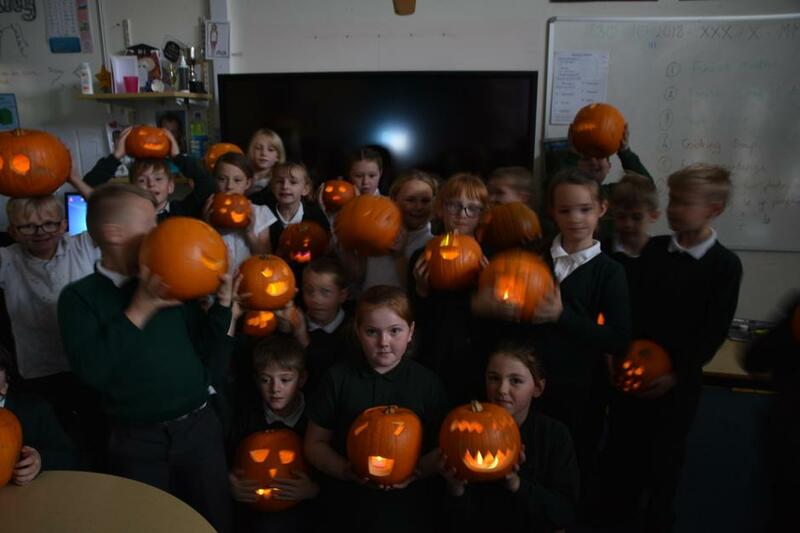 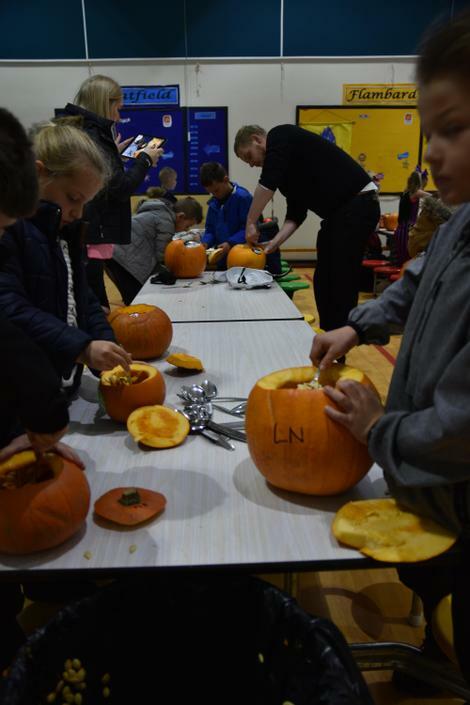 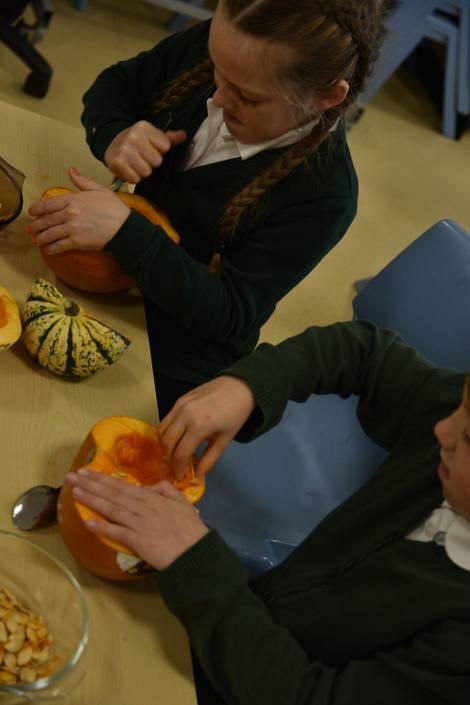 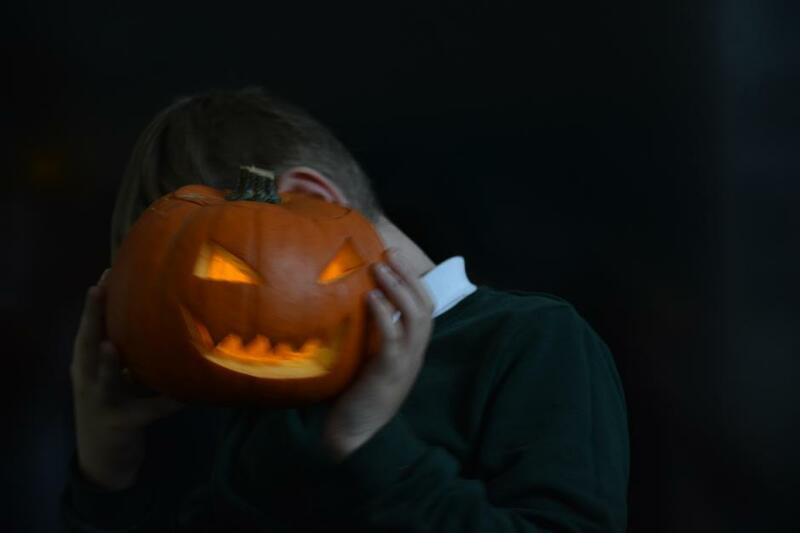 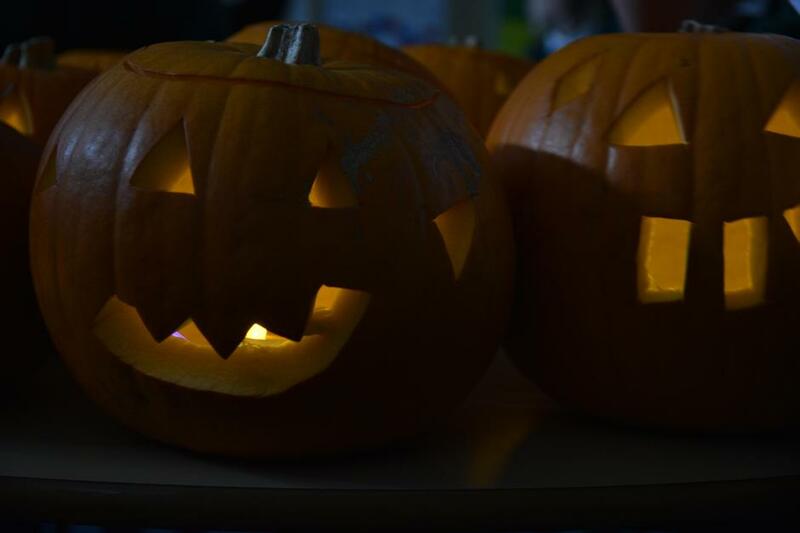 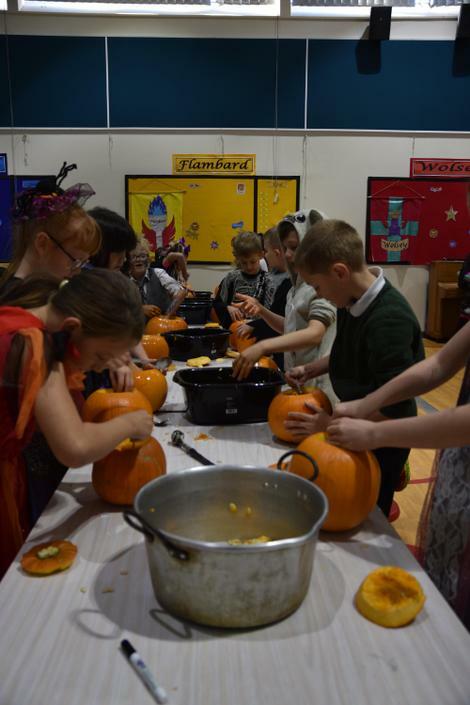 This year we carved pumpkins, made pumpkin soup, dressed up and looked into the history of Halloween and The Day of the Dead looking at similarities and differences. 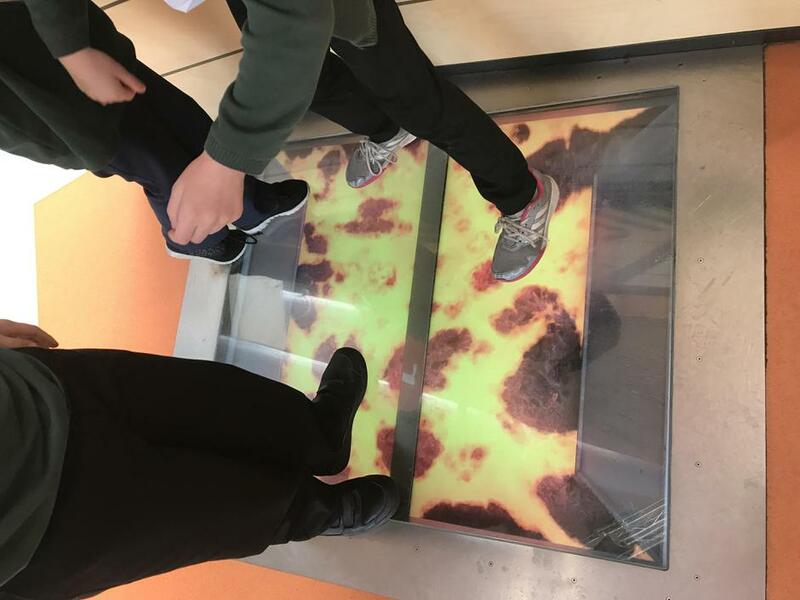 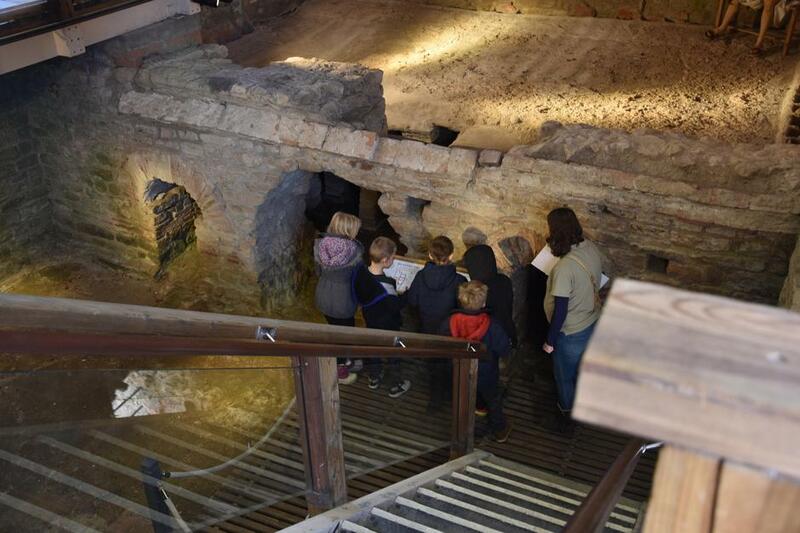 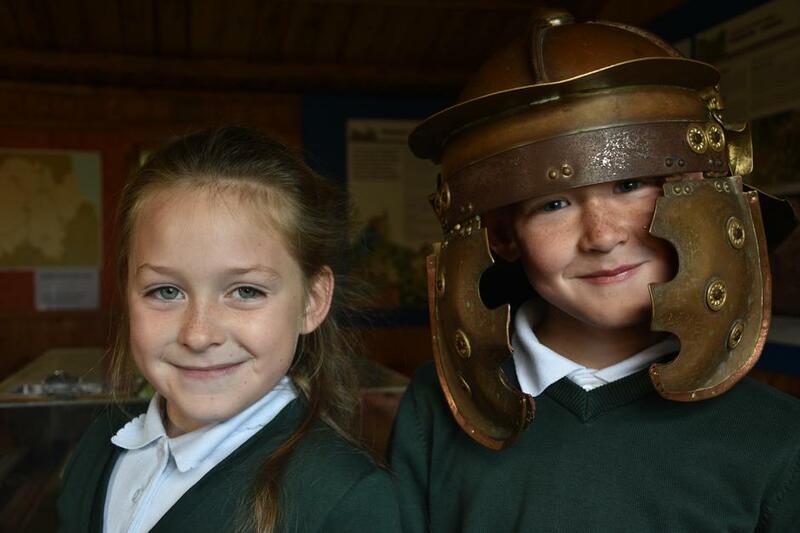 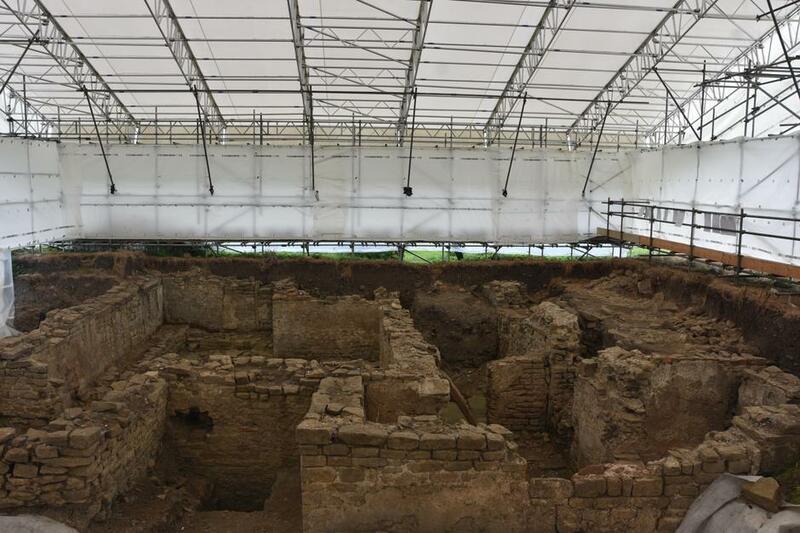 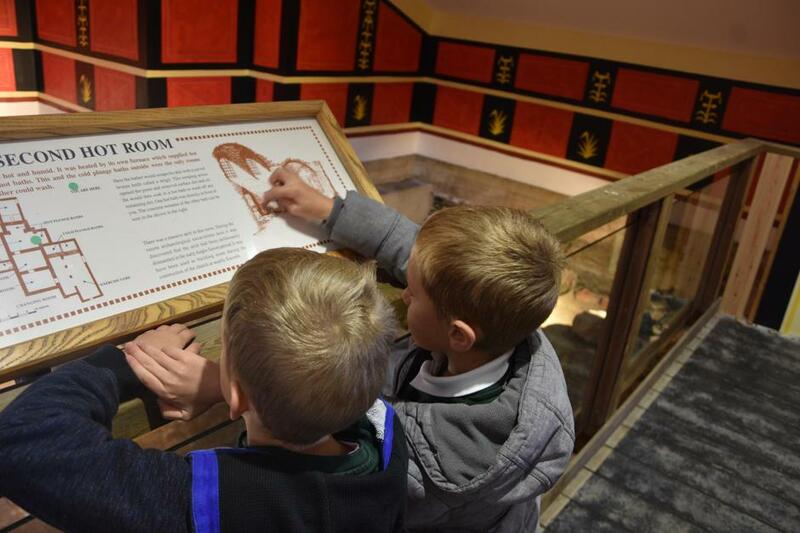 Class 4 had an invaluable trip to Binchester Roman Fort, we explored the roman baths where we discovered they had cold, warm and hot baths. 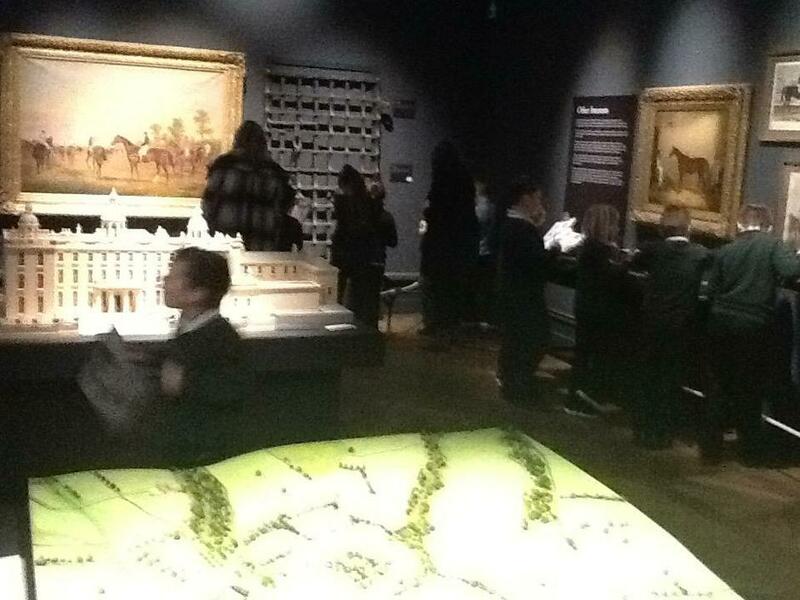 We also found out that there were over 1500 soldiers at Binchester each having 2 horses. 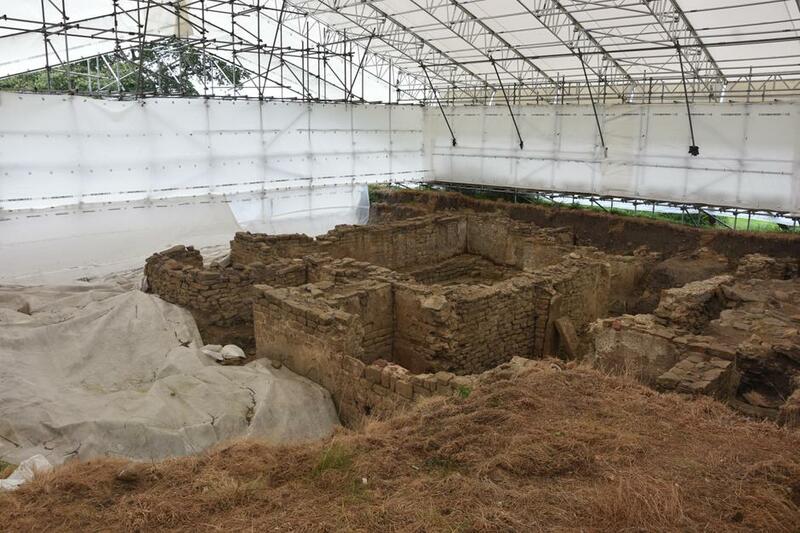 The fort would of been much larger than what we see today and was used by soldiers going to and coming from Hadrian's Wall. 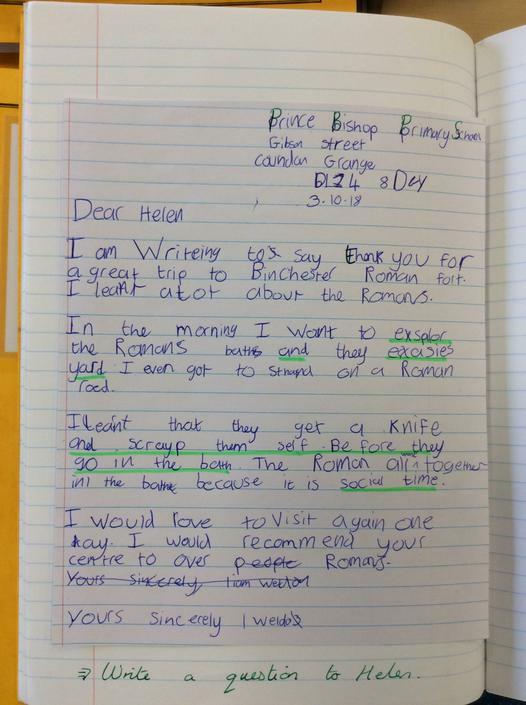 We wrote some thank you letters to Helen, the lady who showed us around Binchester, take a look. 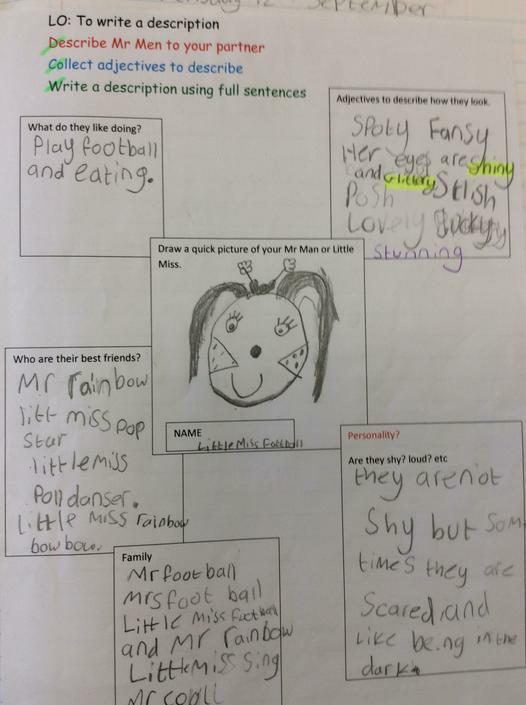 We created our own Mr Men and wrote descriptions. 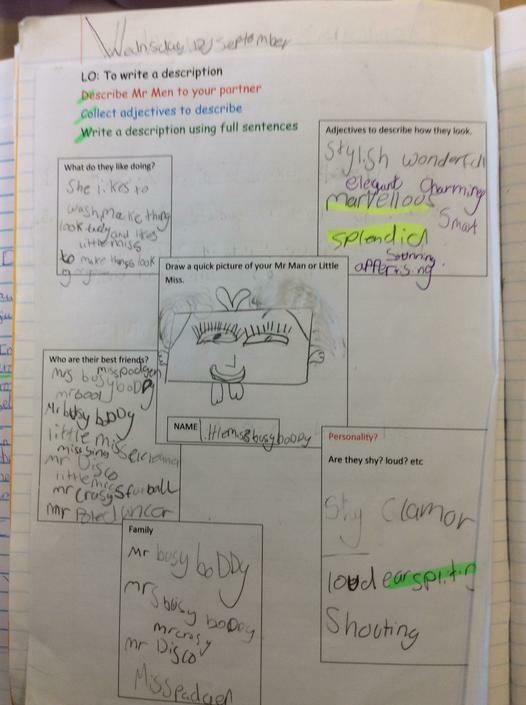 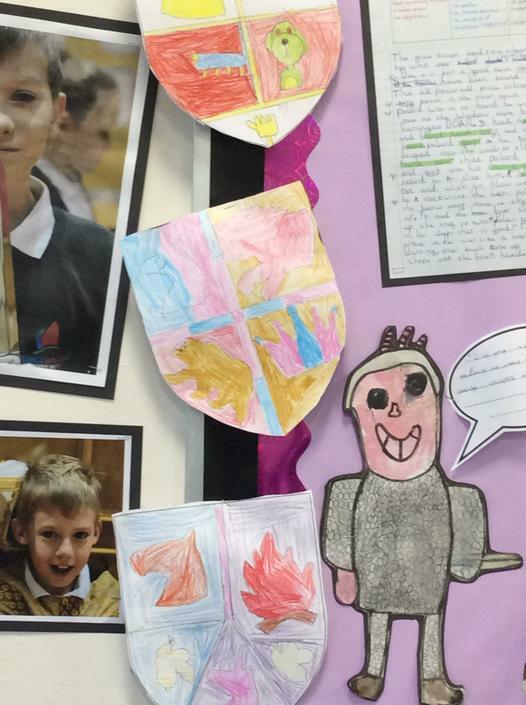 We have explored the characters of the Mr Men book series and have created our own. 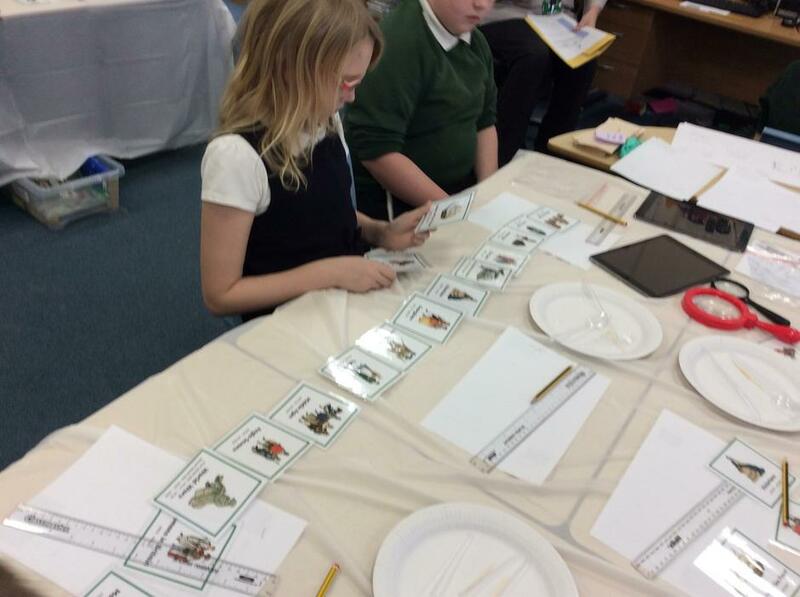 We also looked at the use of speech in story writing and used descriptive devices. 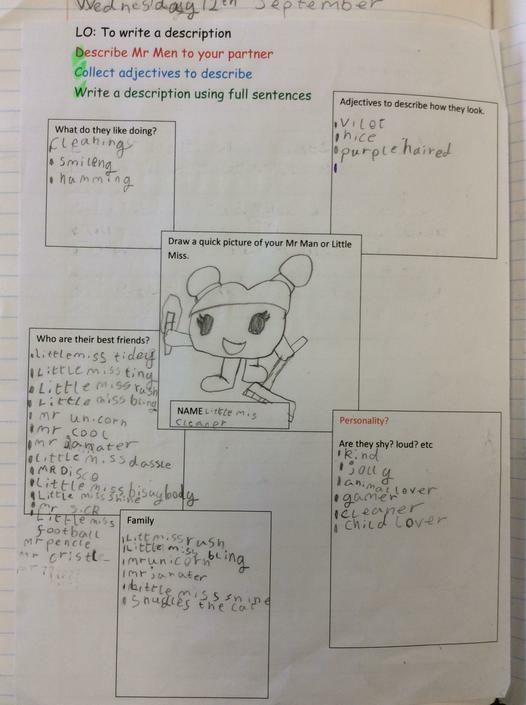 We are now moving on to instructional writing where we will be reading, exploring and writing instructions. 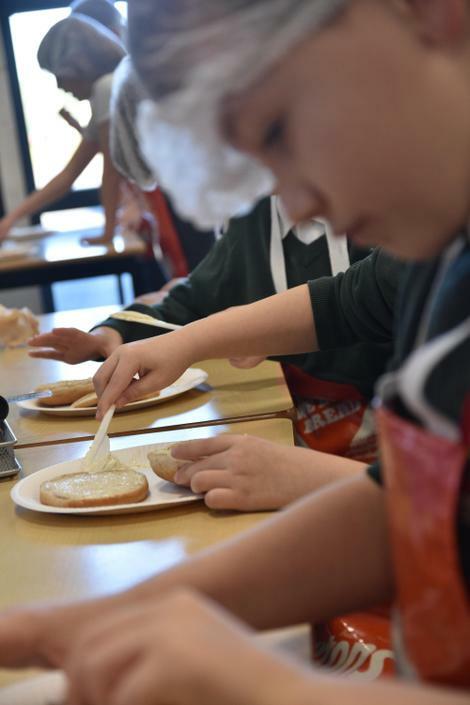 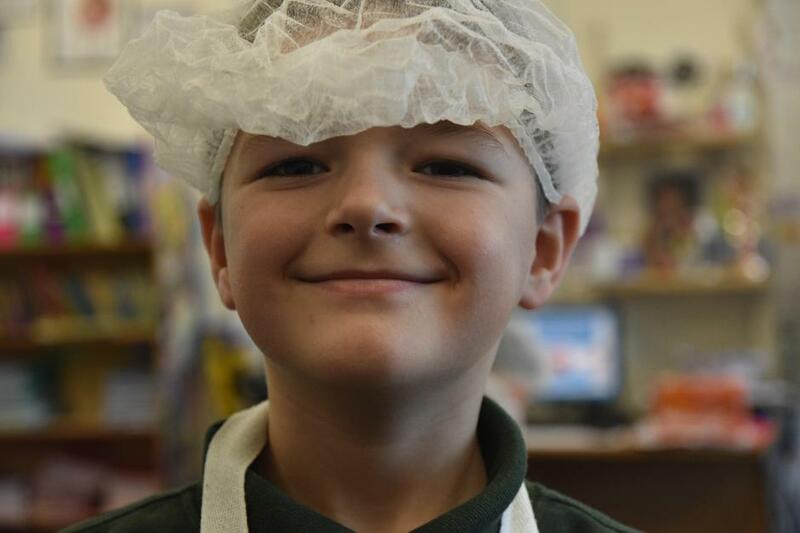 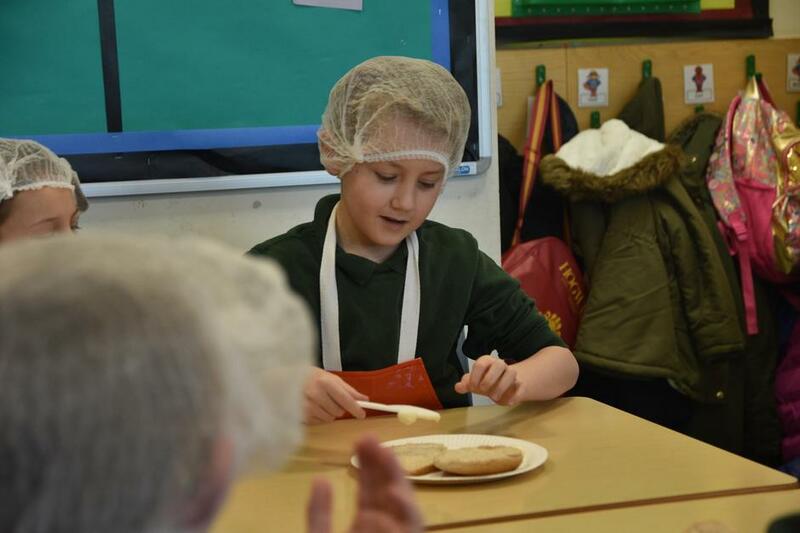 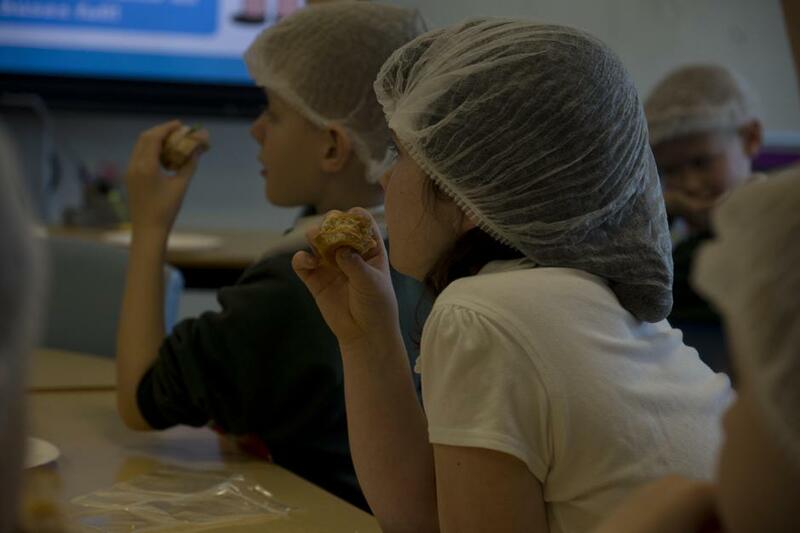 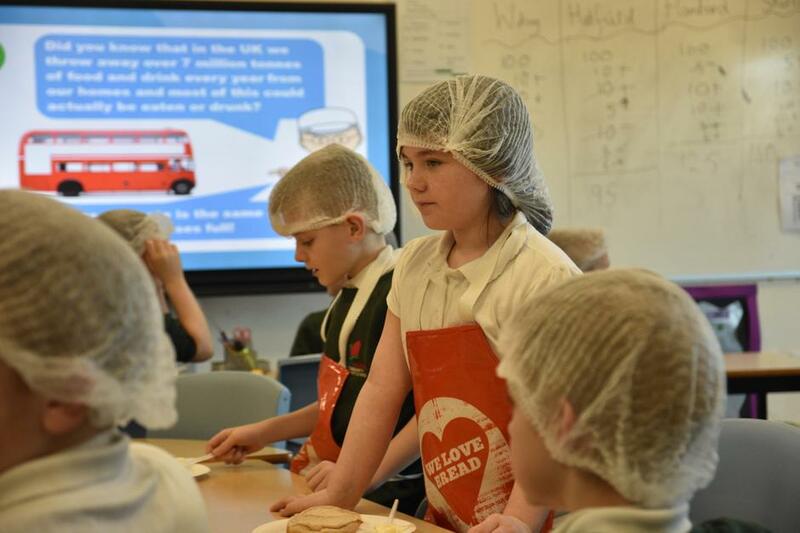 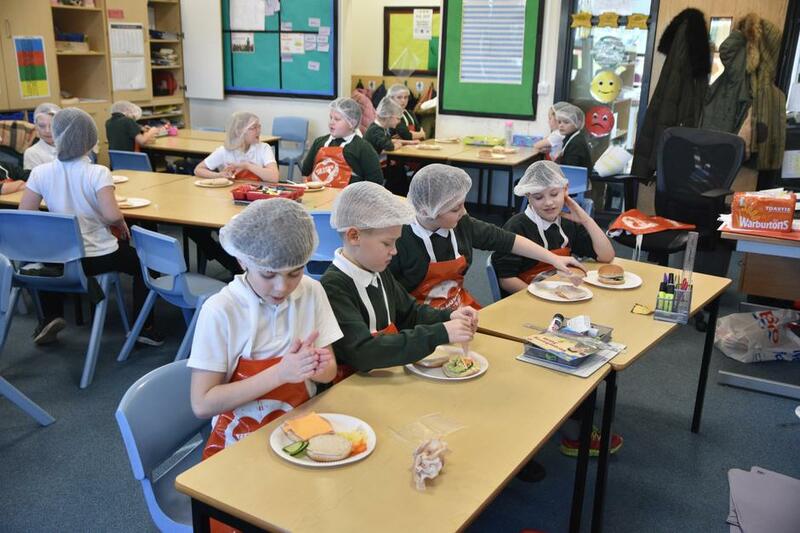 Children will be creating their own short video giving instructions to a younger audience on how to make the perfect sandwich. 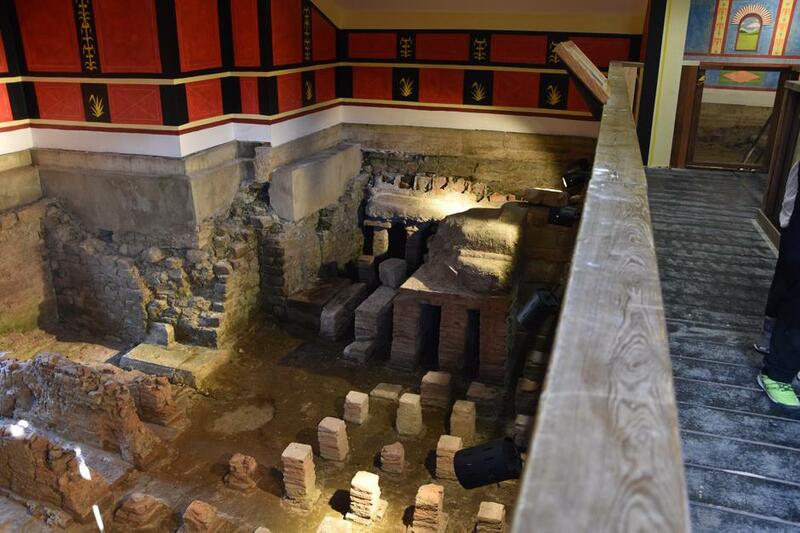 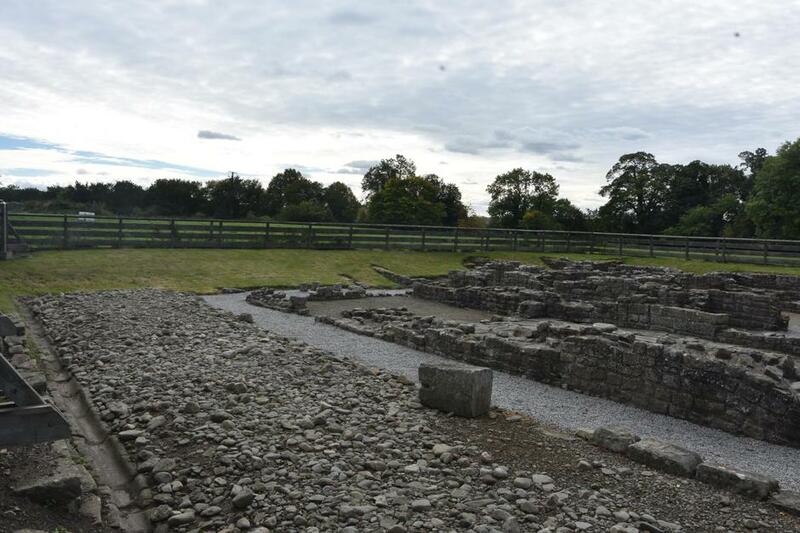 We have an exciting trip to Binchester Roman Fort coming up on the 1st of October, keep checking back for photographs. 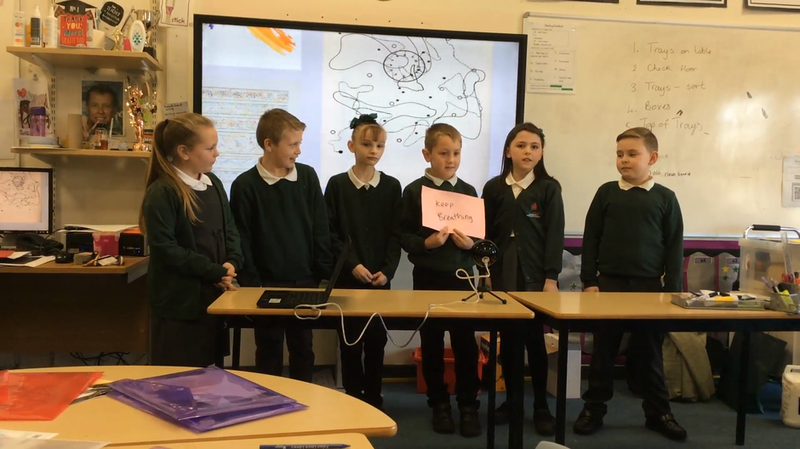 I am really lucky to be working in Year 4 again this year, I have been teaching for over 20 years and feel privileged to be teaching in this year group again. 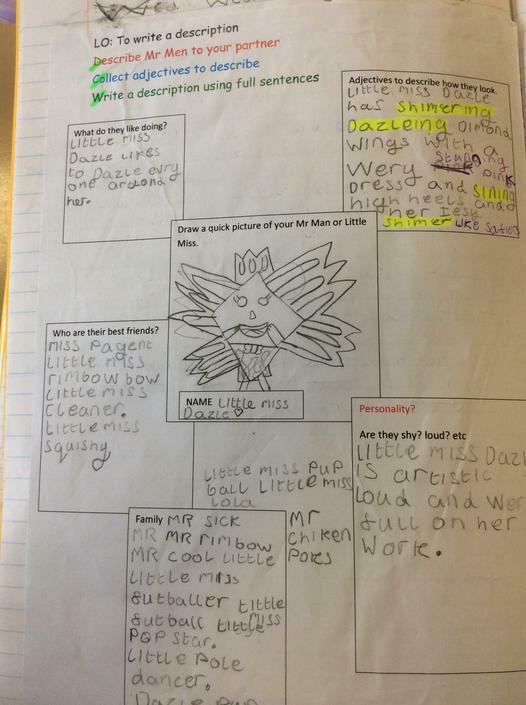 Mrs Freeman. 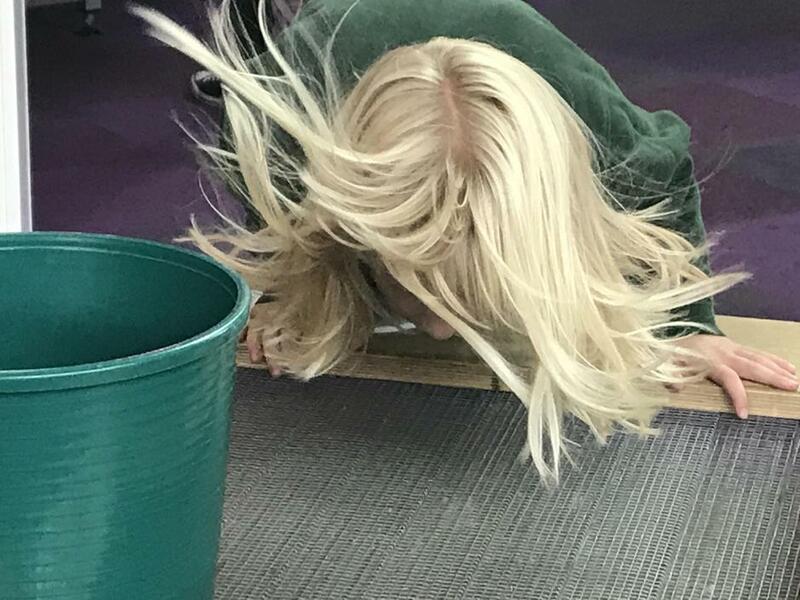 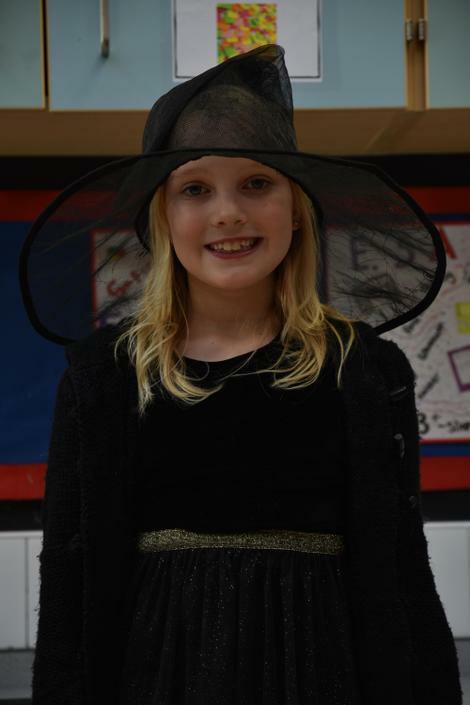 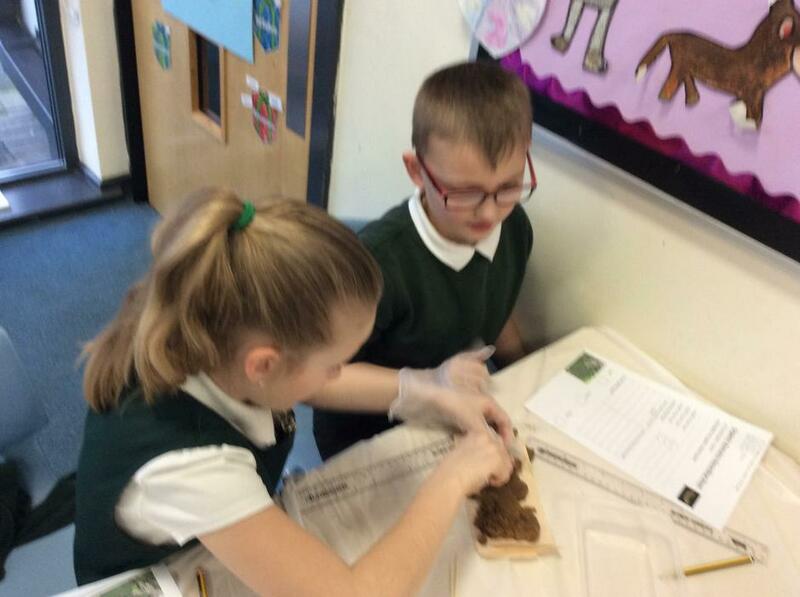 We are also very lucky to have Miss Gales working with us full time in Year 4, Miss Gales is an experienced teaching assistant who has spent time in both Year 5 and Year 6 in previous years. 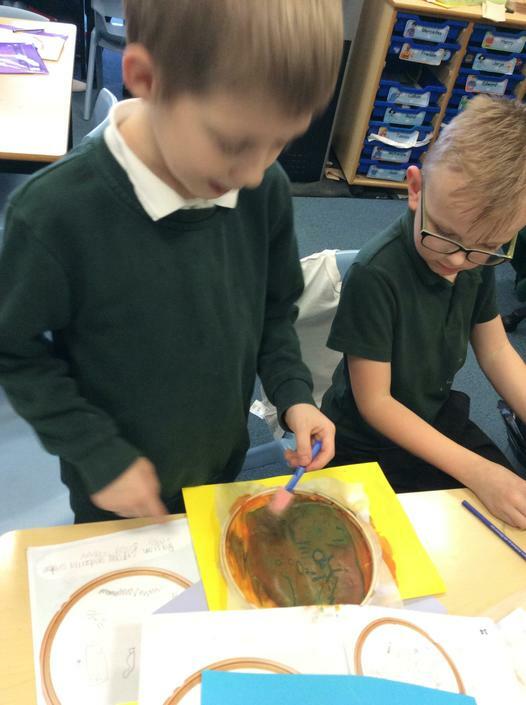 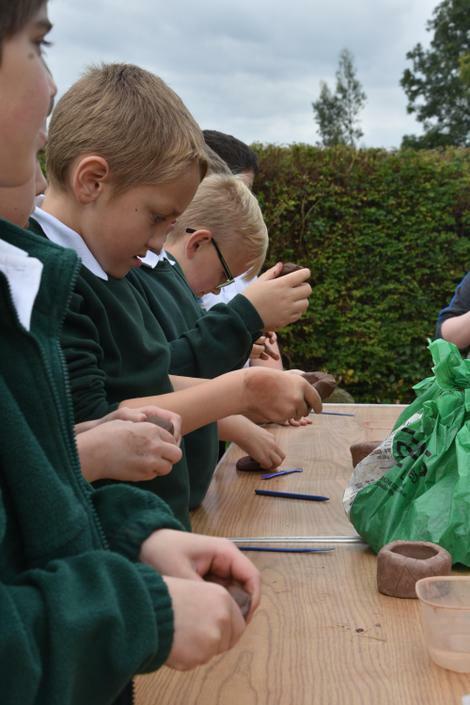 We have designed our own dragon eye, we then made them out of clay. 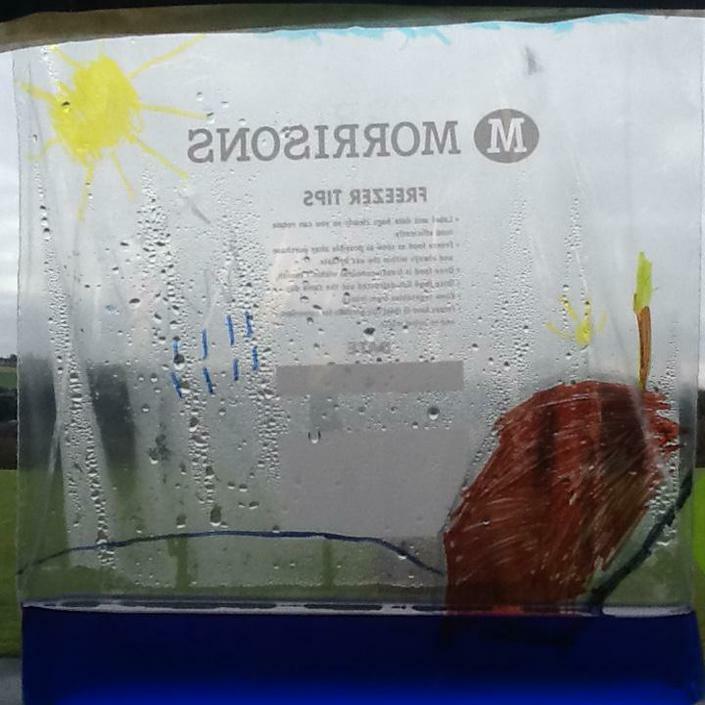 Summer Term in class 4 started with a surprise package being delivered. 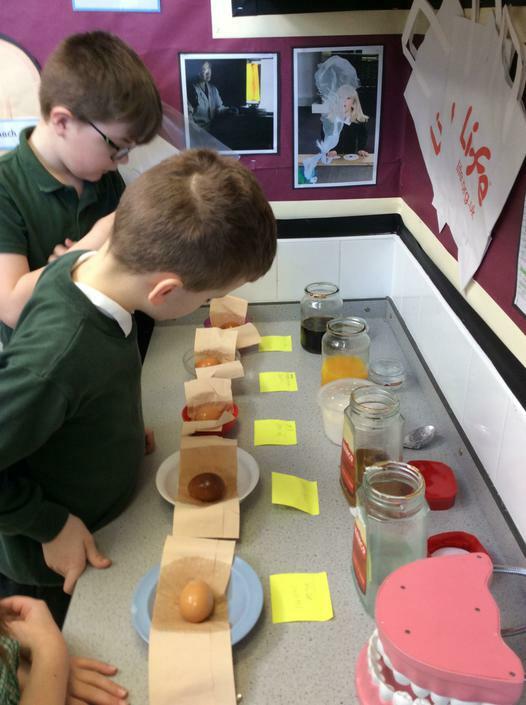 When opened we had the shock of our lives, 3 golden eggs. 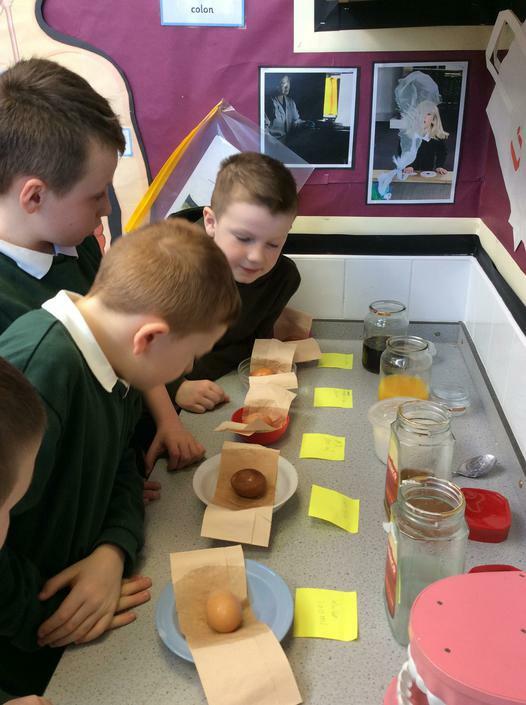 We think they are dragon eggs. 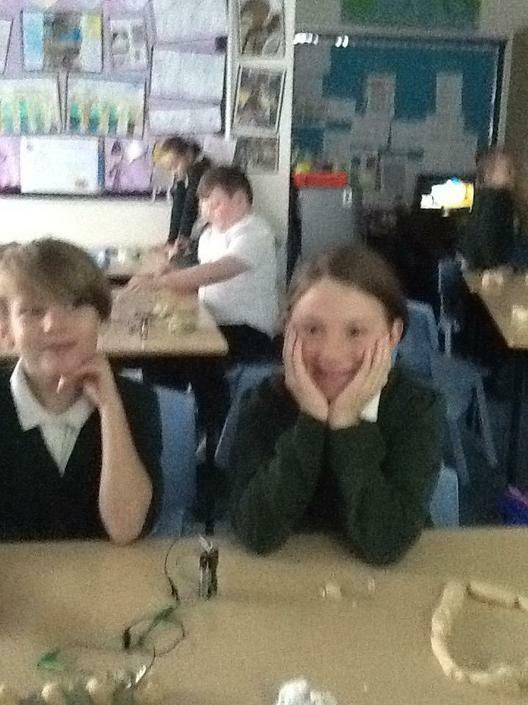 We have been looking at pneumatic systems and how they make things move. 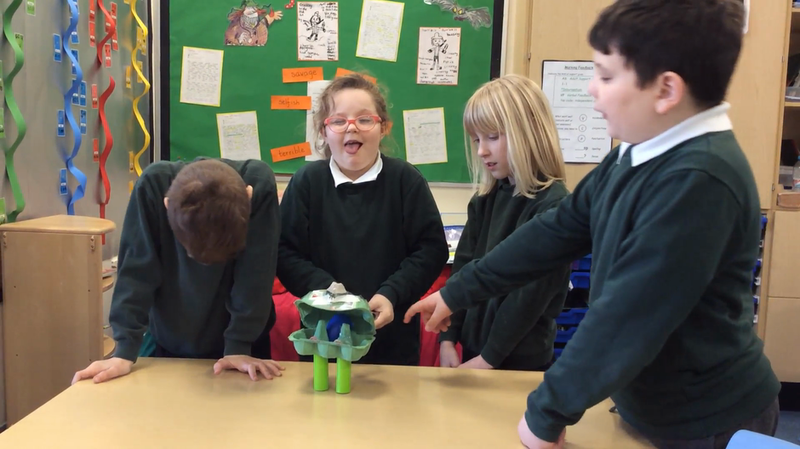 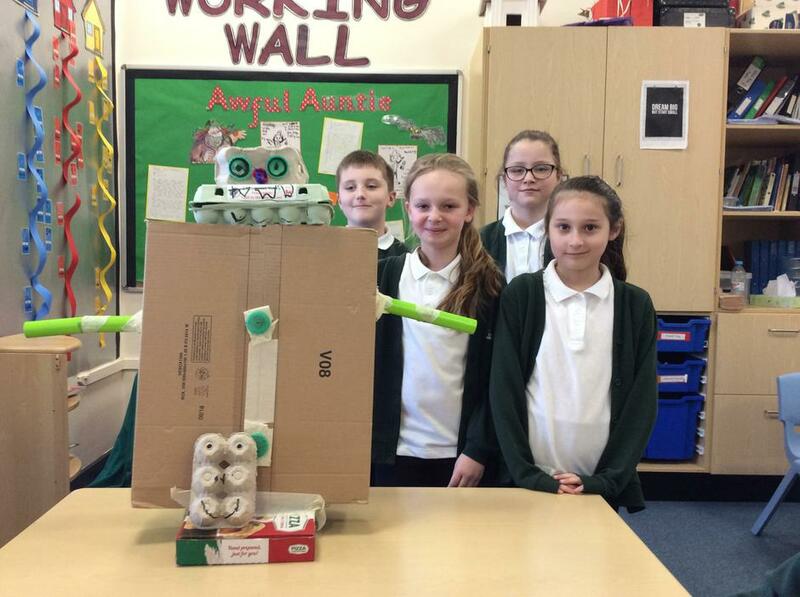 We explored different uses of pneumatic devices, we then designed our very own moving monsters. 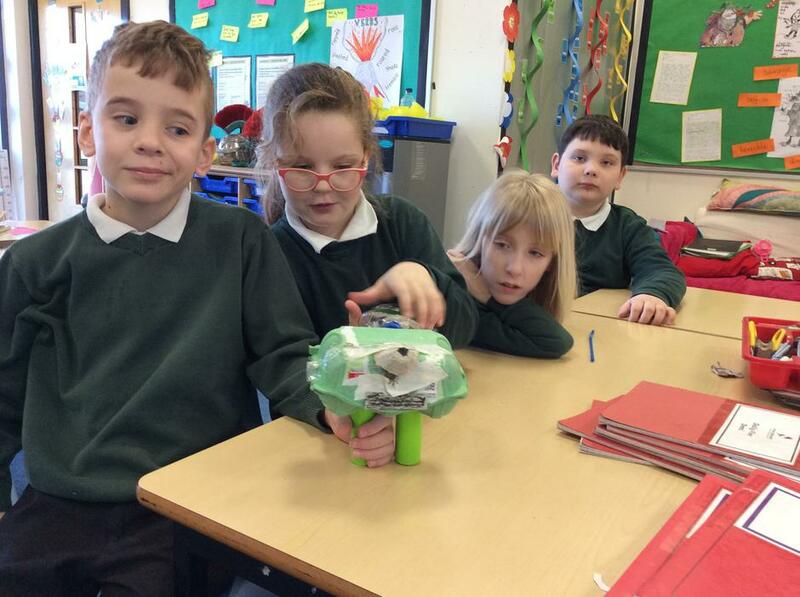 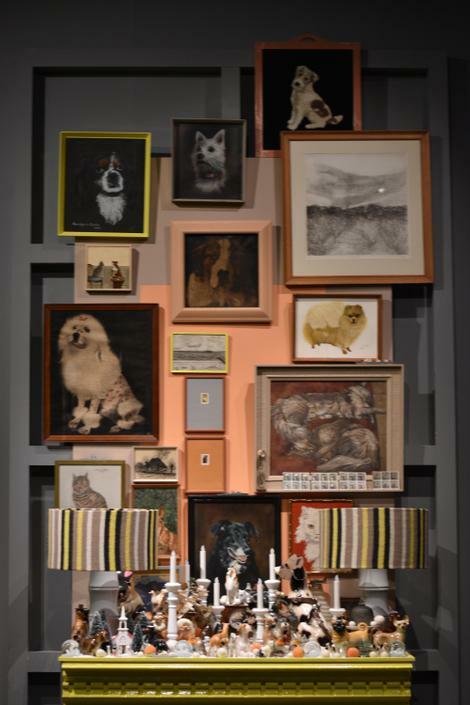 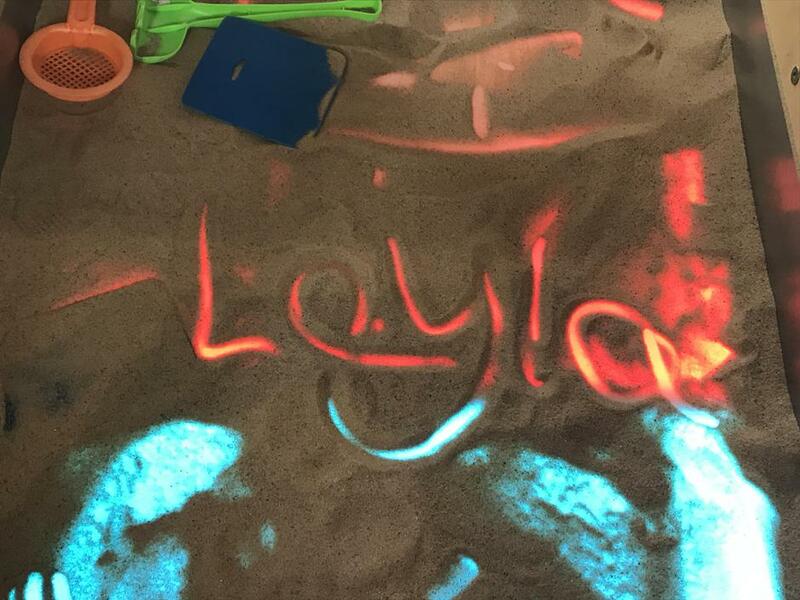 Come and have a look at our creations. 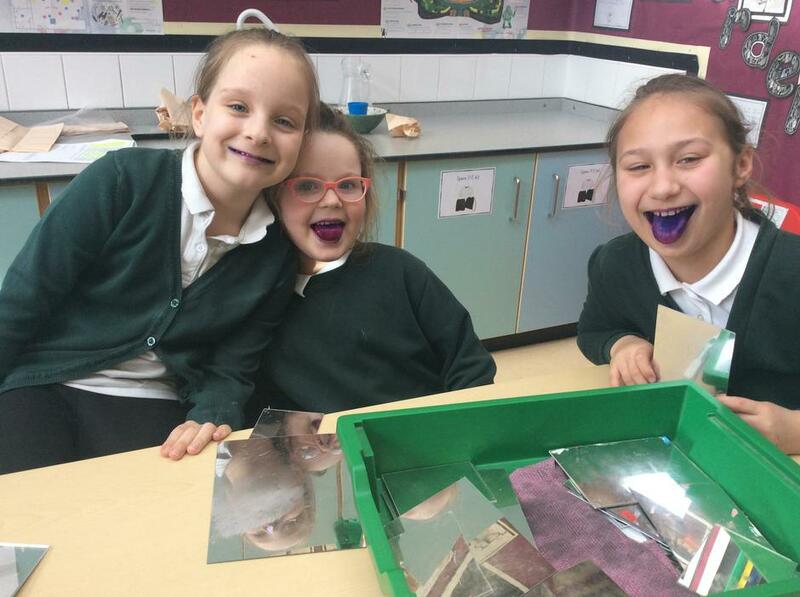 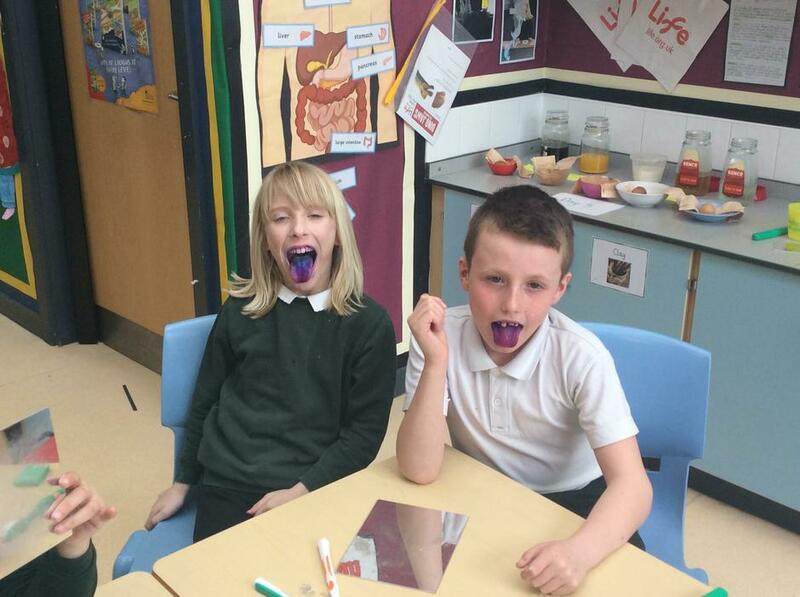 We have been looking closely at our teeth and how to keep them healthy. 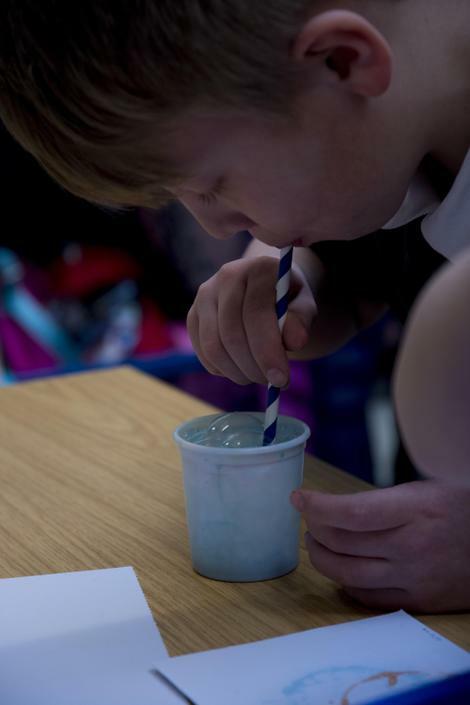 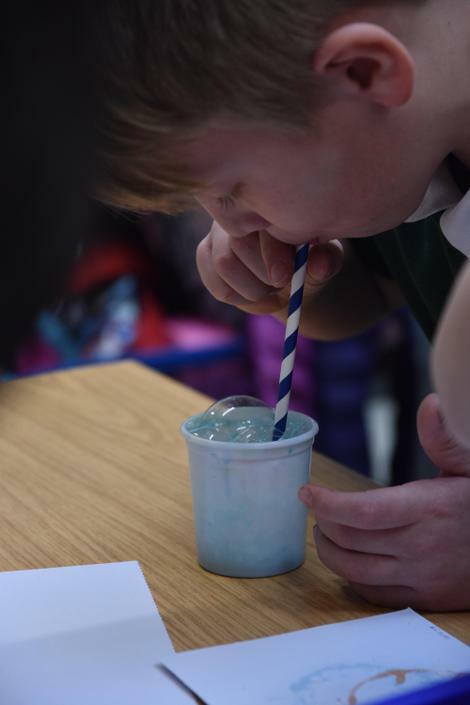 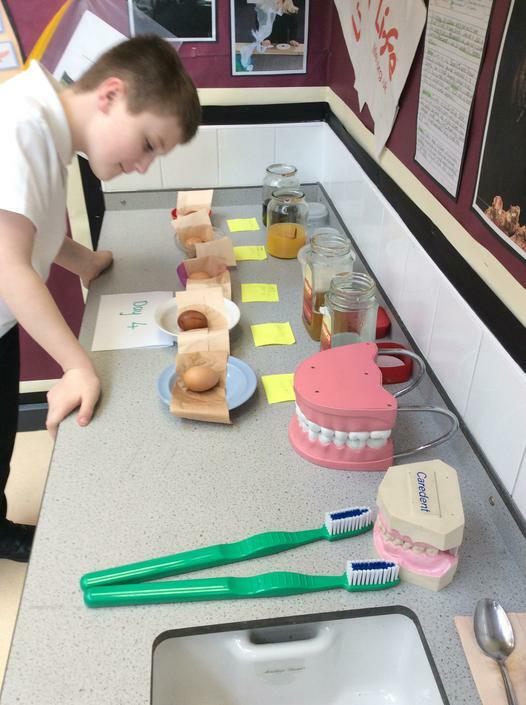 We came up with the question - What drinks are best for our teeth? 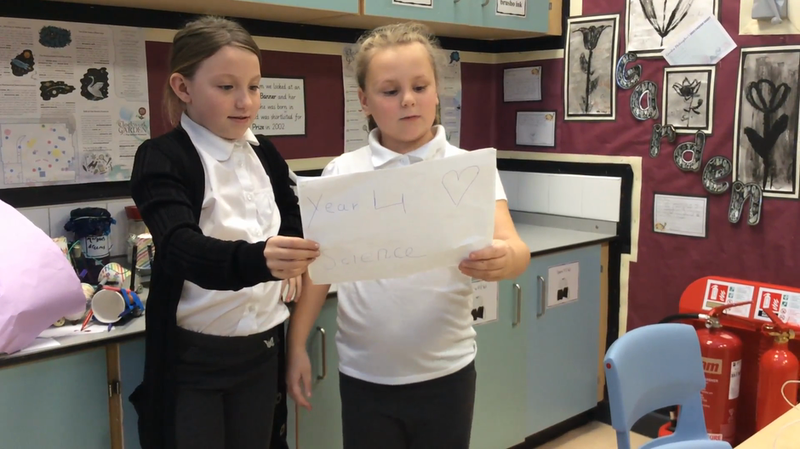 We devised an experiment to answer this question. 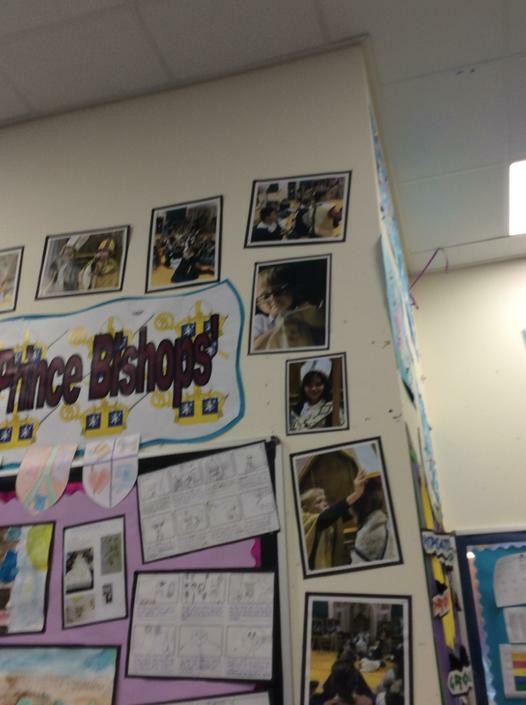 Look at our photographs. 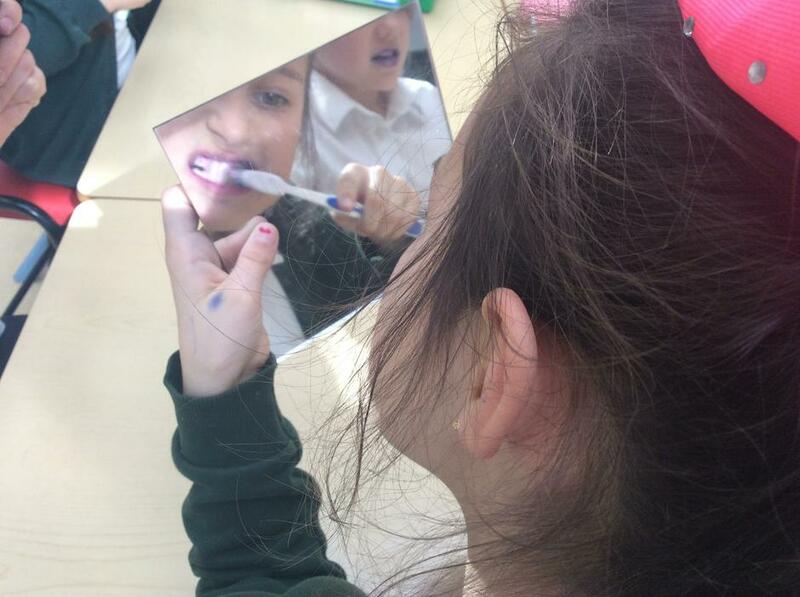 Some of class 4 looked closely at how to brush teeth properly. 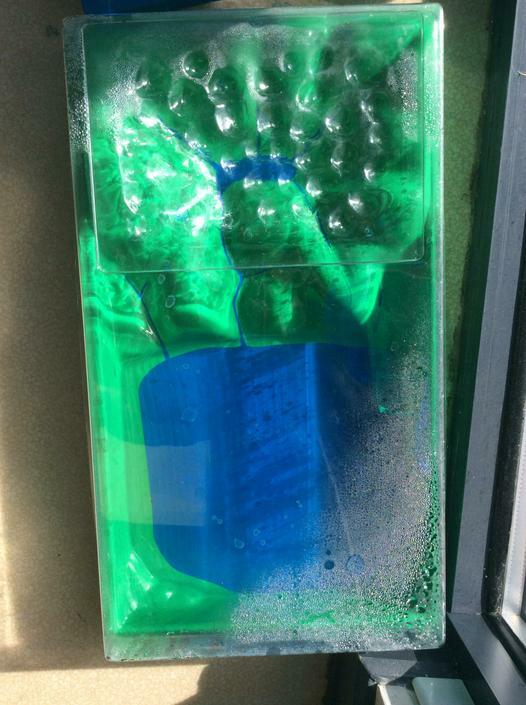 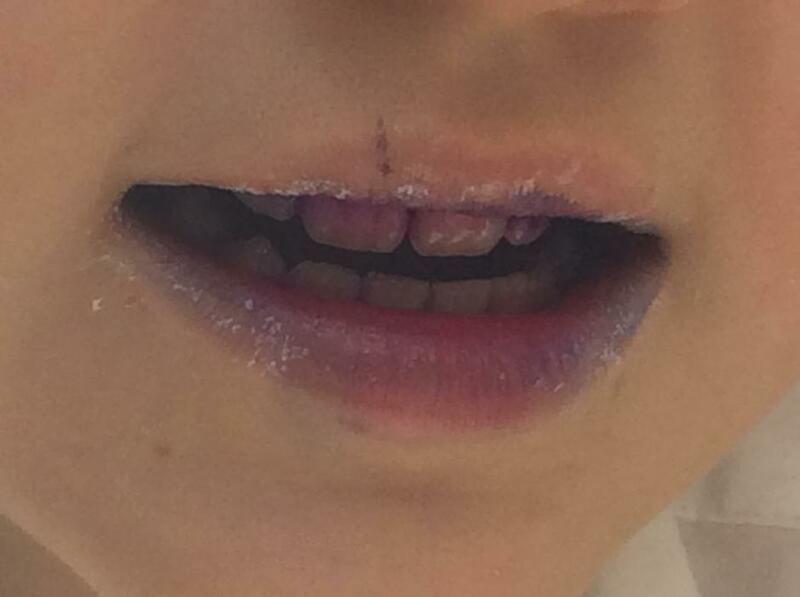 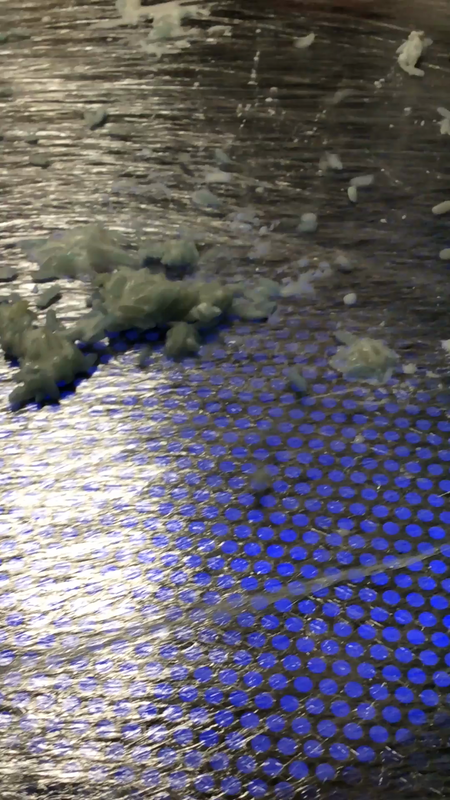 They used disclosing tablets that showed where needed extra attention next time they brushed. 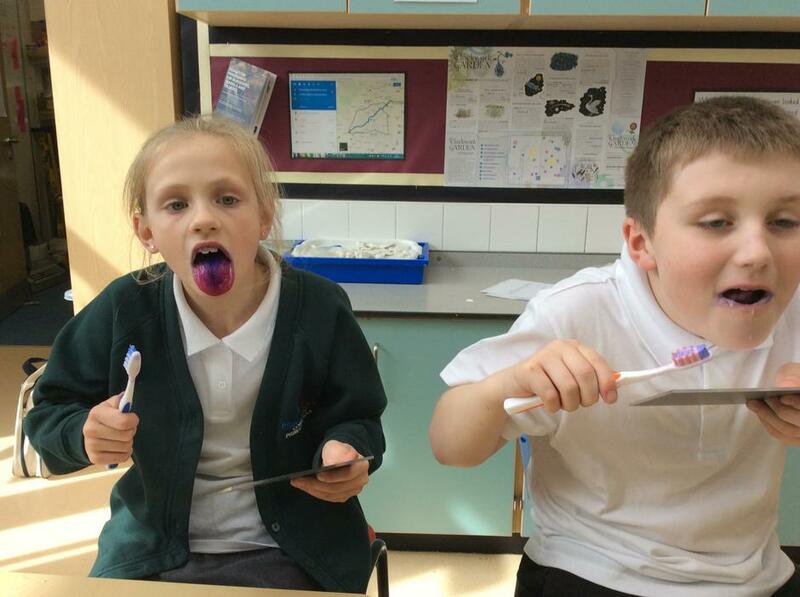 we talked about brushing teeth for 2 minutes and how it was beneficial not to rinse your mouth with water after brushing. 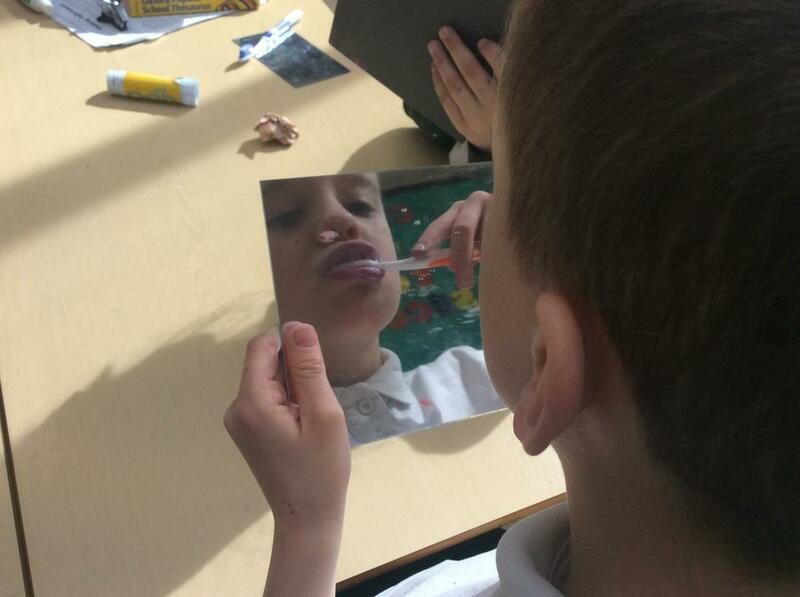 This video is all about brushing your teeth -- directed at children. 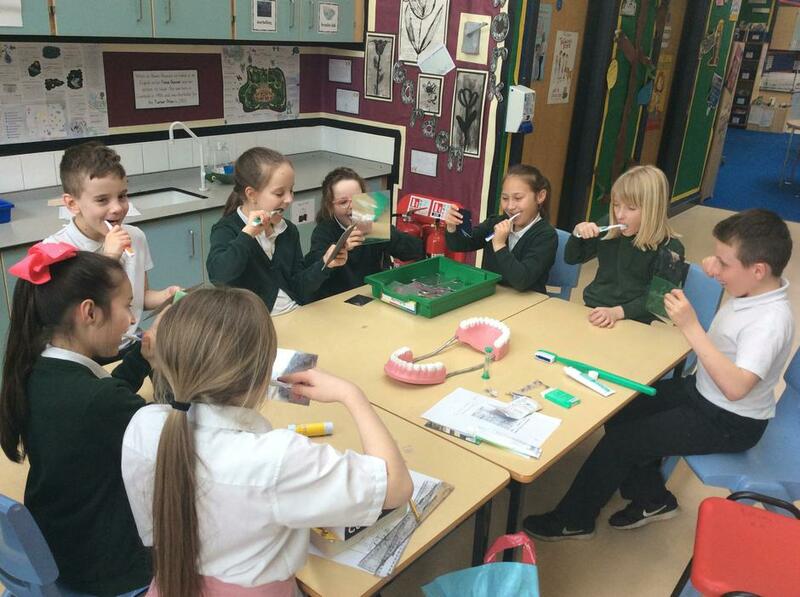 Some topics include: plaque, cavities, and how to brush your teeth. 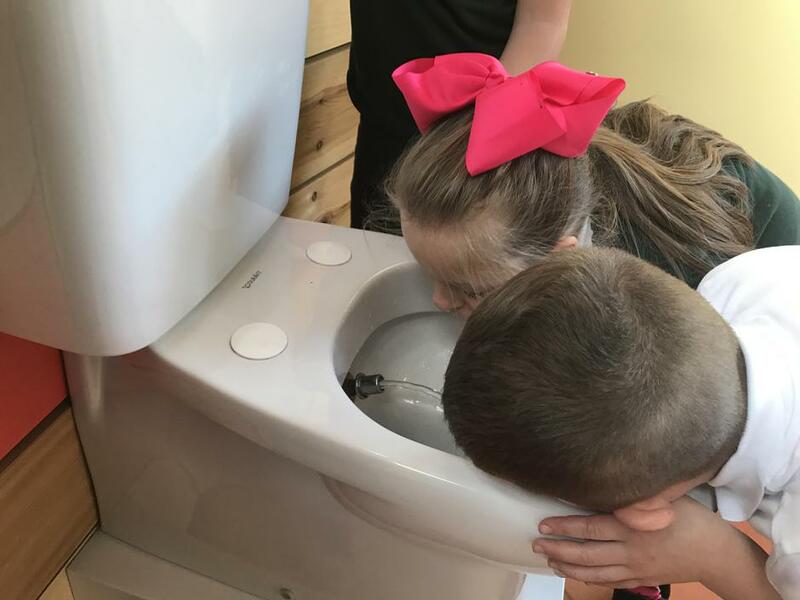 The video also tells you how much fluoride toothpaste to put on your toothbrush, and the best methods to use when brushing your teeth. 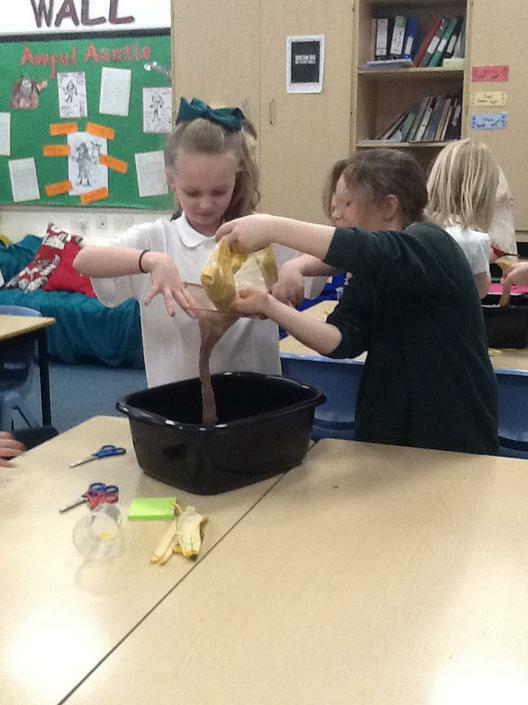 Class 4 have just been looking at the human digestive system. 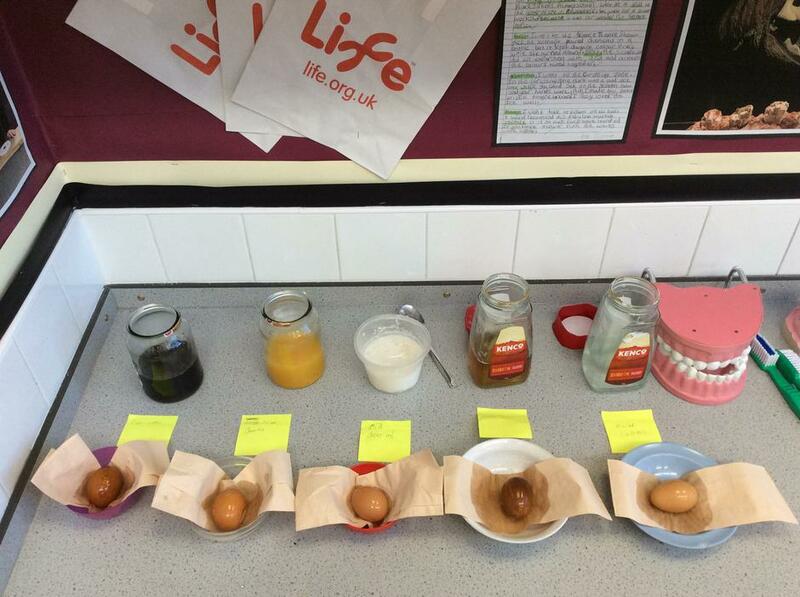 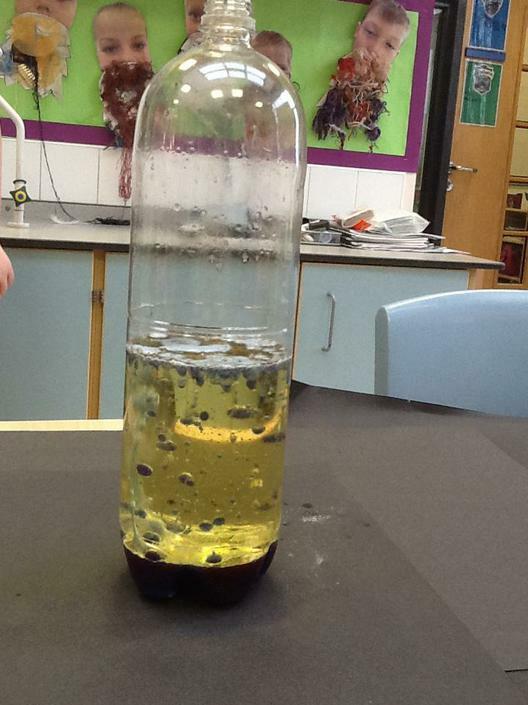 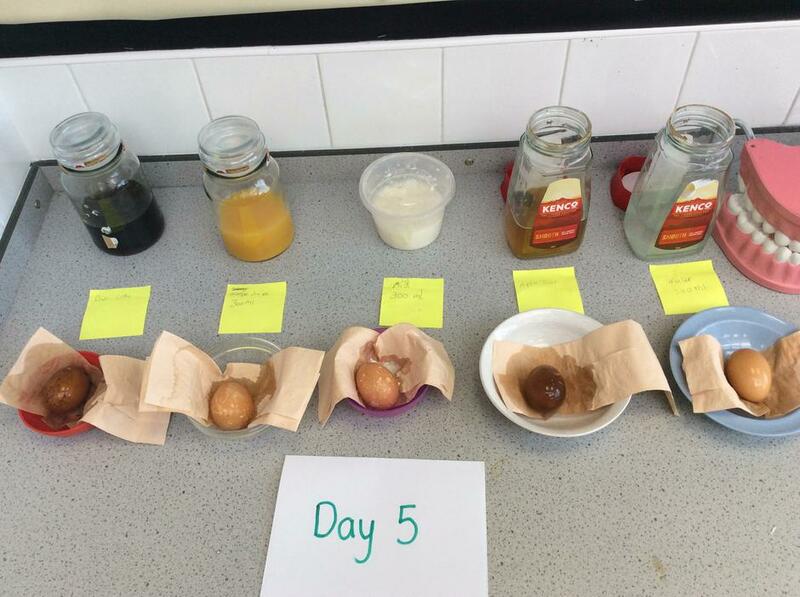 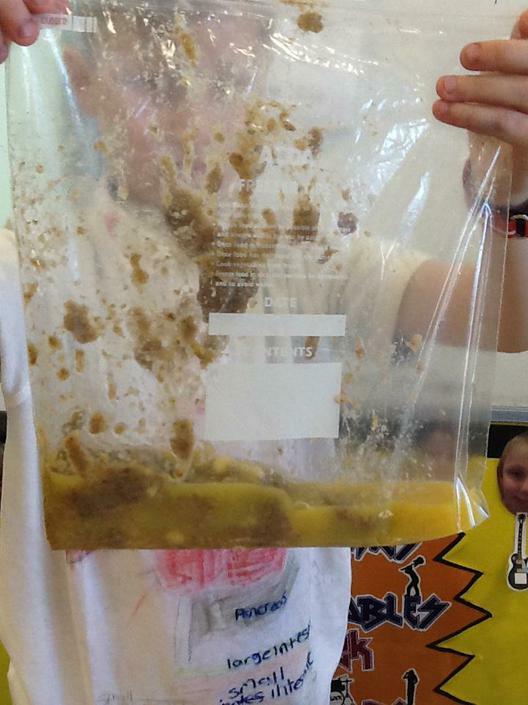 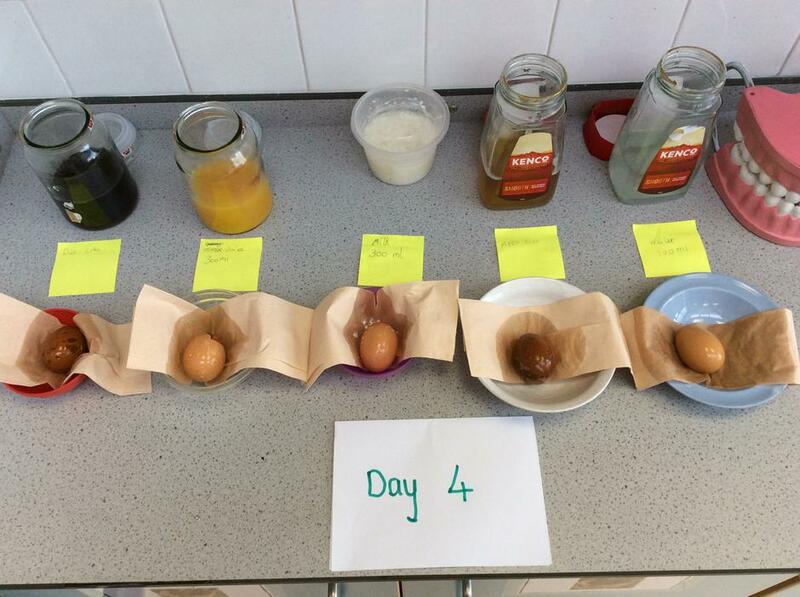 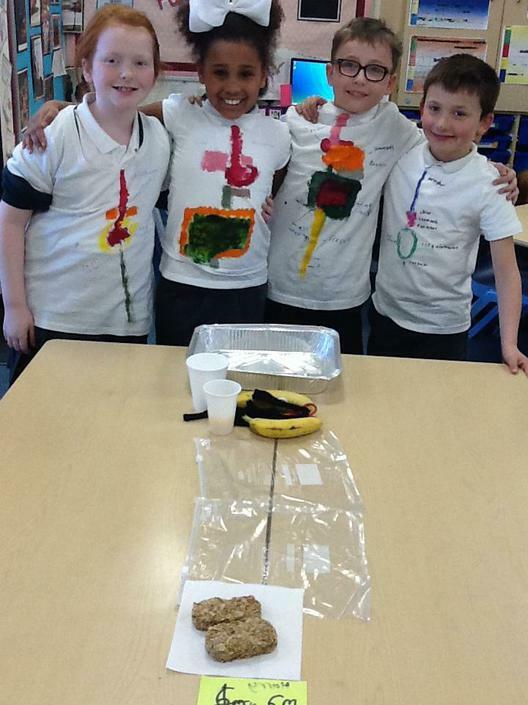 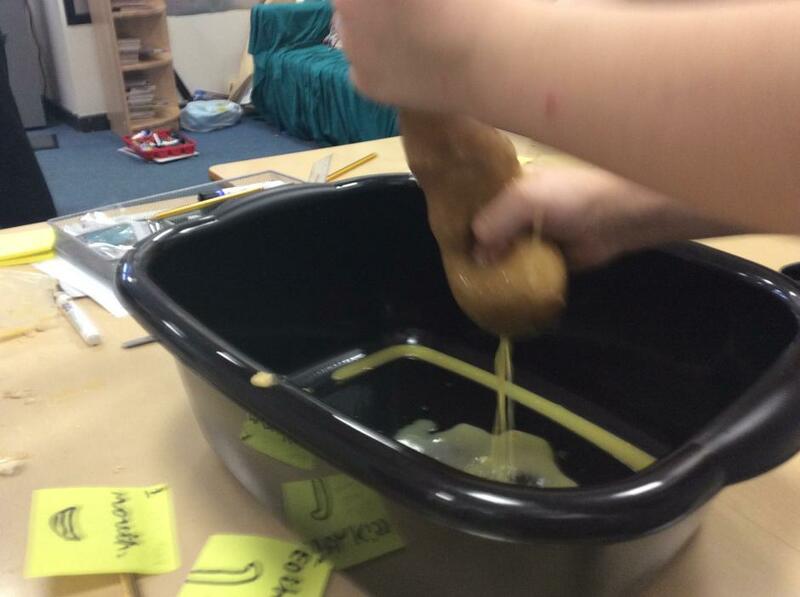 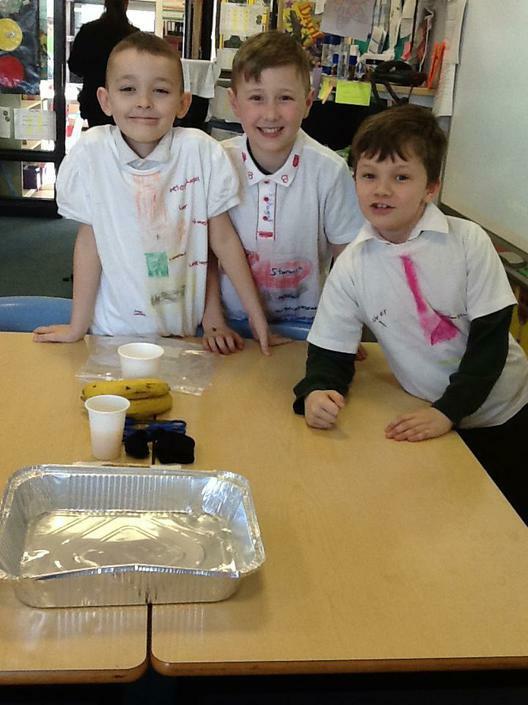 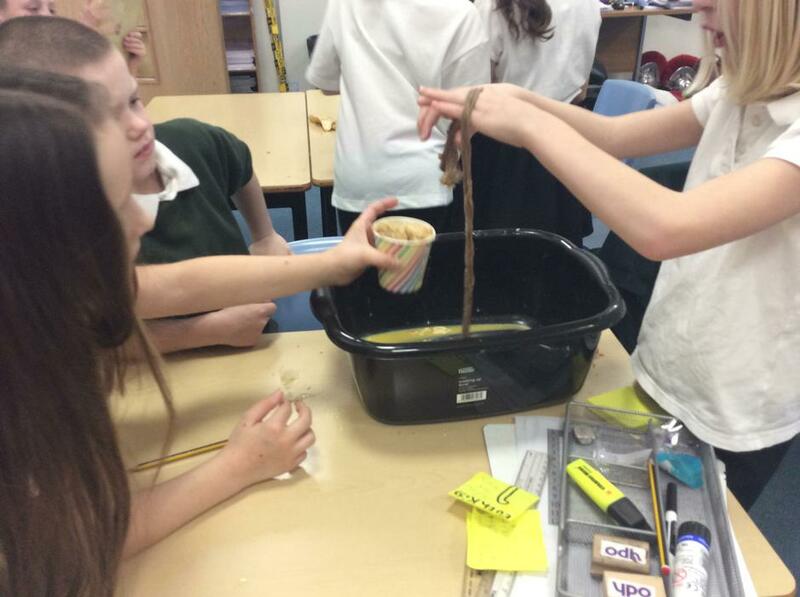 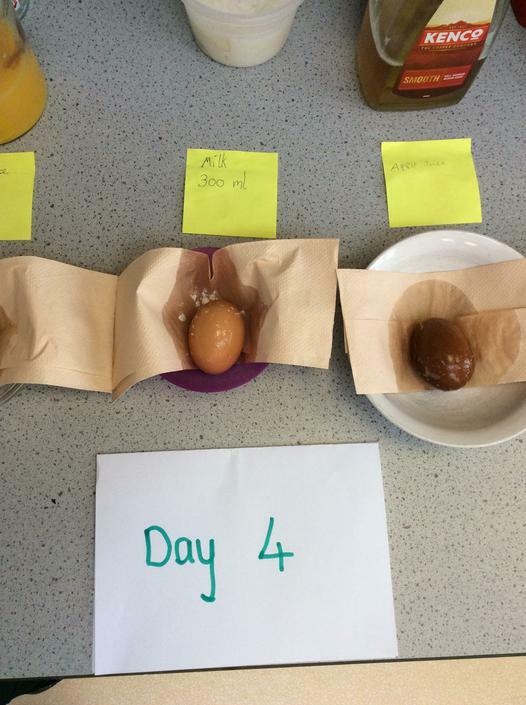 We have a great afternoon going through an experiment to show the different stages of our digestive system. 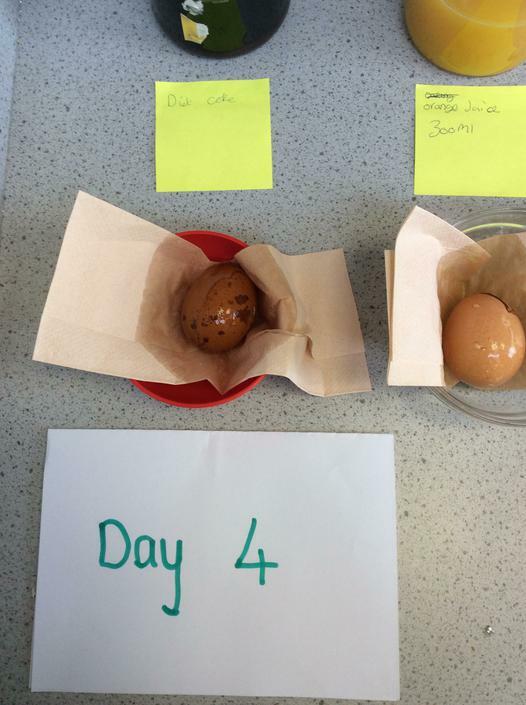 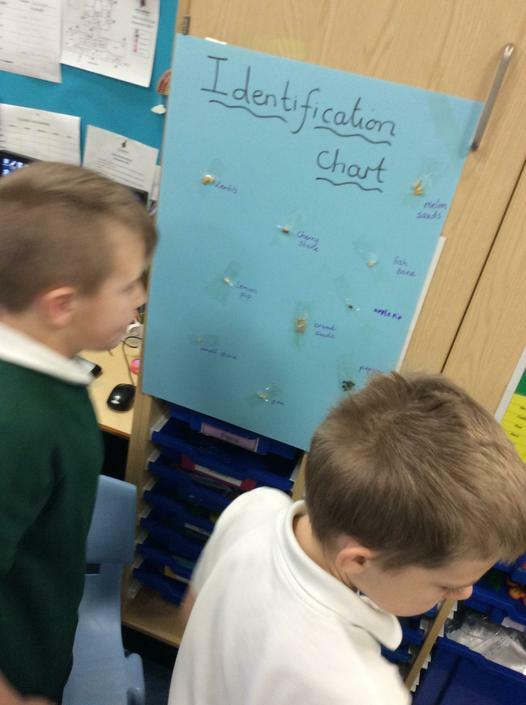 Ask the children about the process and the scientific names. 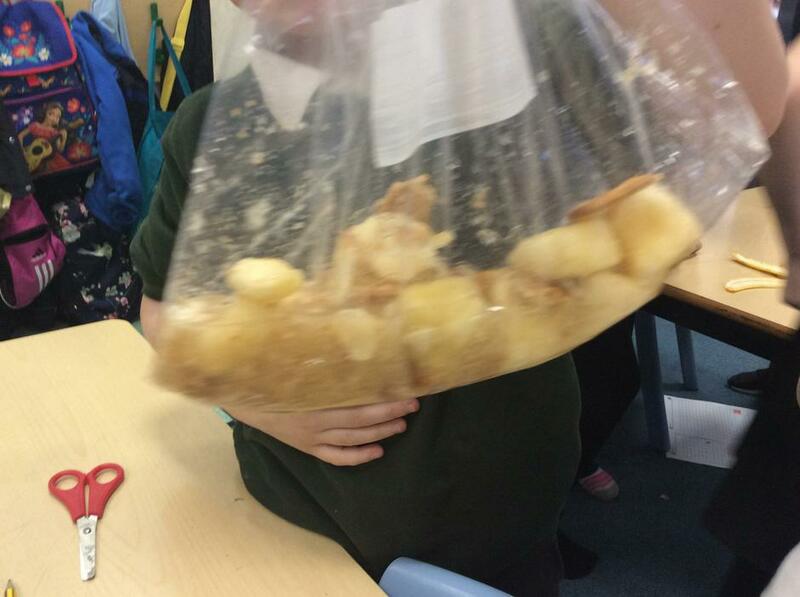 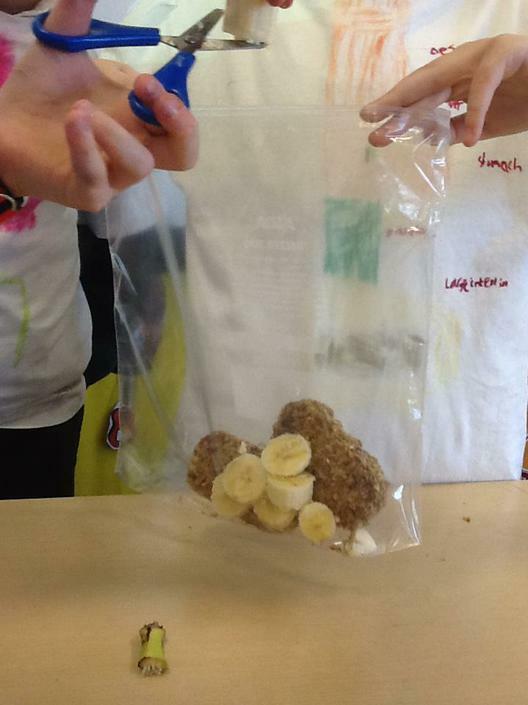 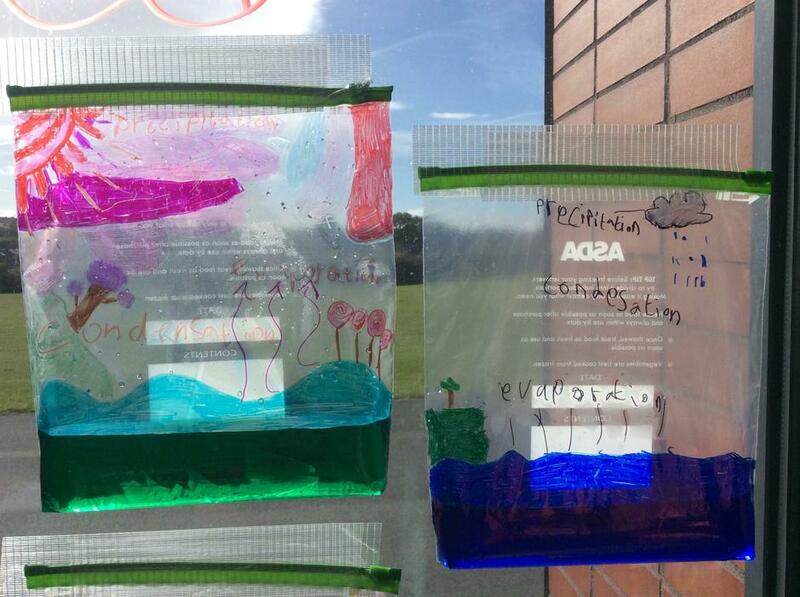 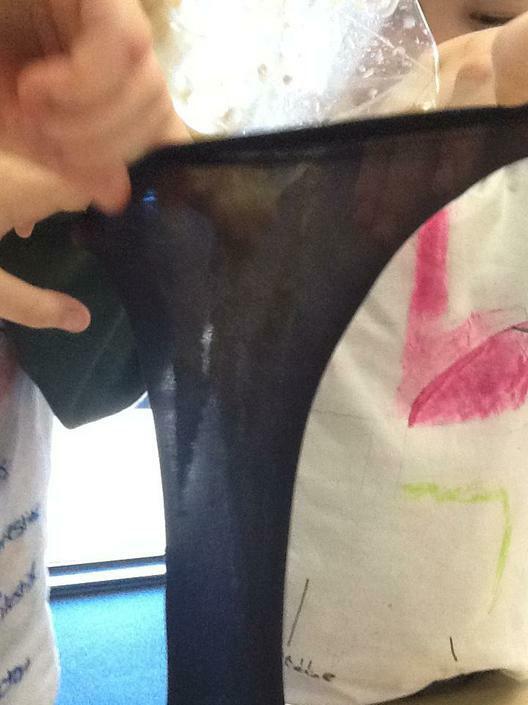 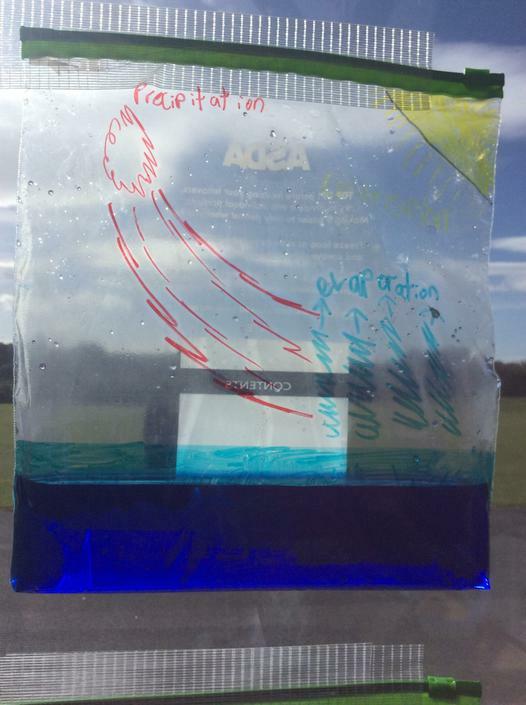 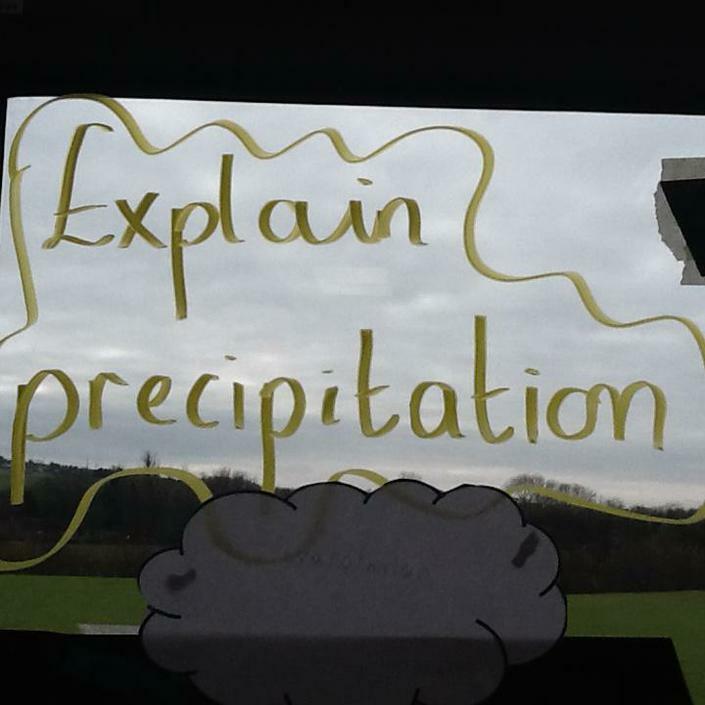 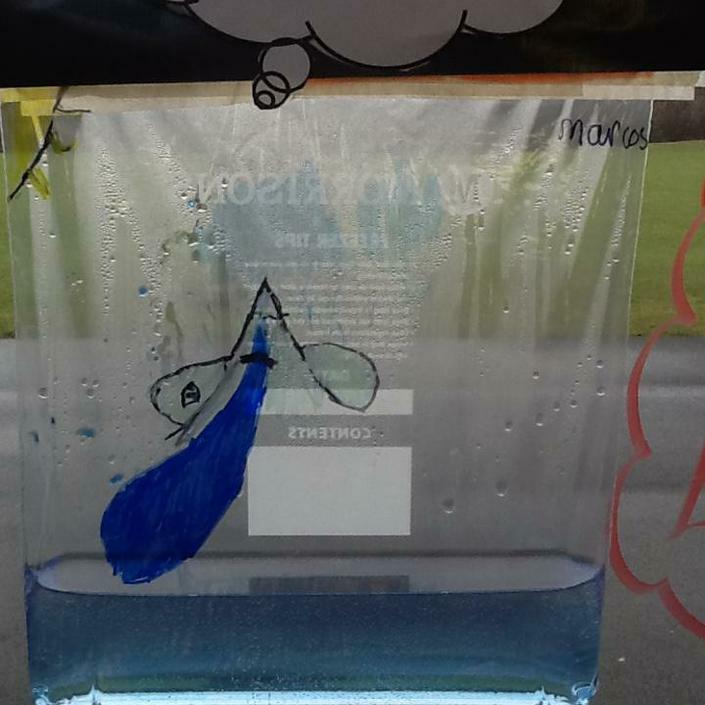 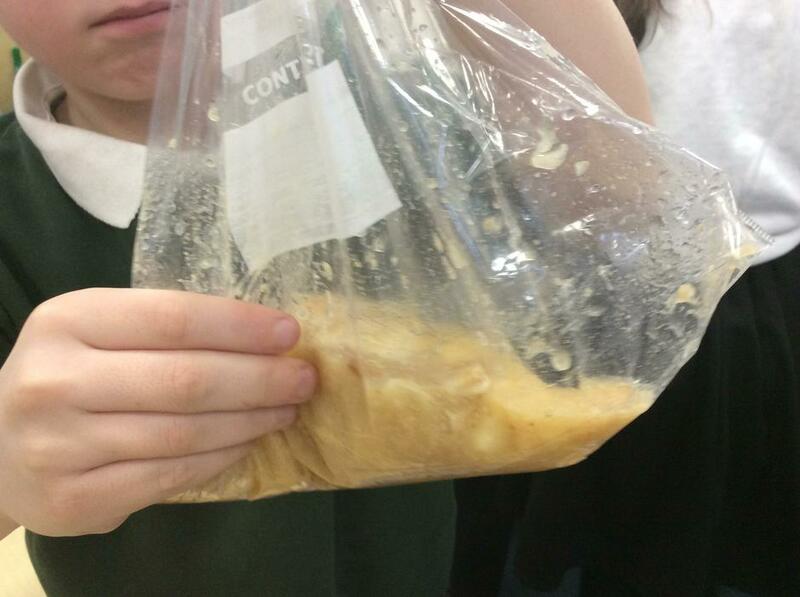 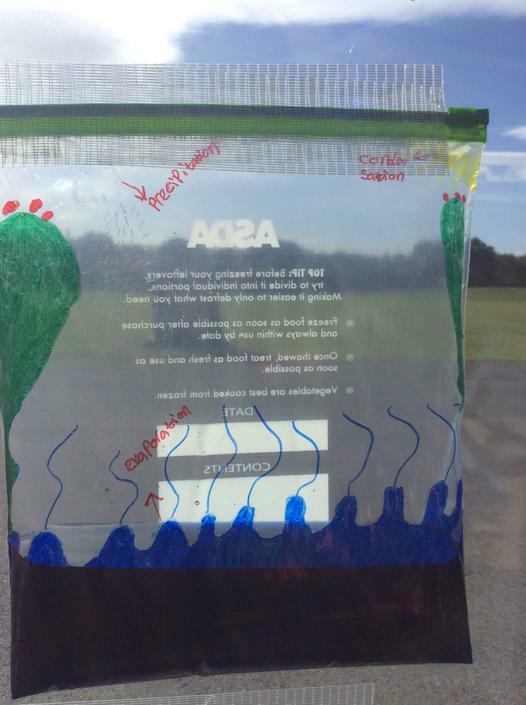 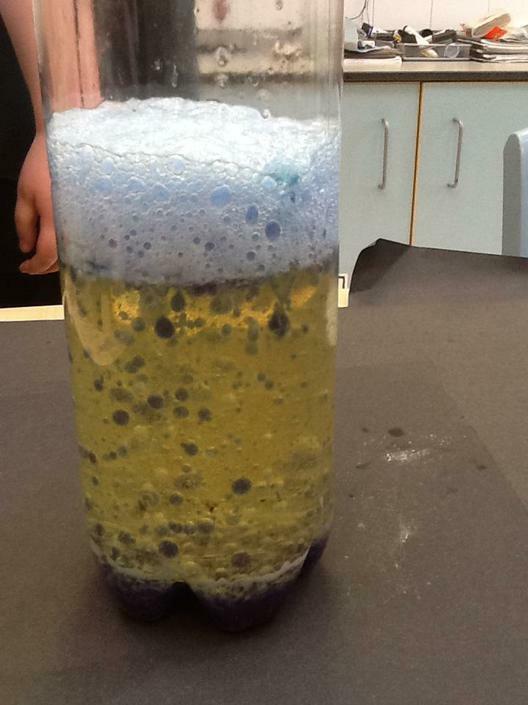 This half term we have been learning about the water cycle and have made a water cycle in a bag. 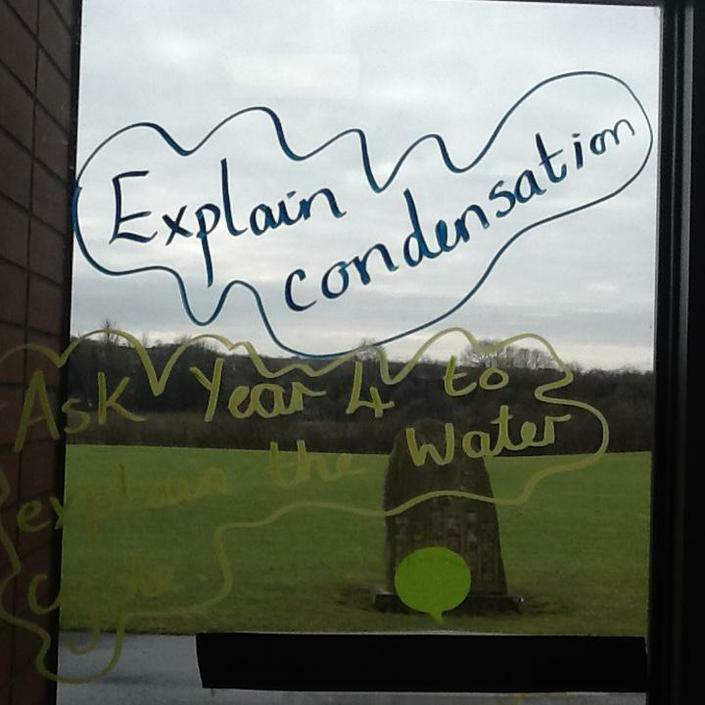 Can you explain what condensation is? 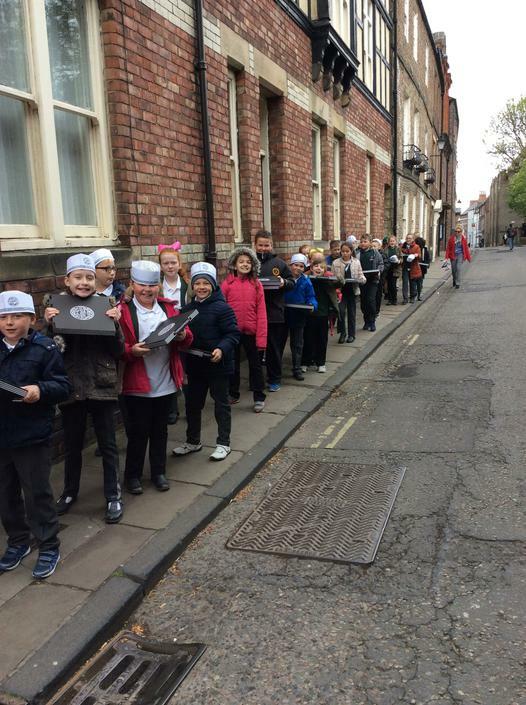 Year 4 were lucky enough to have a taster session of karate, they loved it. 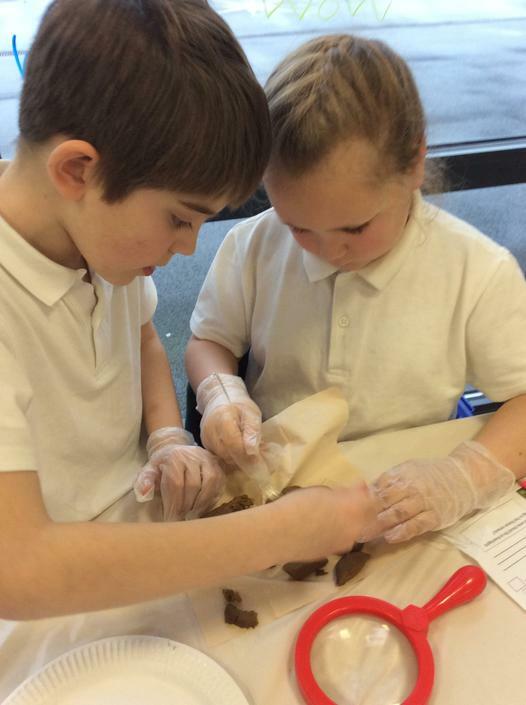 If anyone would like further information of the clubs in Bishop Auckland feel free to come into school and ask. 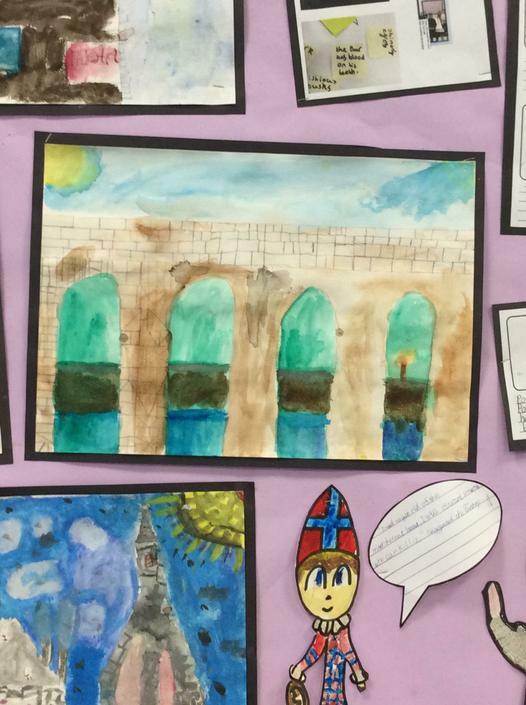 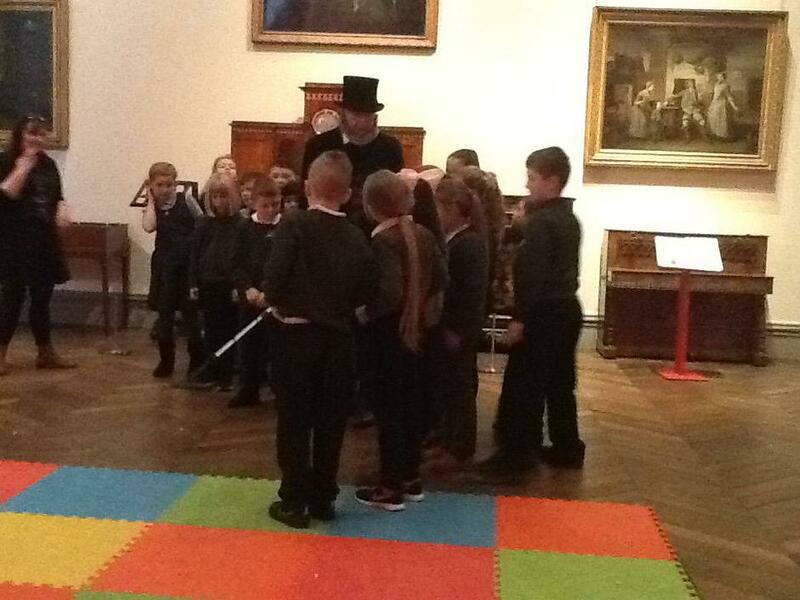 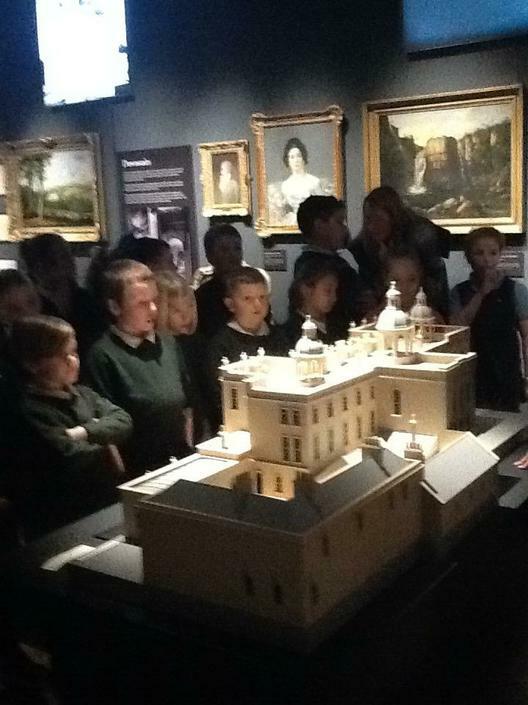 Class 4 had the opportunity to visit Bowes Museum in Barnard Castle. 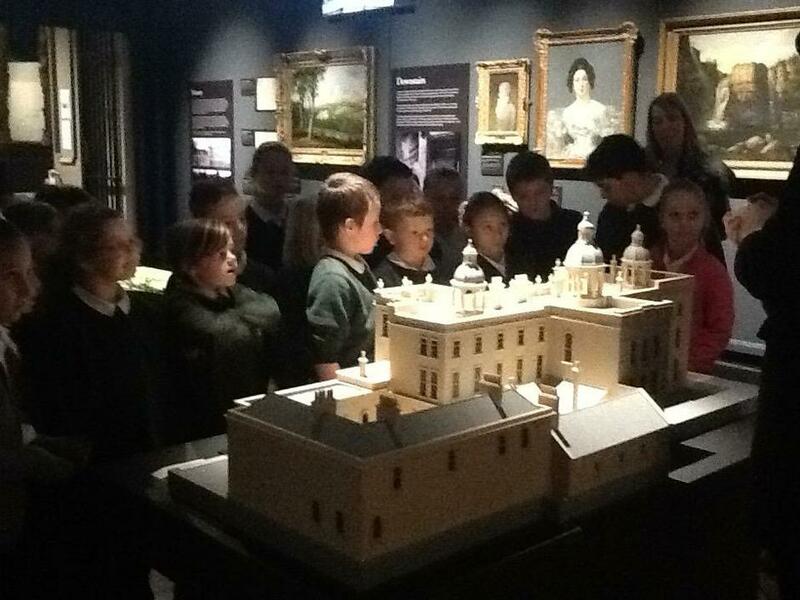 We learnt about Josephine and John Bowes and more about their original home Streatlam Castle. 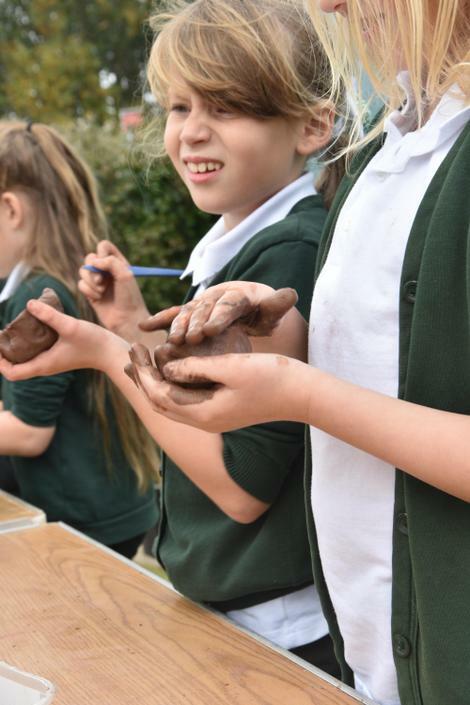 You can find out more information by visiting the website. 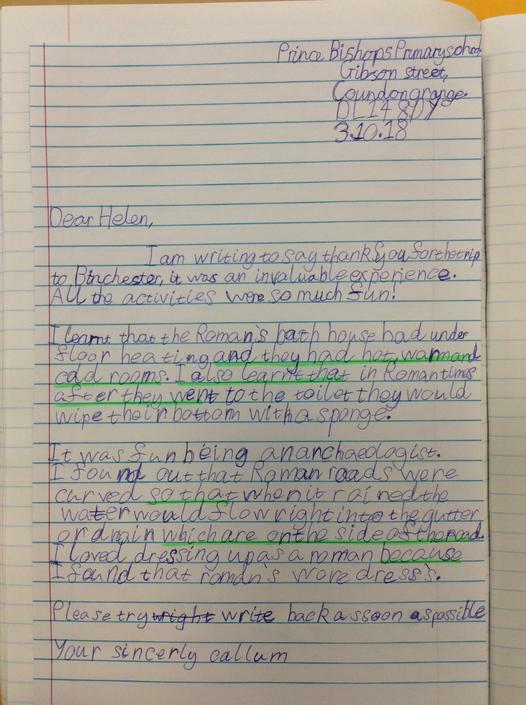 This term we are looking at the story Escape From Pompeii, where we have looked at settings, speech and descriptive writing. 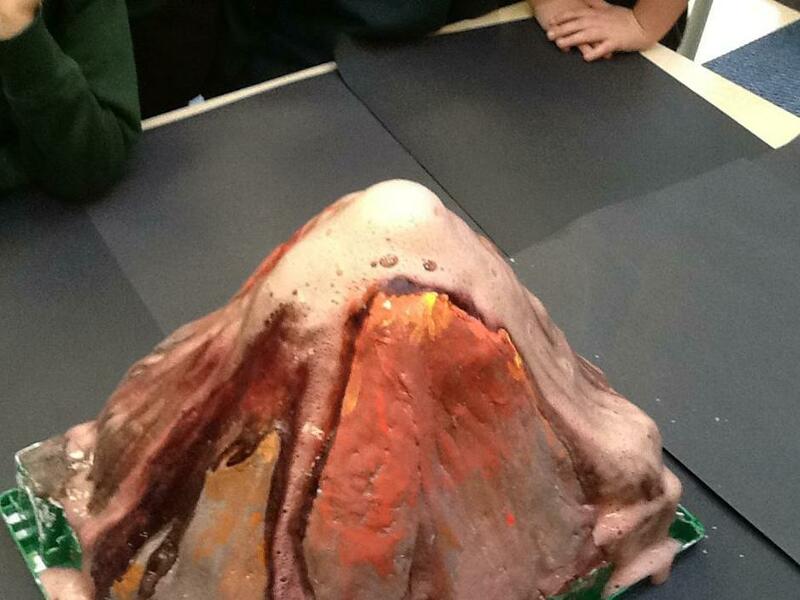 We will be moving onto explanation texts and learning more about volcanoes. 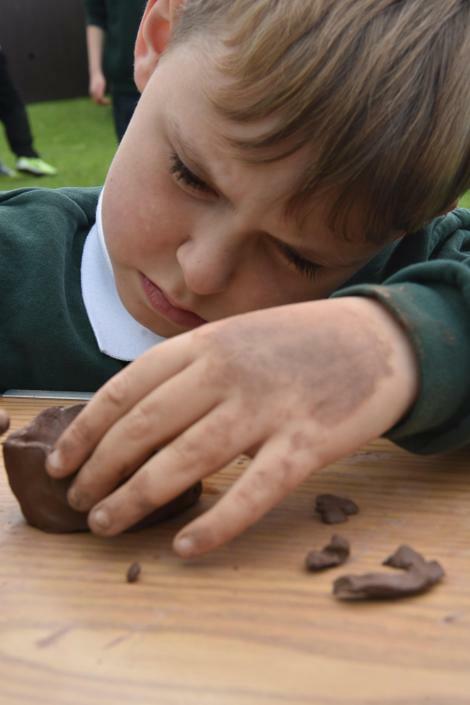 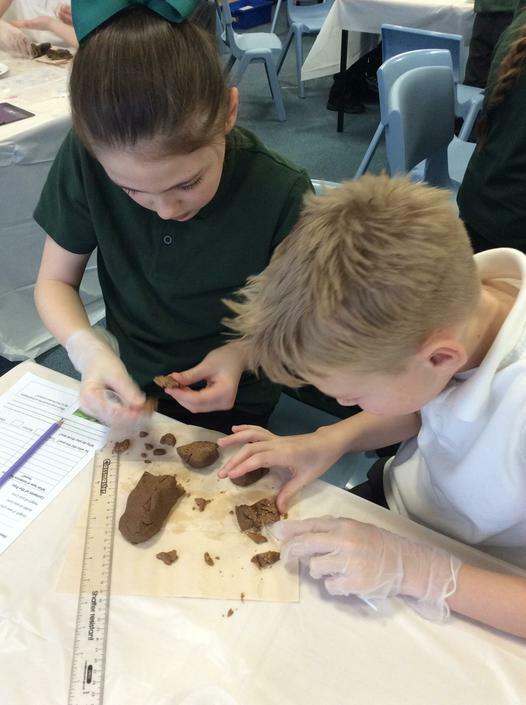 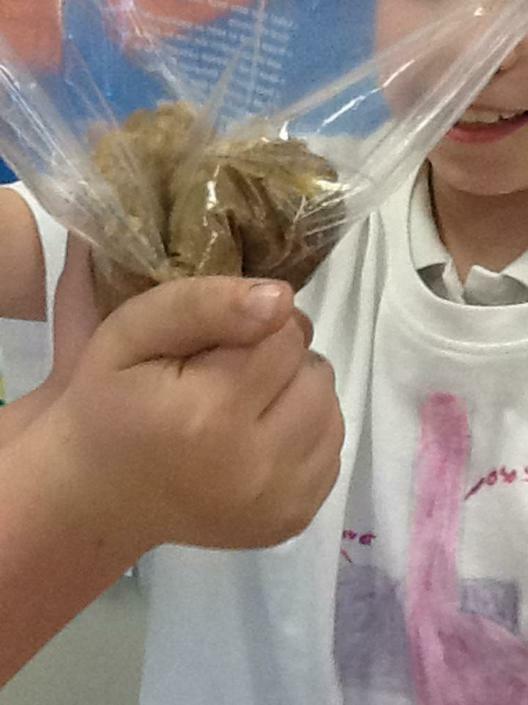 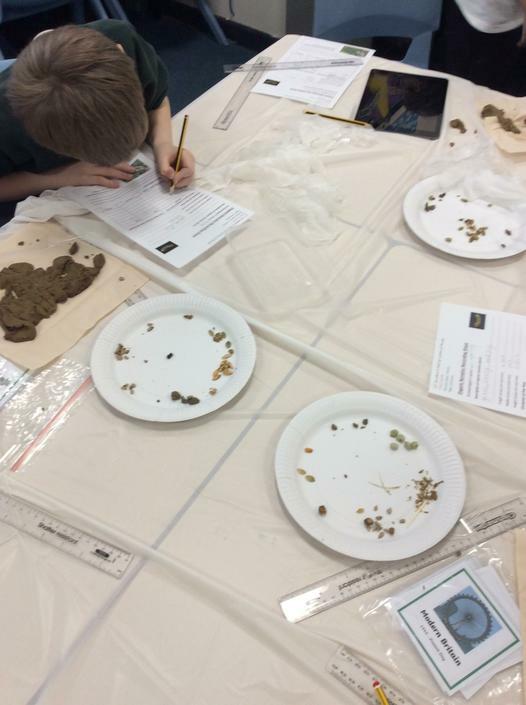 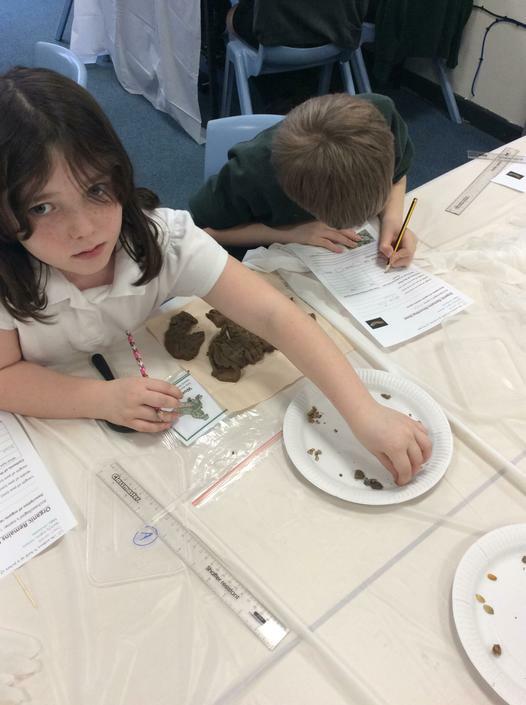 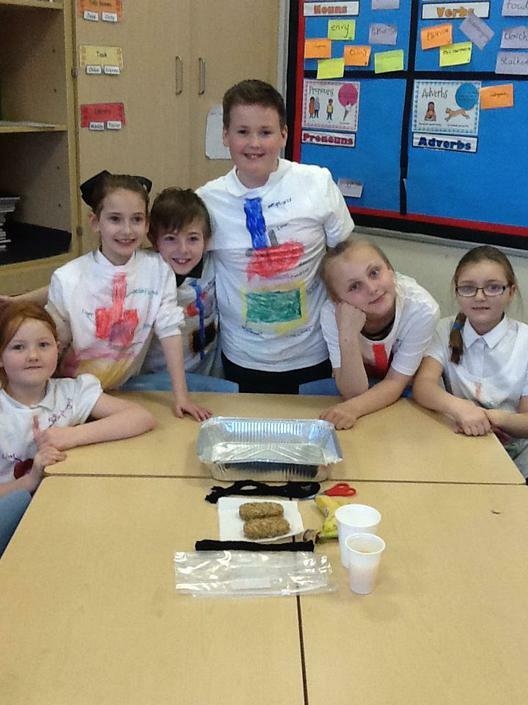 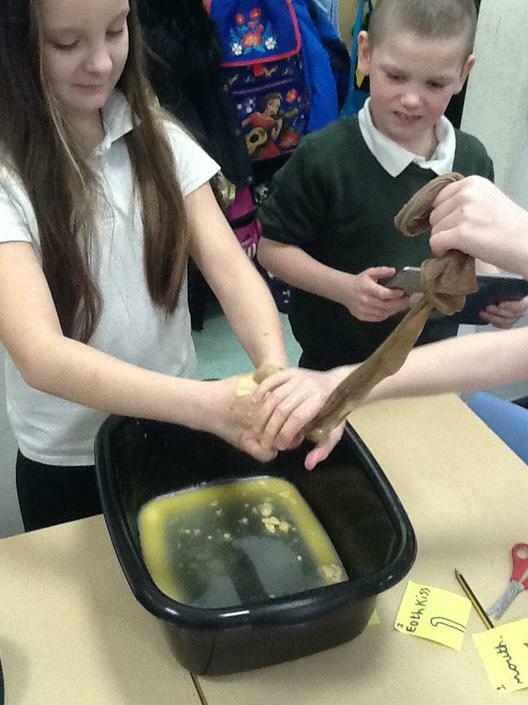 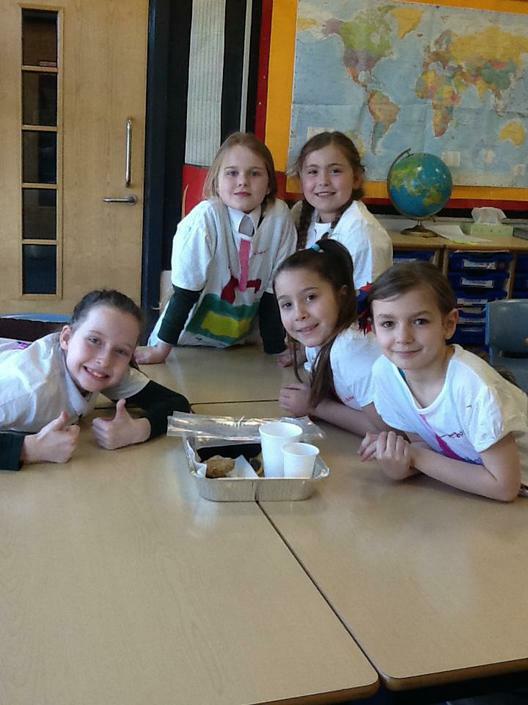 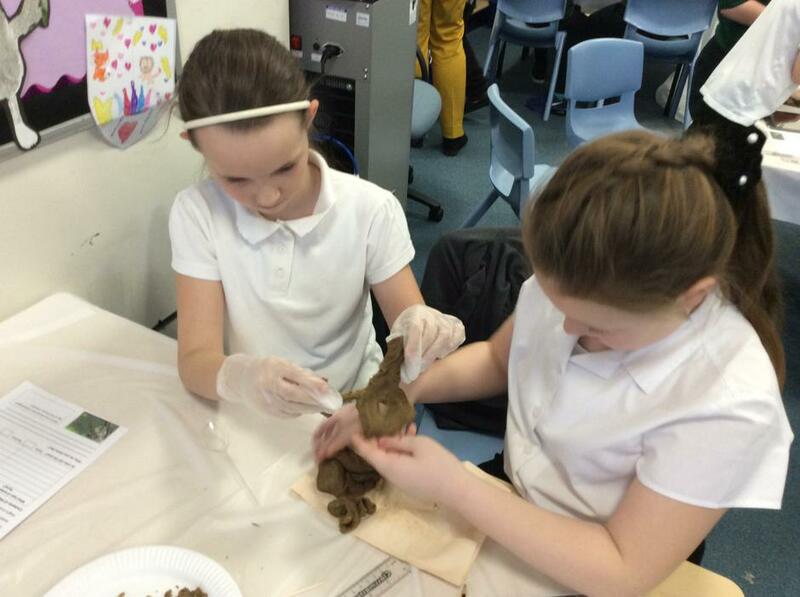 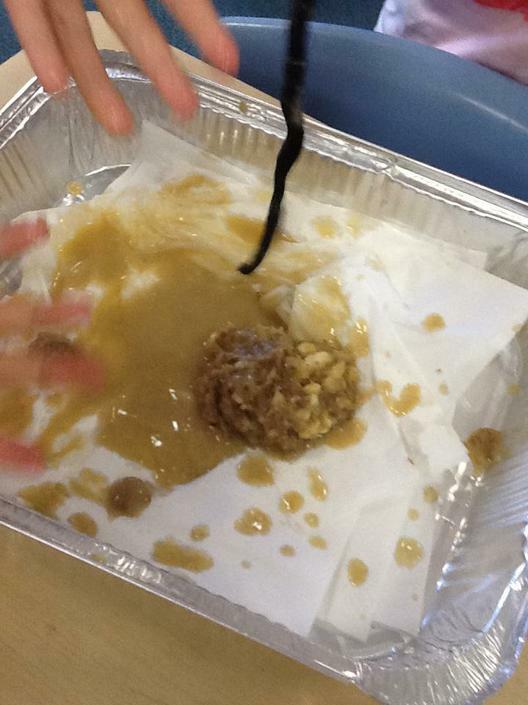 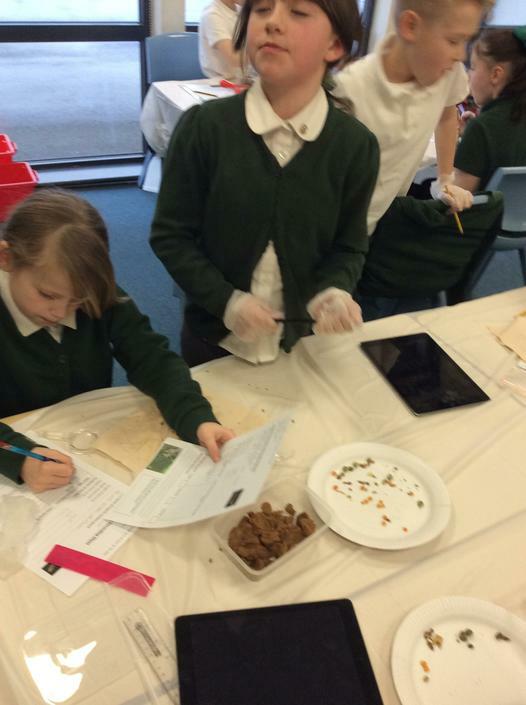 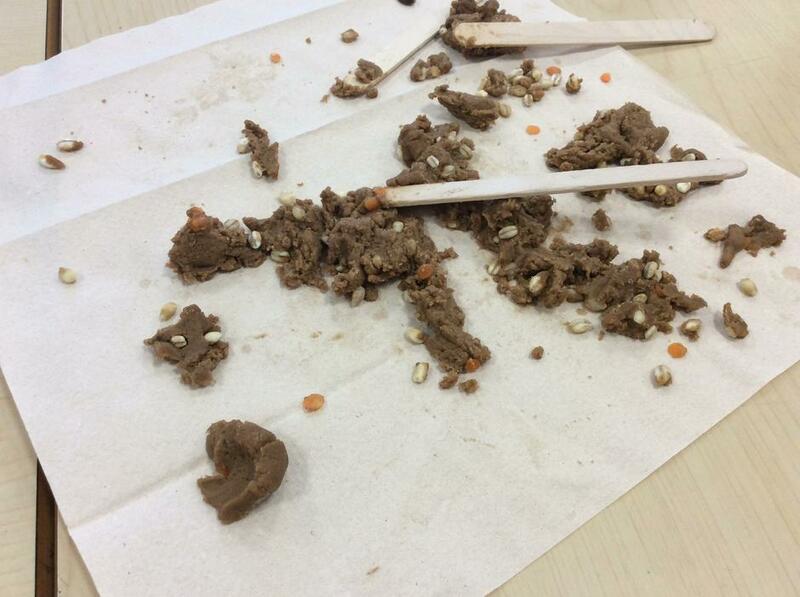 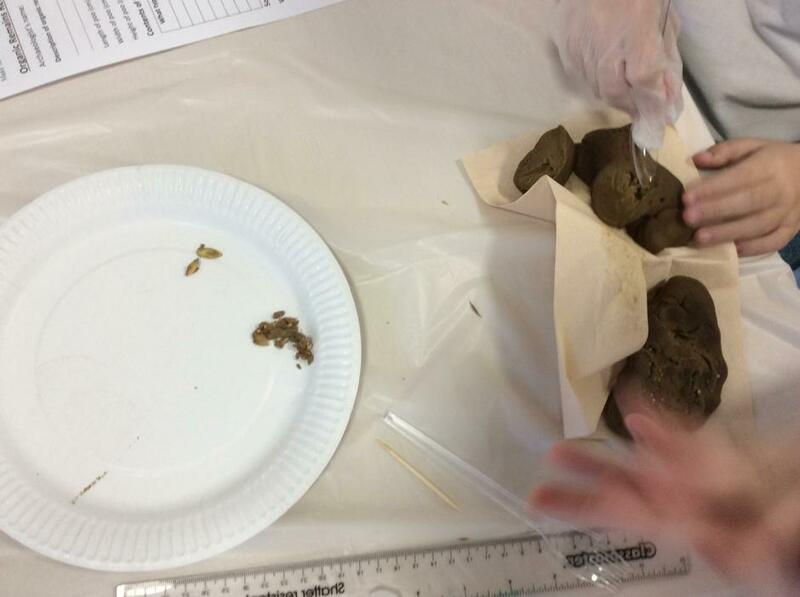 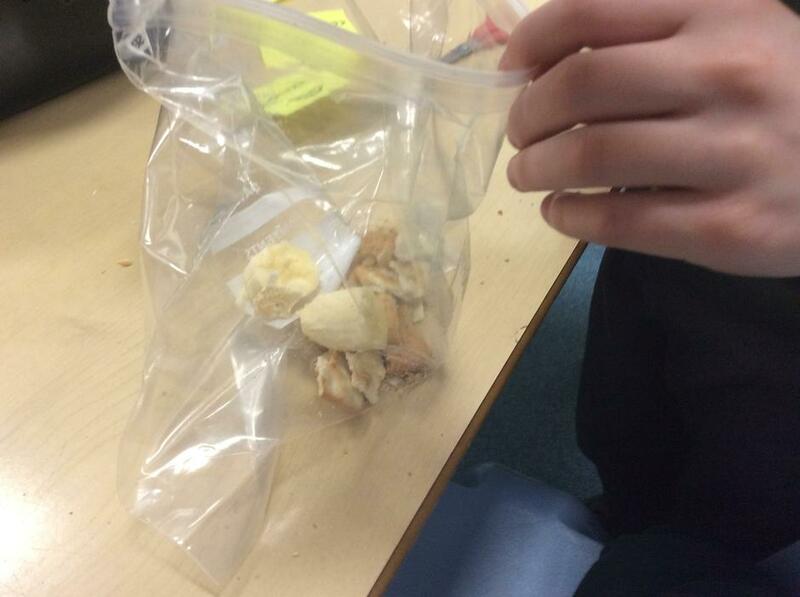 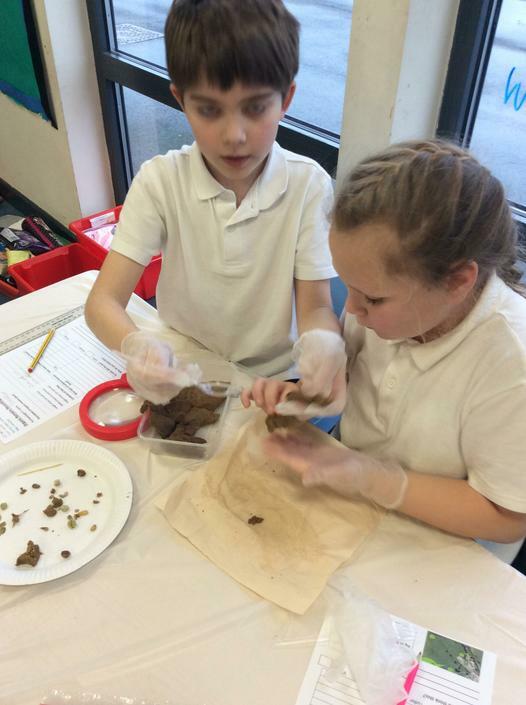 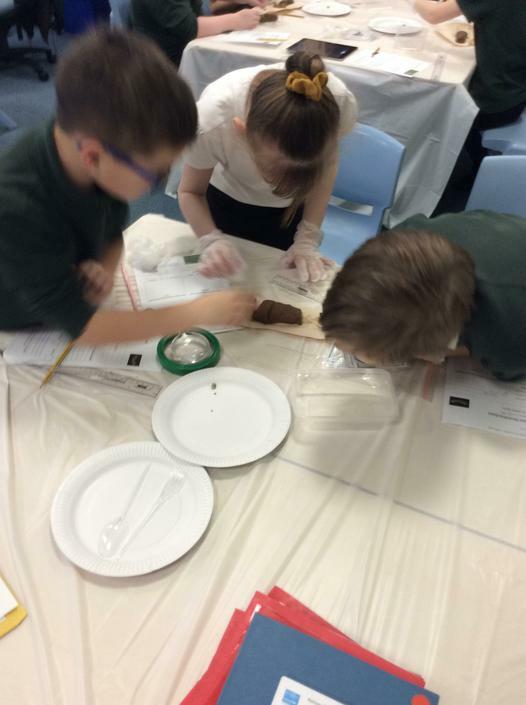 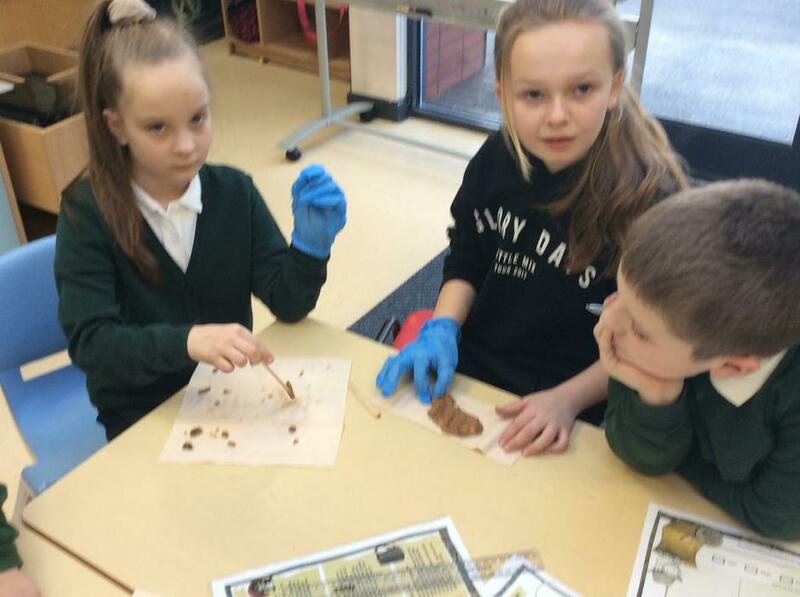 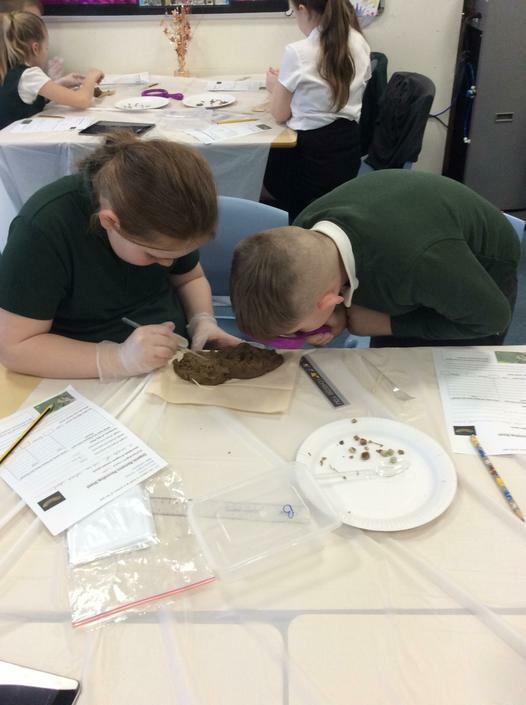 Class 4 have been archaeologists, we have been finding out what the Romans ate by dissecting their poo. 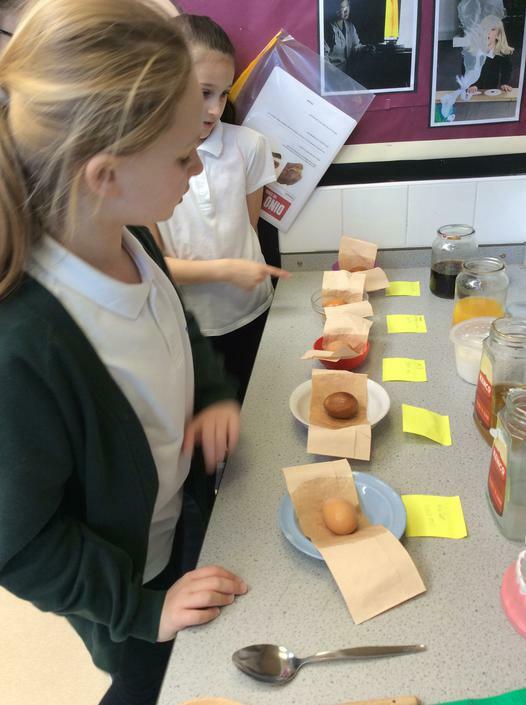 We found out that they had a healthy diet of olives, cherries, bread grains and melons. 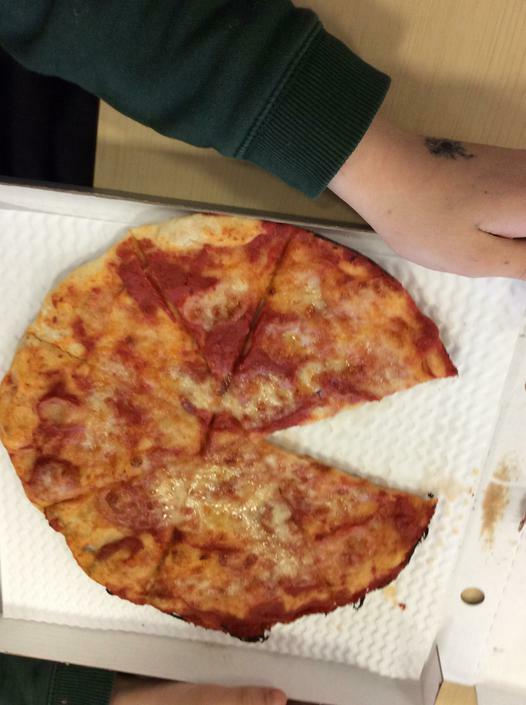 We decided that their diet was much healthier than we eat today. 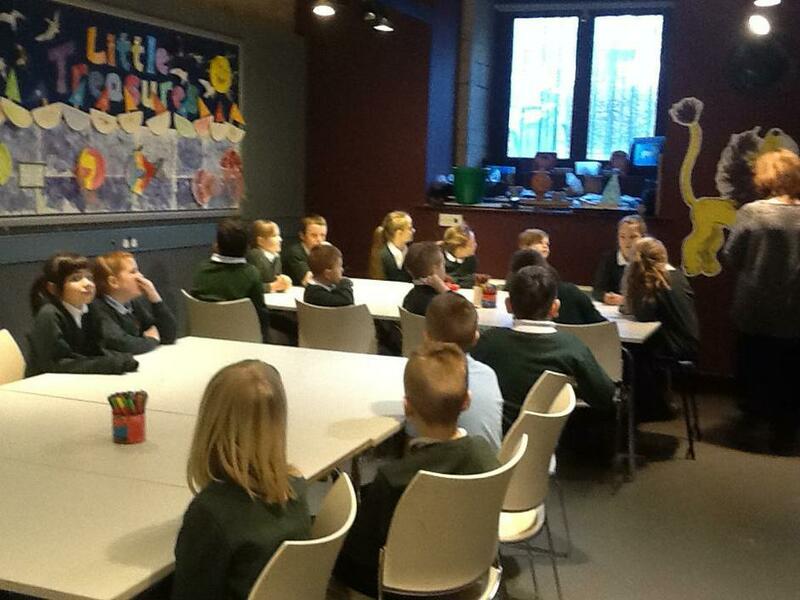 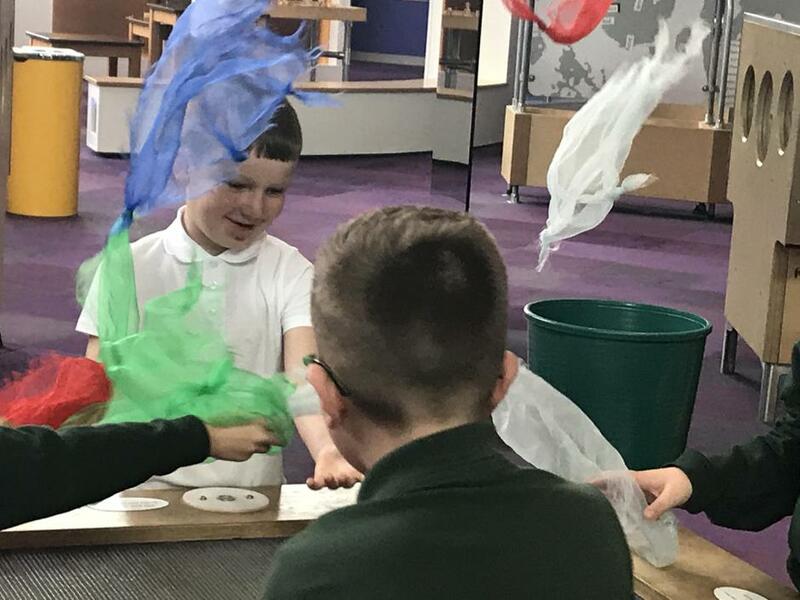 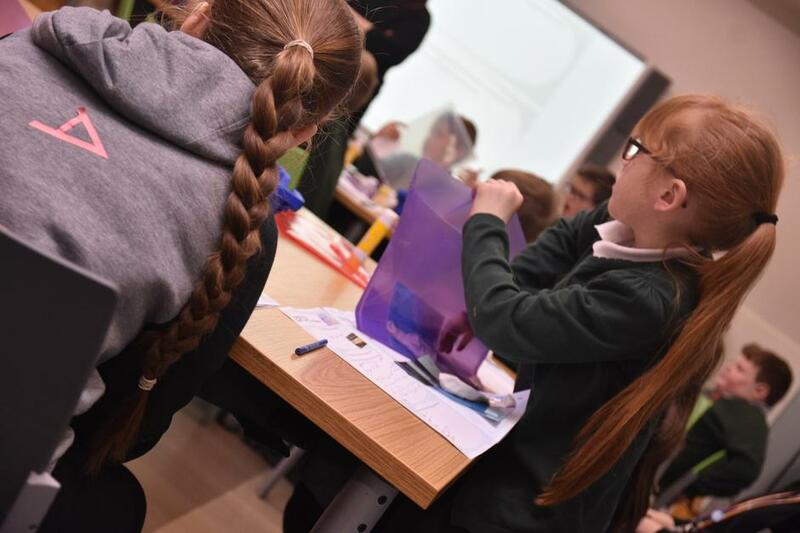 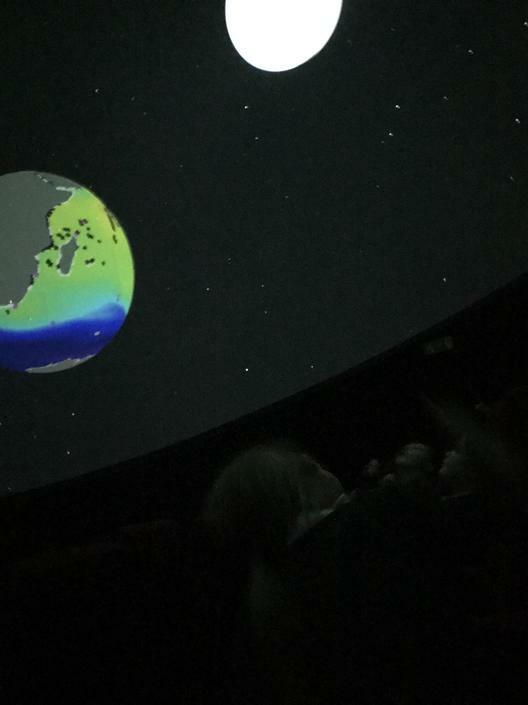 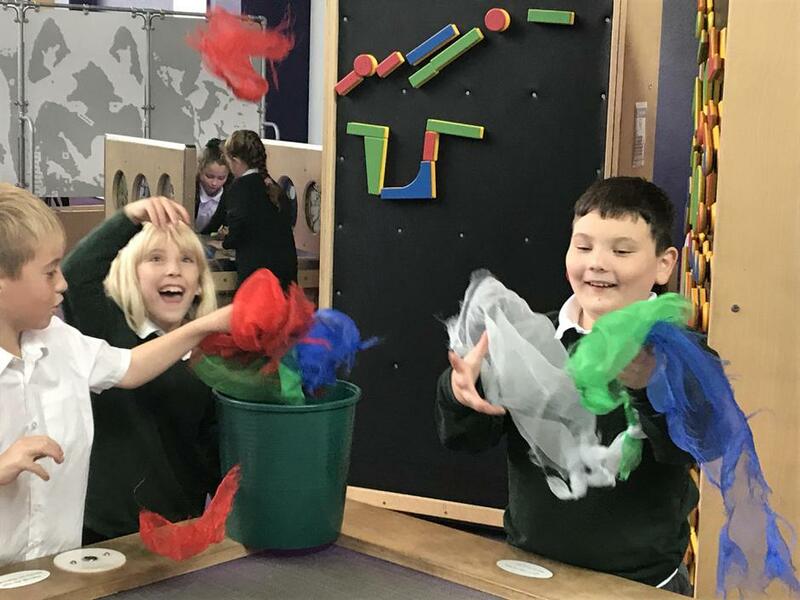 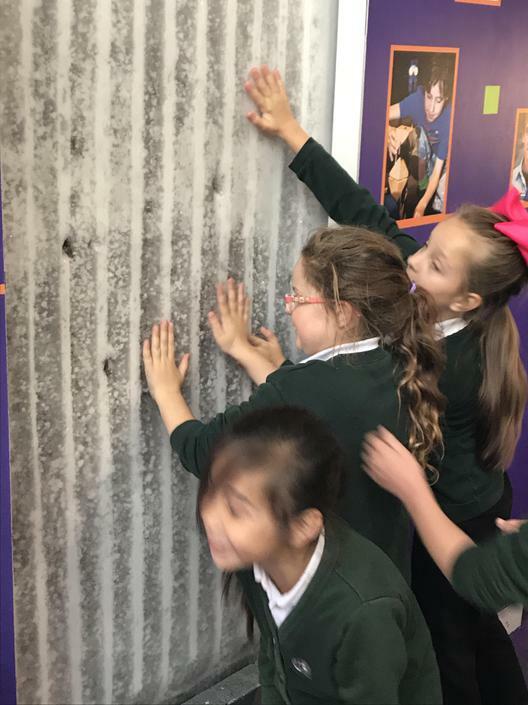 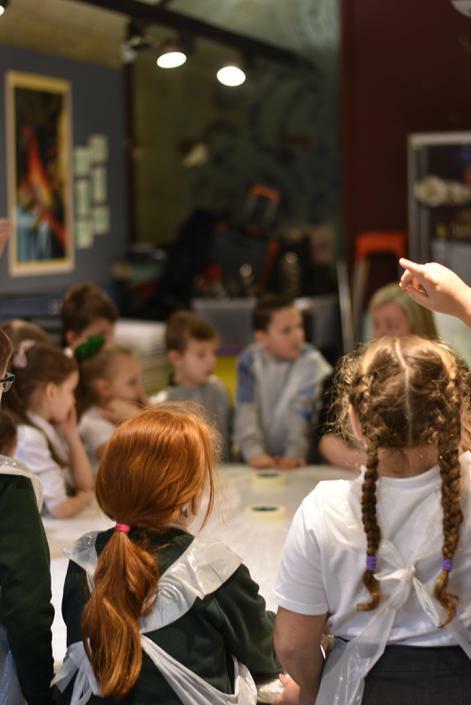 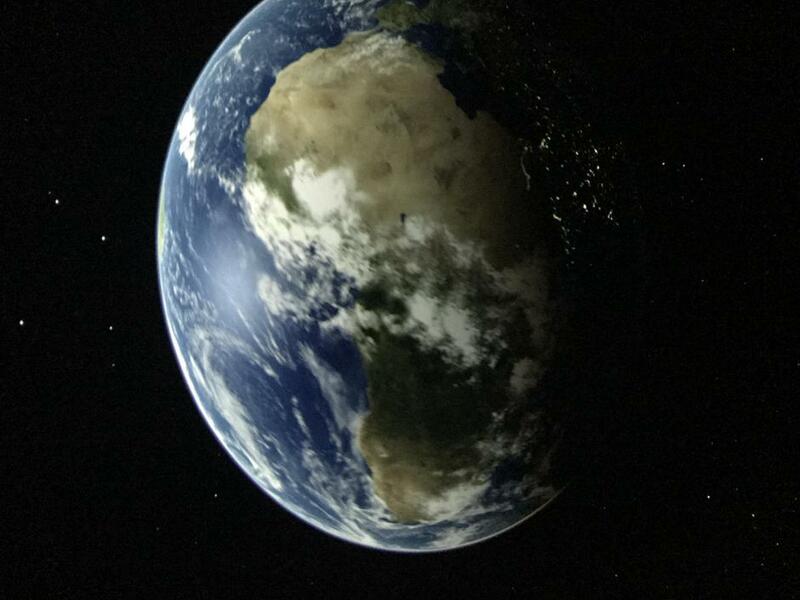 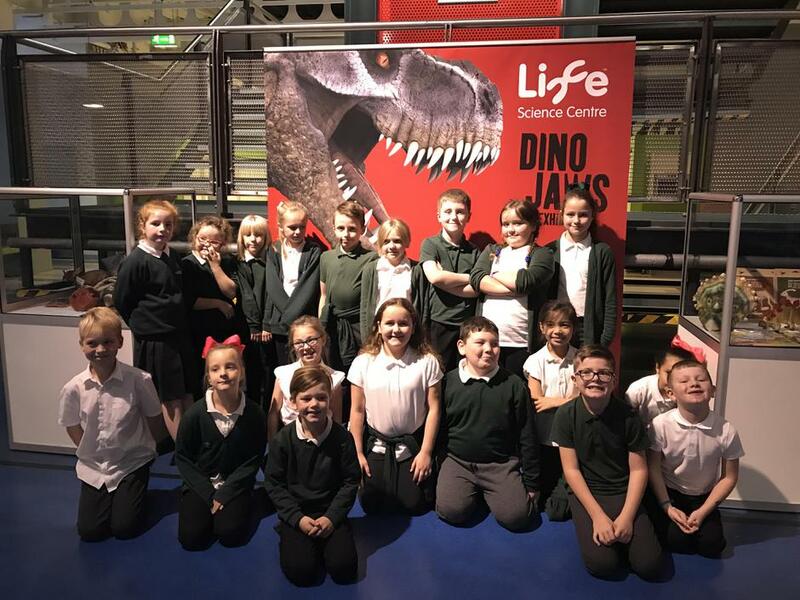 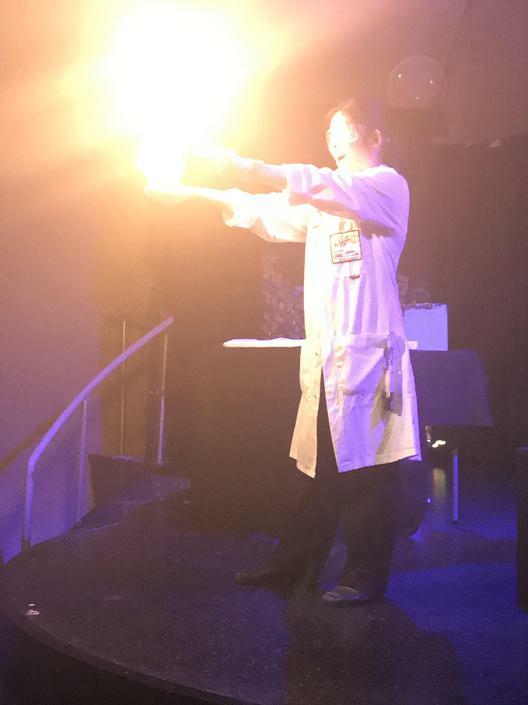 Year 4 had a fantastic day at the Life Centre in Newcastle, we had a very busy day exploring the different science zones and took part in a work shop related to our topic of sound. 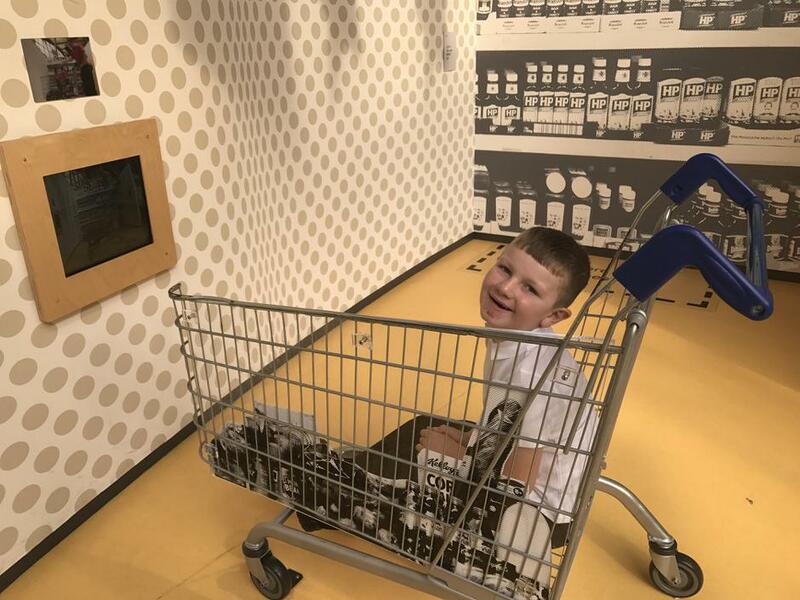 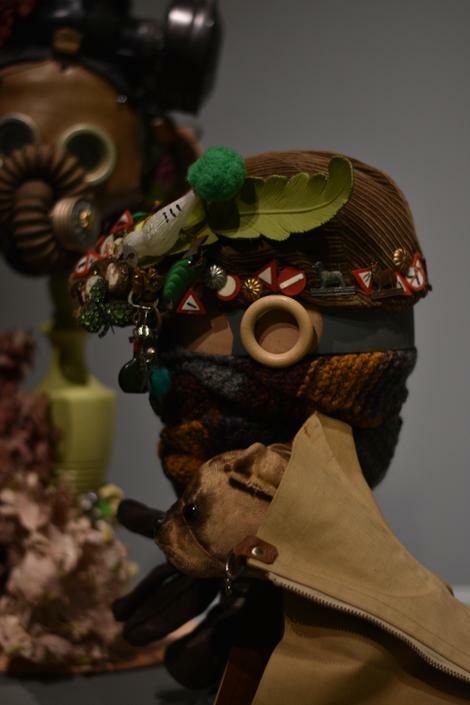 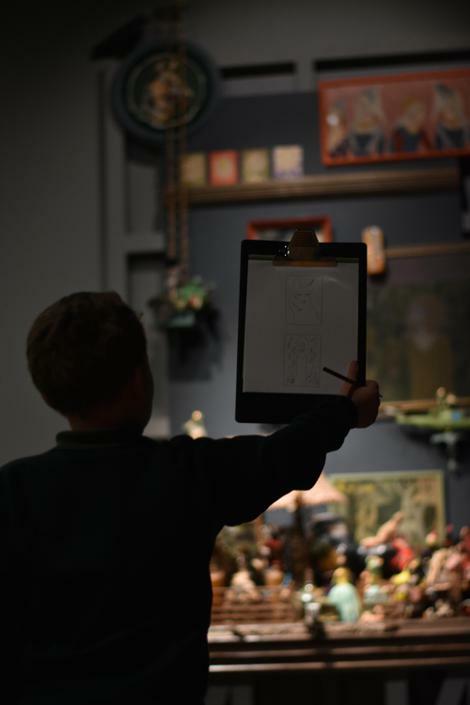 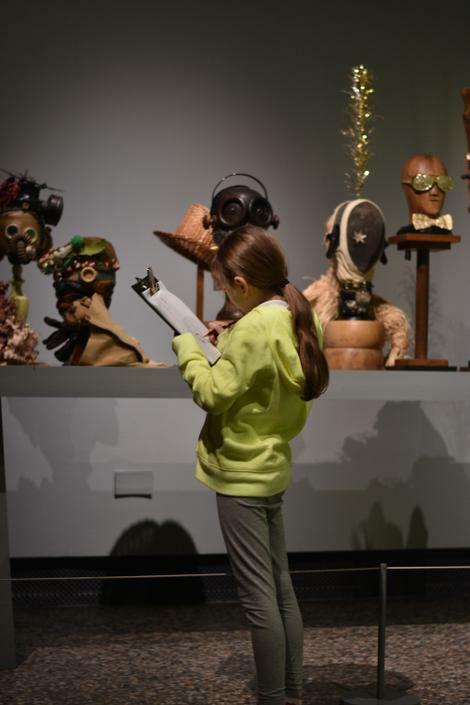 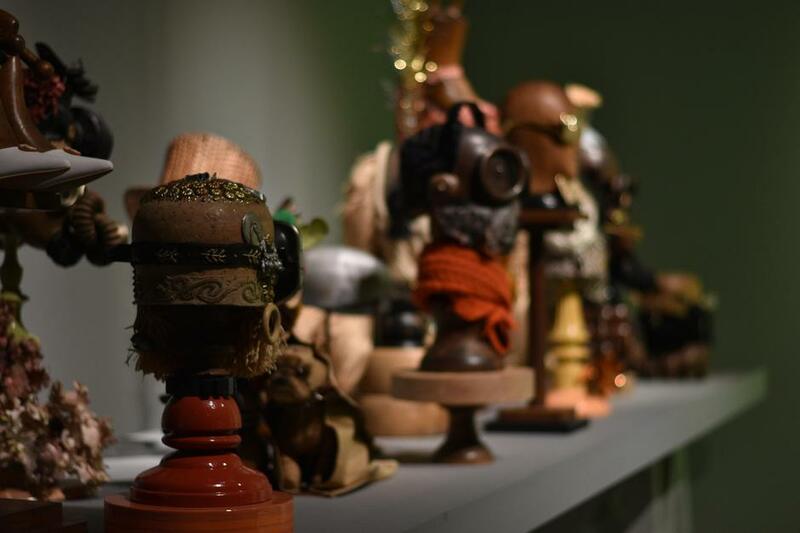 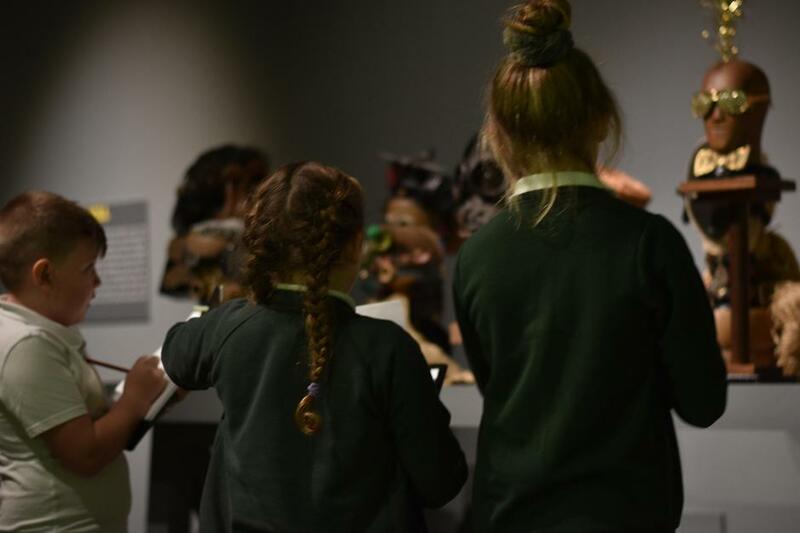 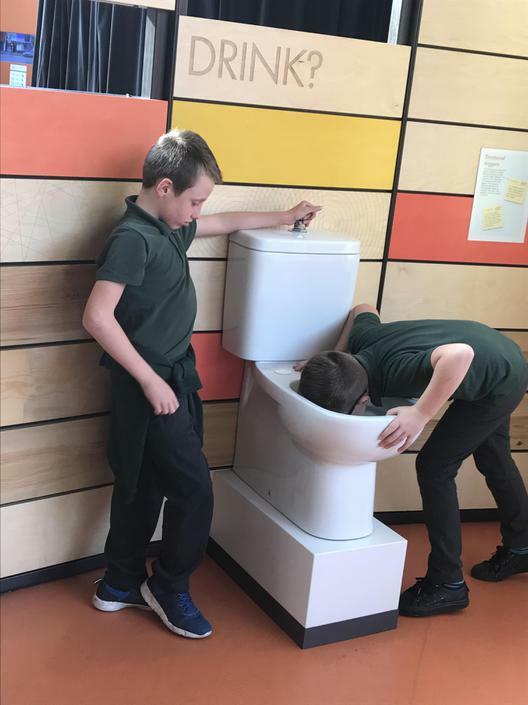 Year 4 have already had a visit to Bowes Museum in Barnard Castle to visit The Clockwork Garden, which is an interactive exhibition. 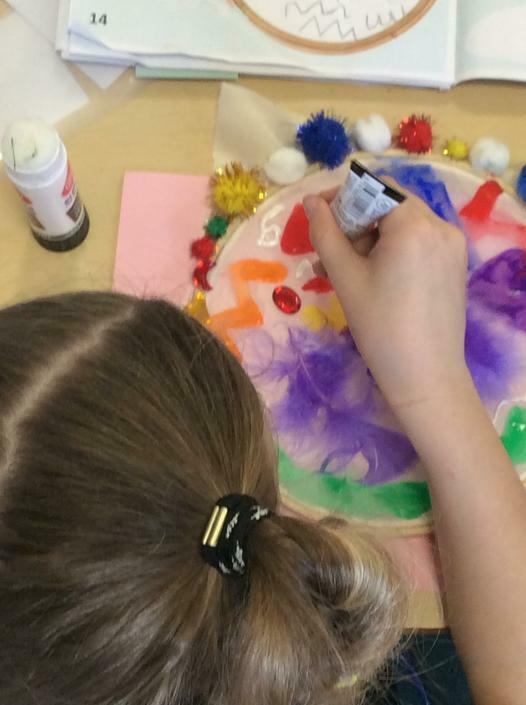 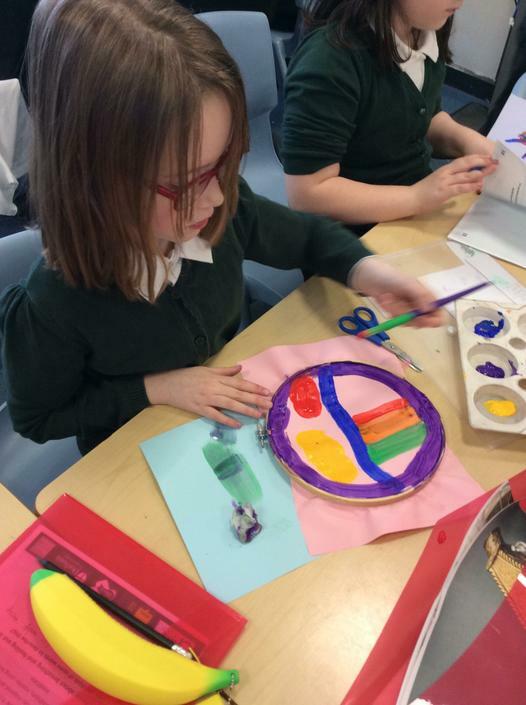 We also looked at the Tulip art work around the museum and had the opportunity to go into the art room and produce our own works of art with tulips. 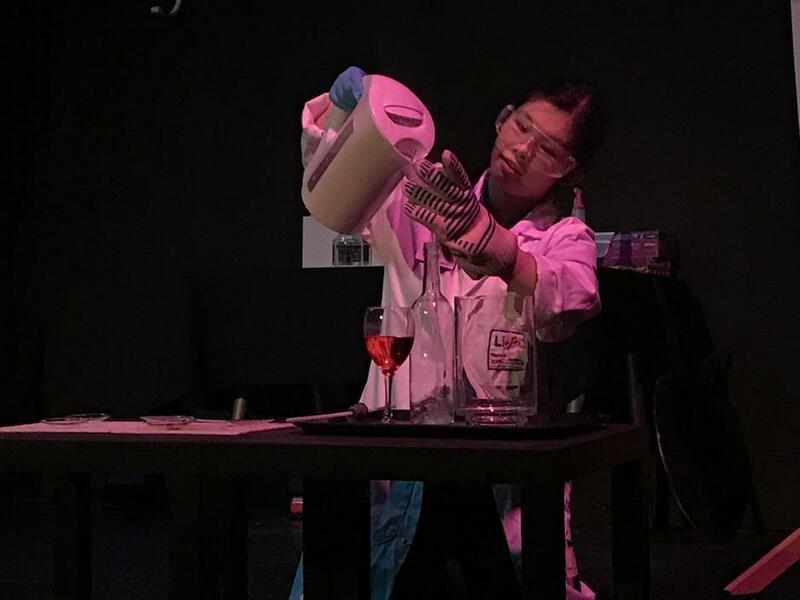 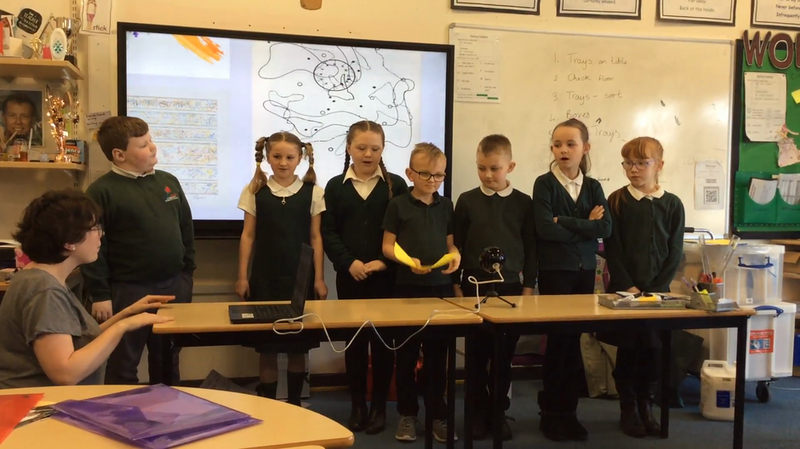 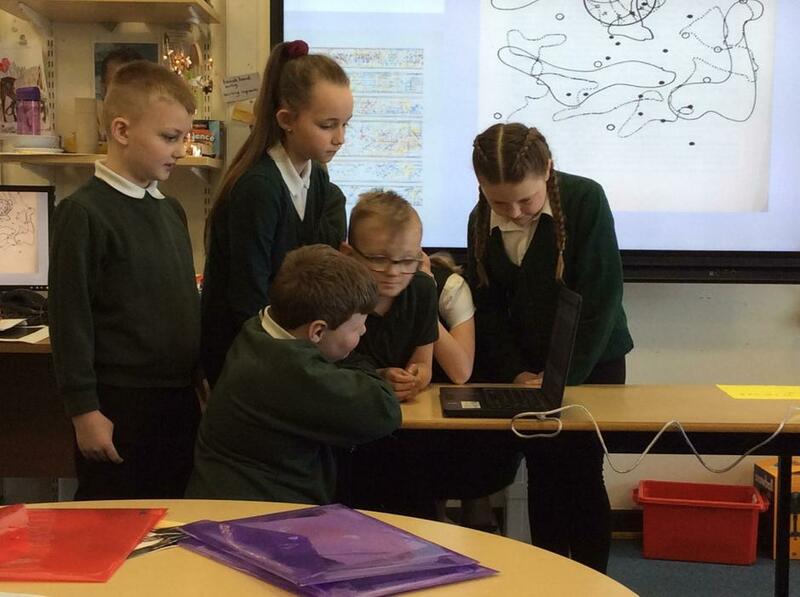 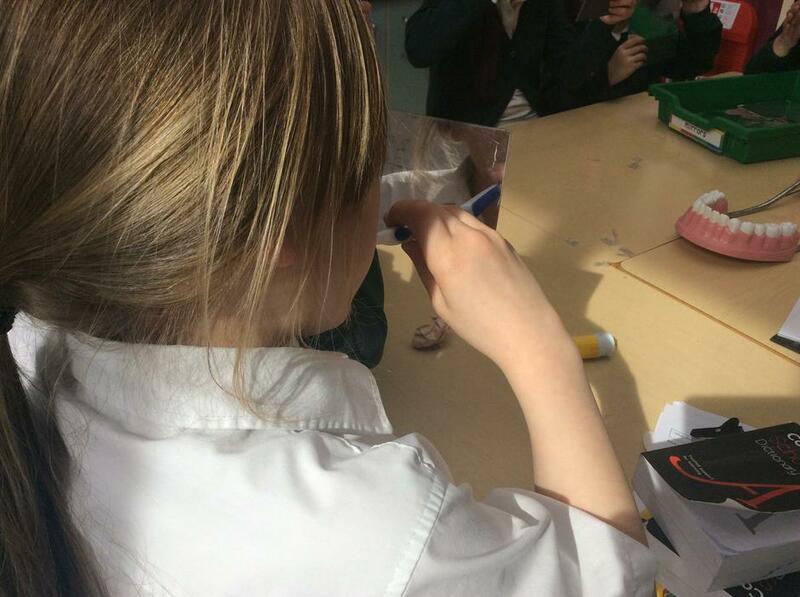 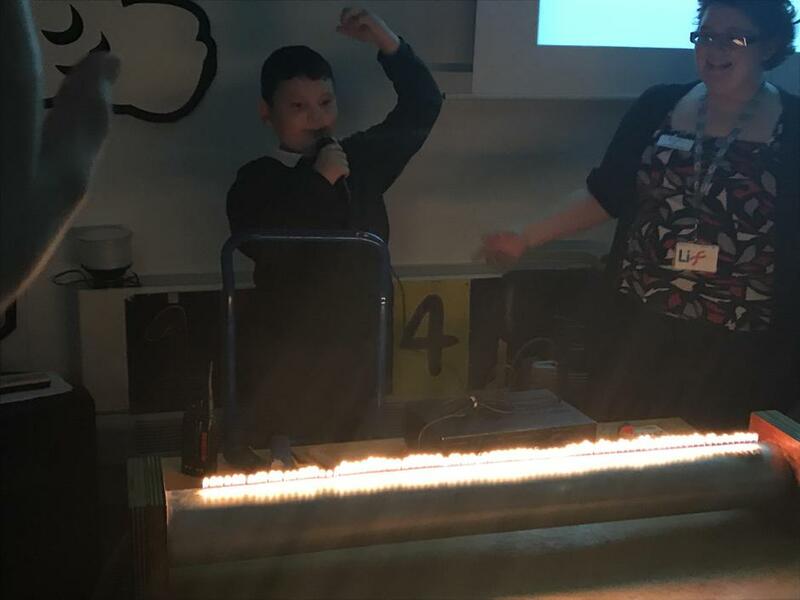 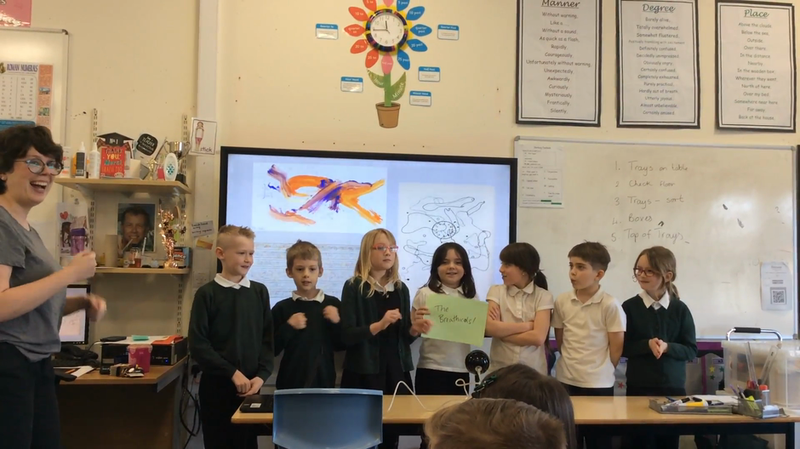 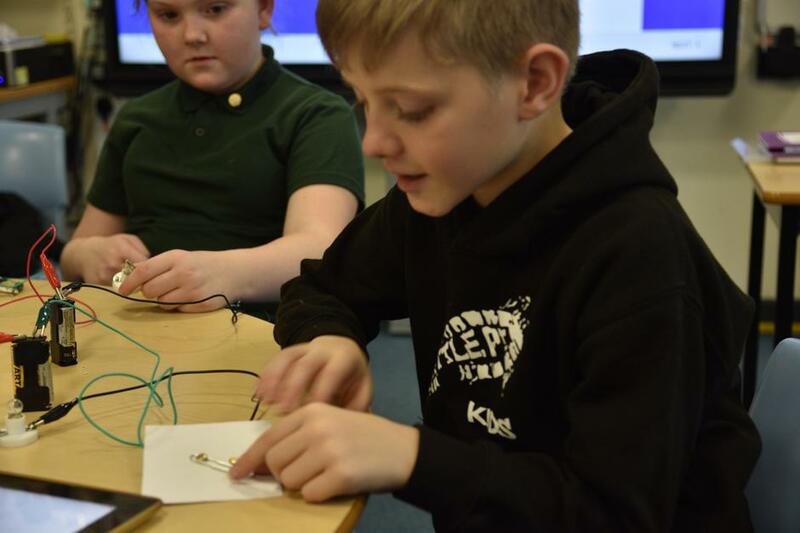 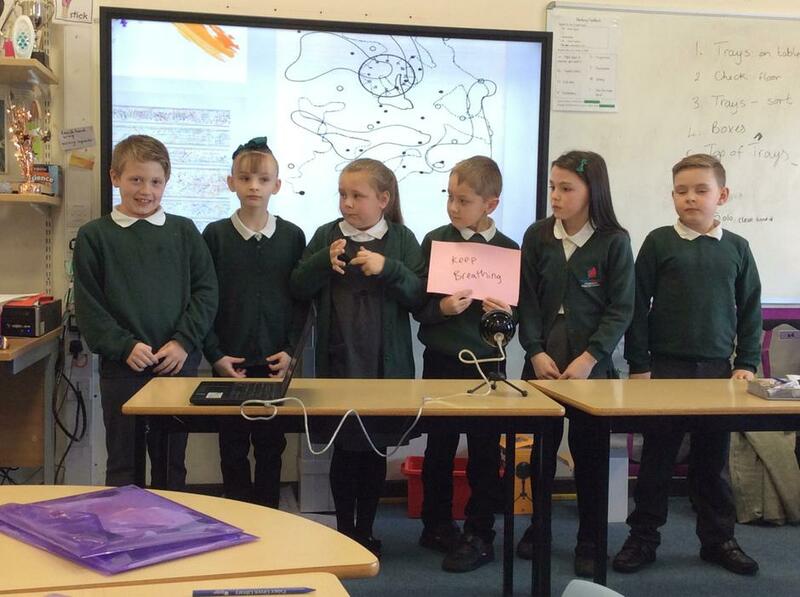 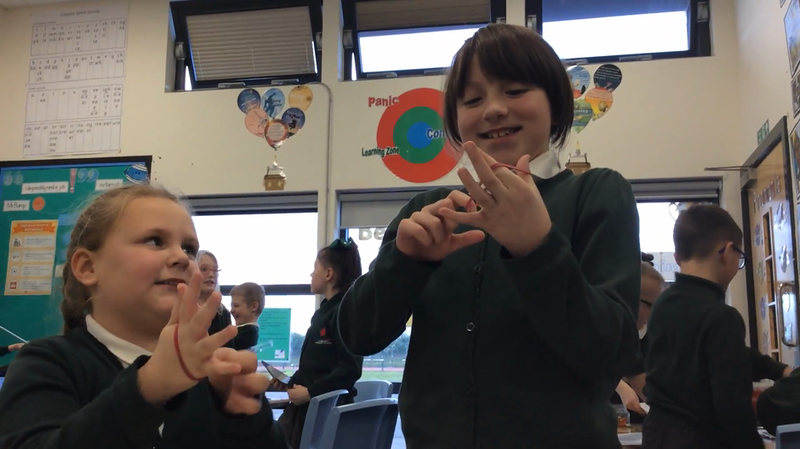 Our Science topic this term is sound, we have been producing presentations for the class explaining how we hear and then made string telephones and explaining how they work through vibrations. 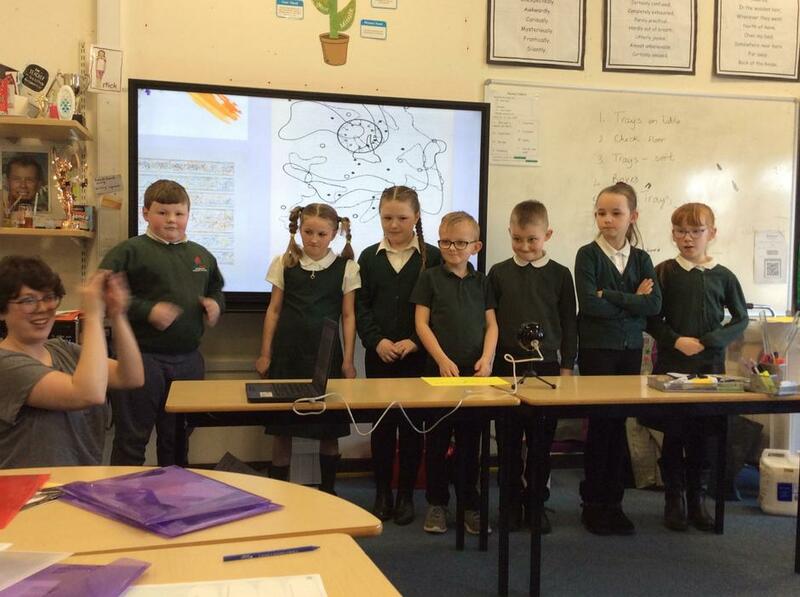 It is a privilege to be working in year 4 again and with the same fantastic class I had in year 1. 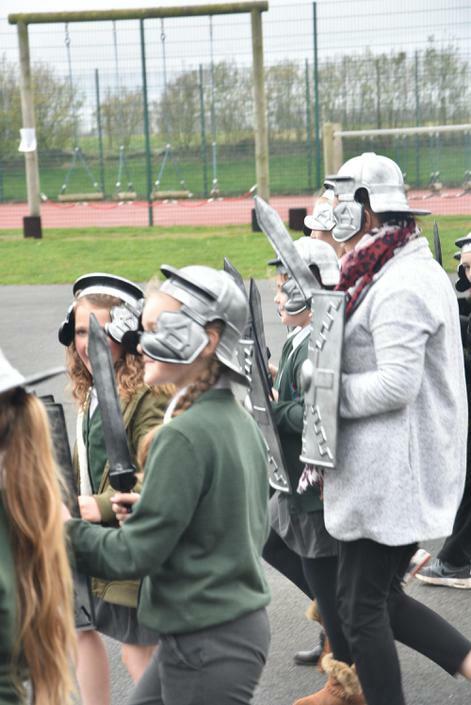 I have been teaching for over 20 years and have been lucky enough to teach throughout the primary age range from nursery to year 6. 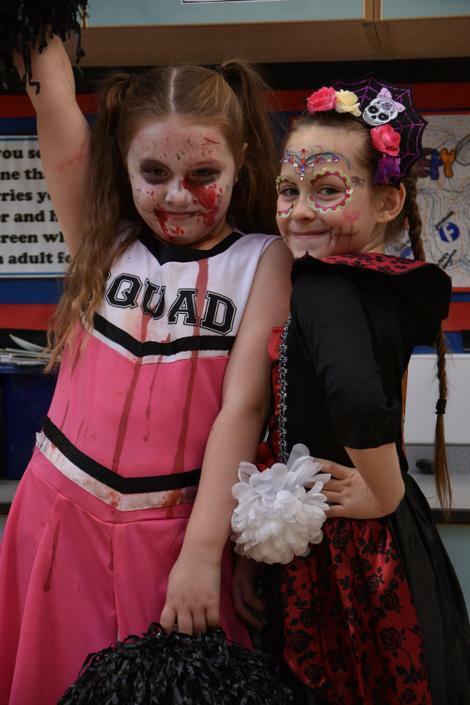 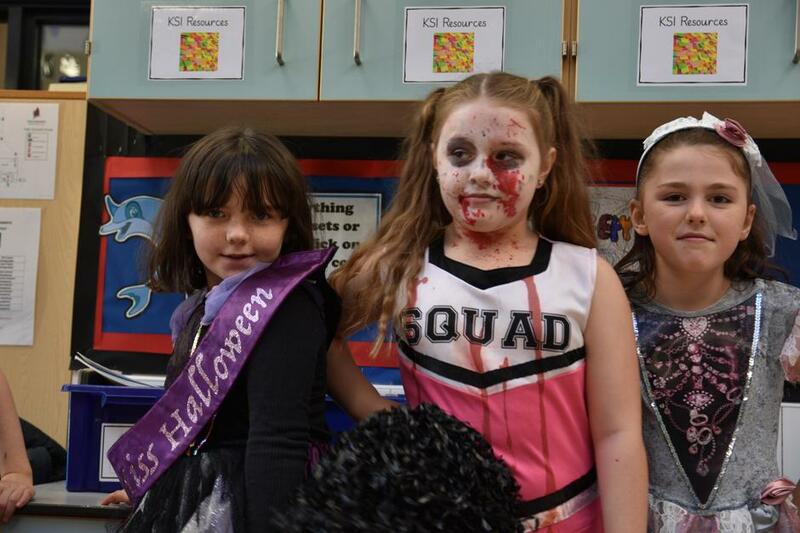 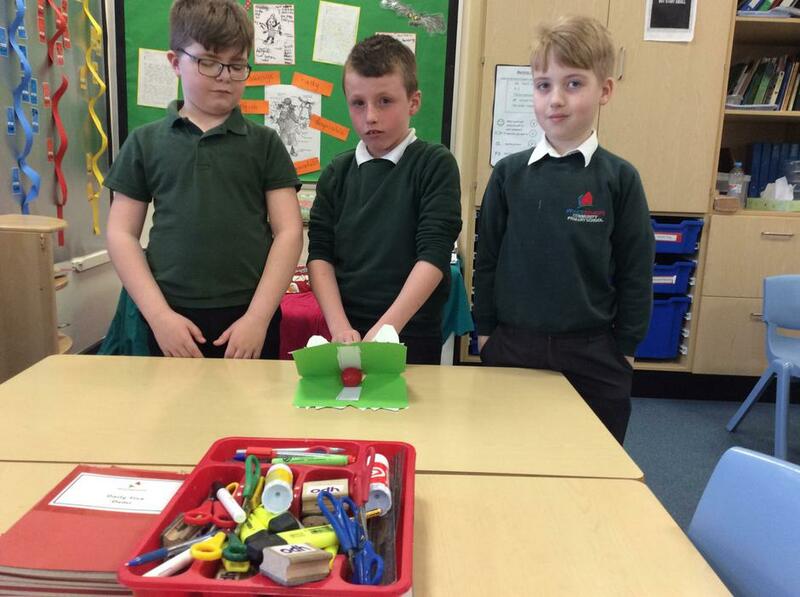 Please scroll down for information about our learning and events in Year 4. 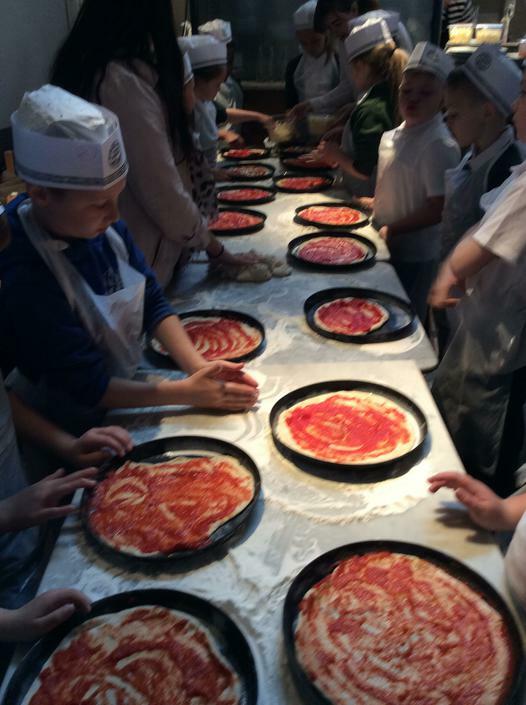 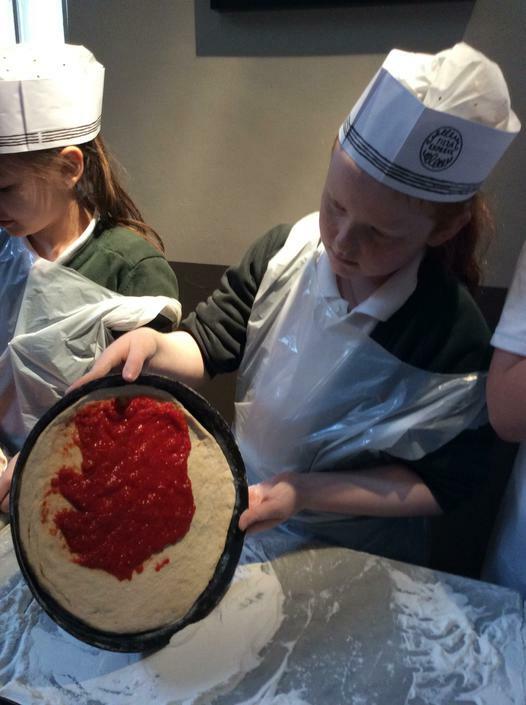 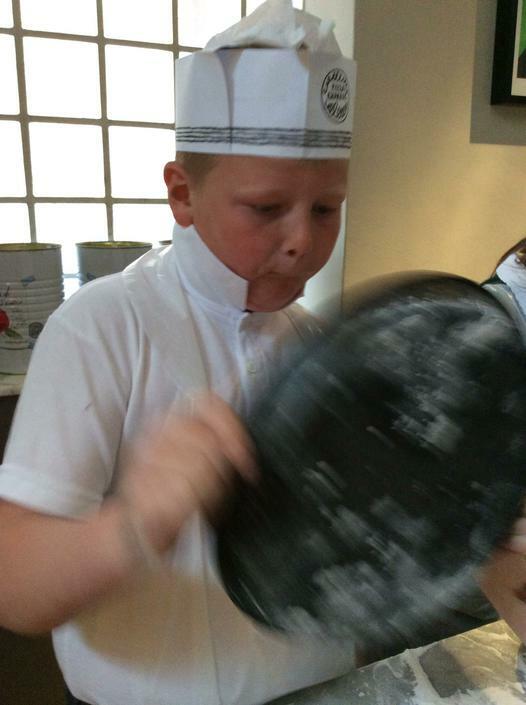 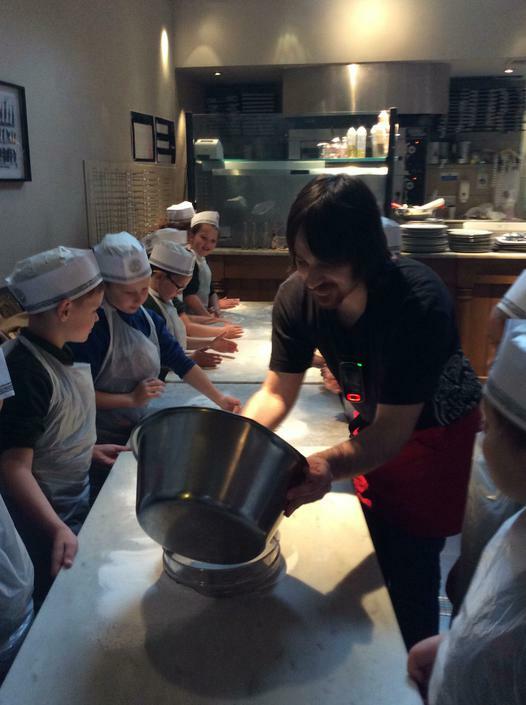 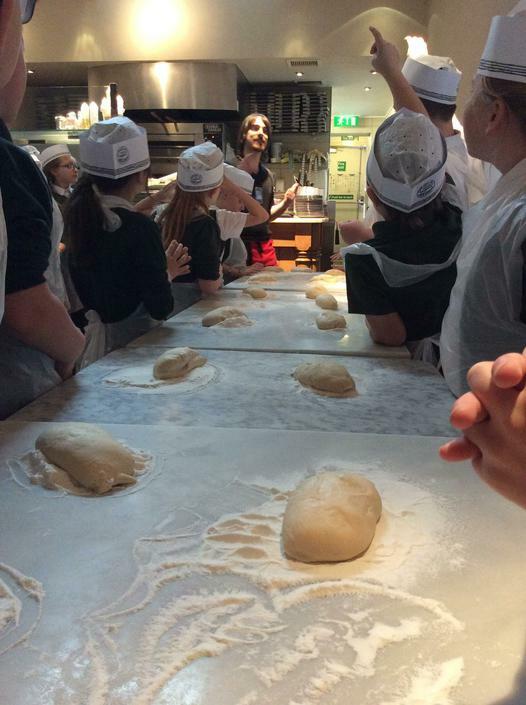 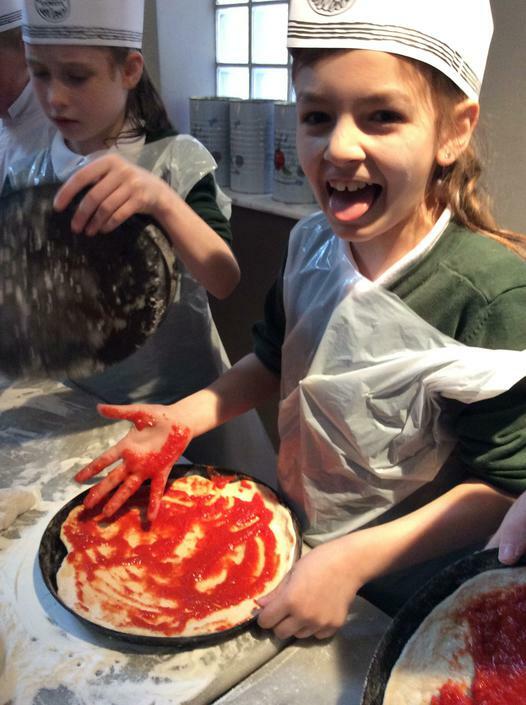 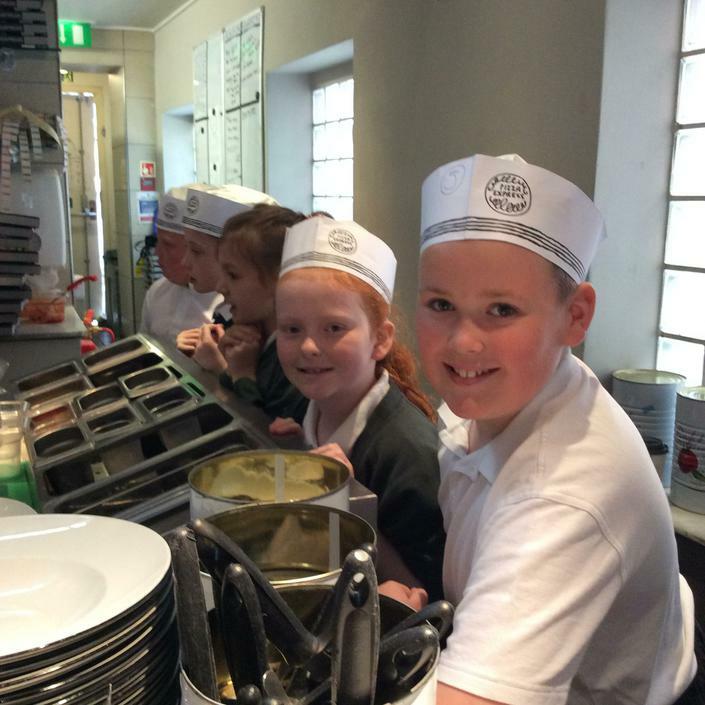 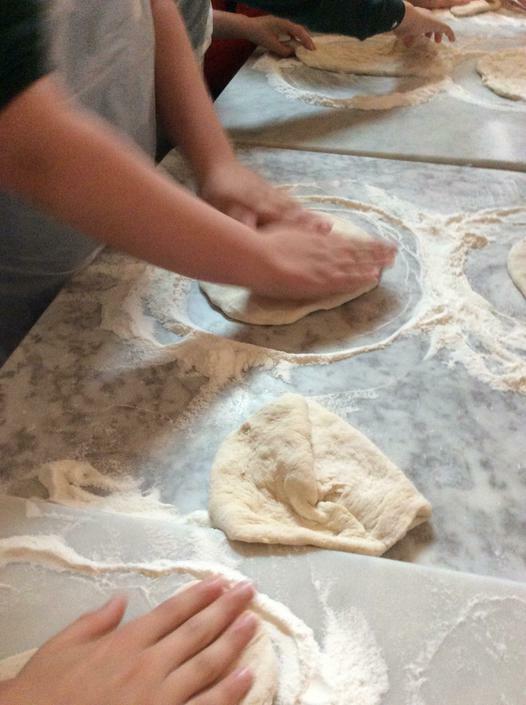 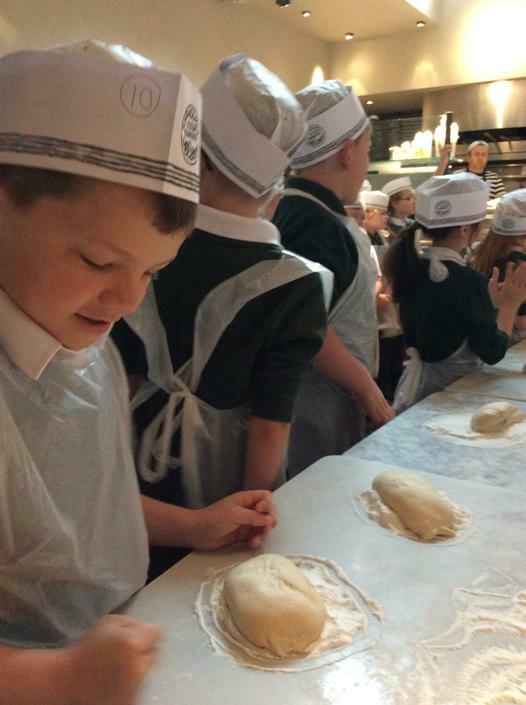 Class 4 have just been to Pizza Express in Durham, where we have made our own pizzas. 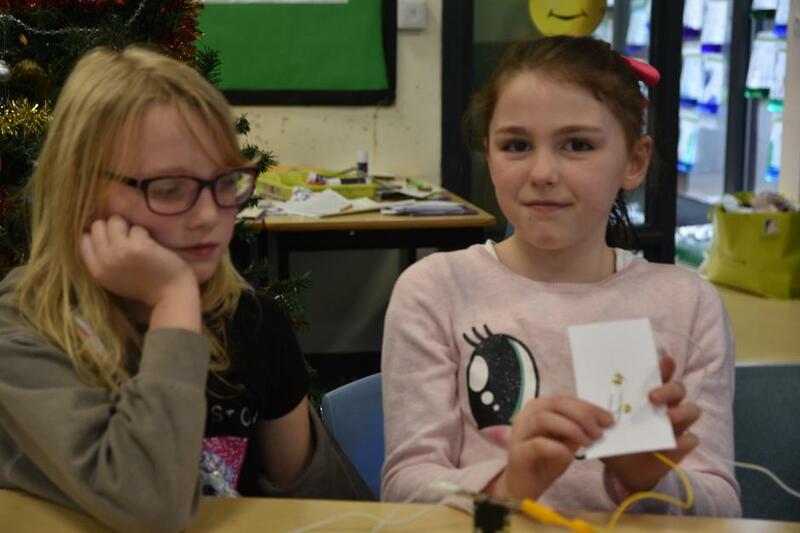 Welcome back after the Christmas break, we hope you have had a fantastic break. 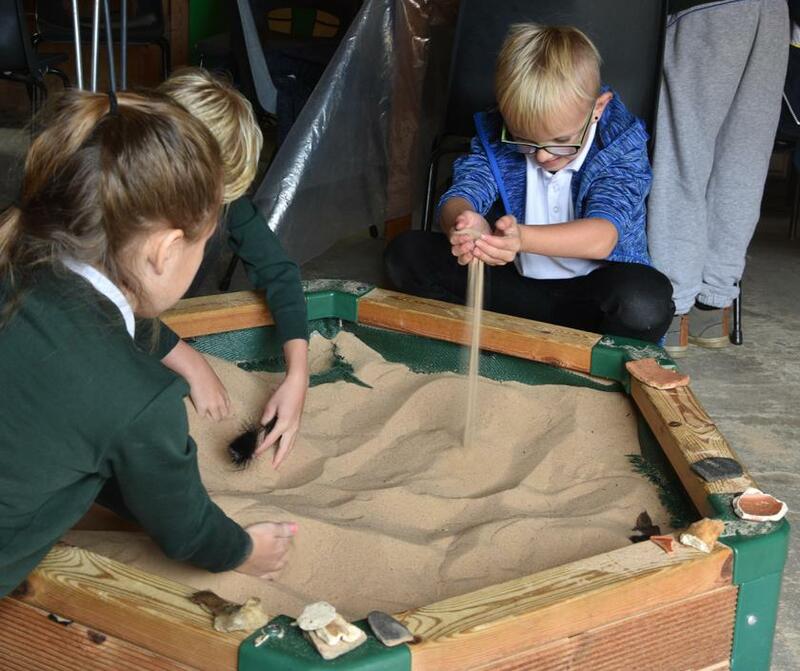 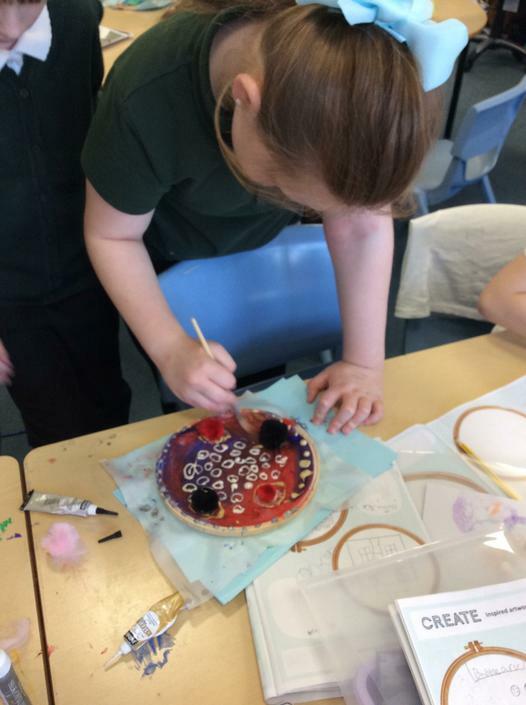 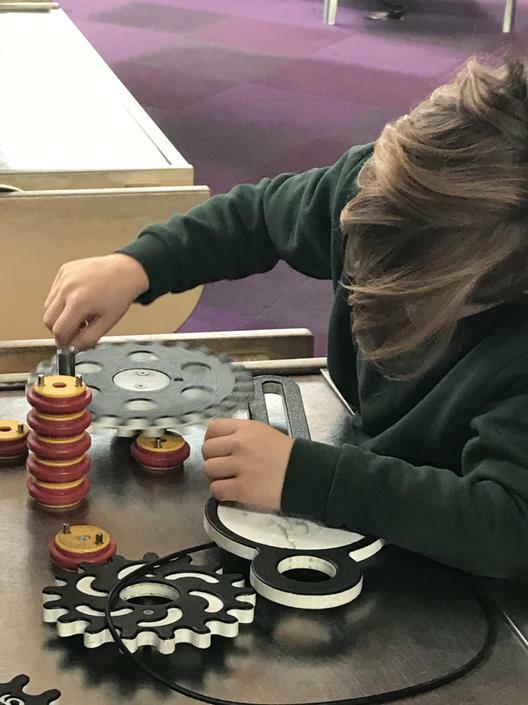 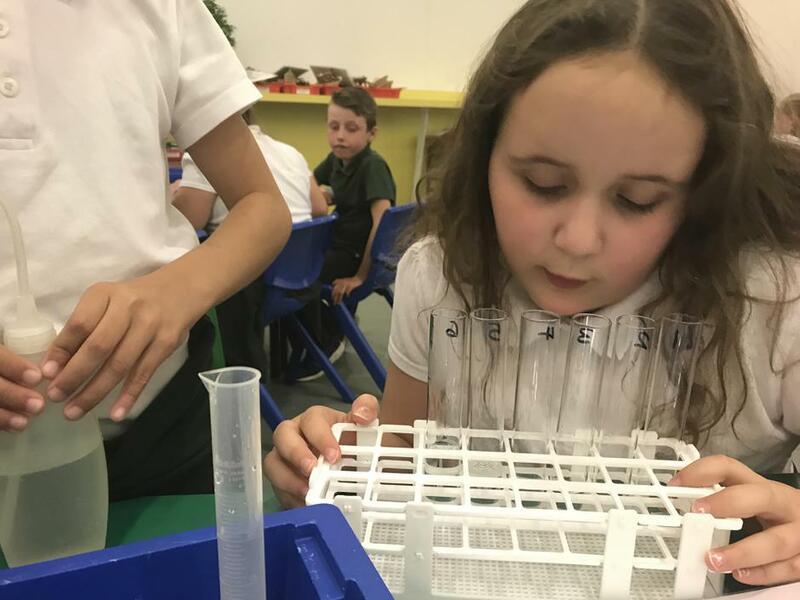 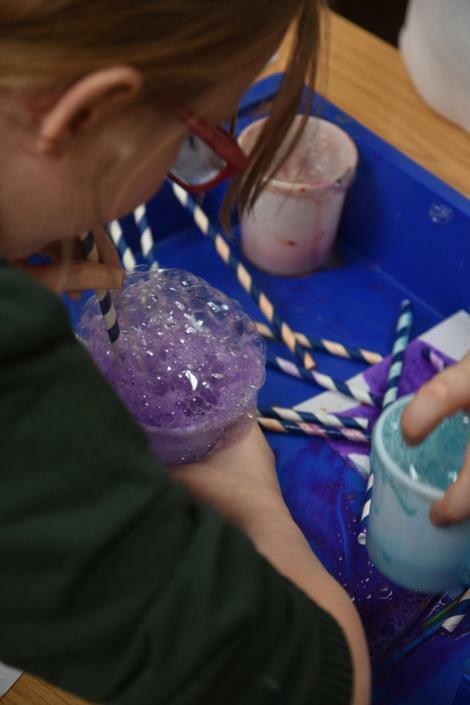 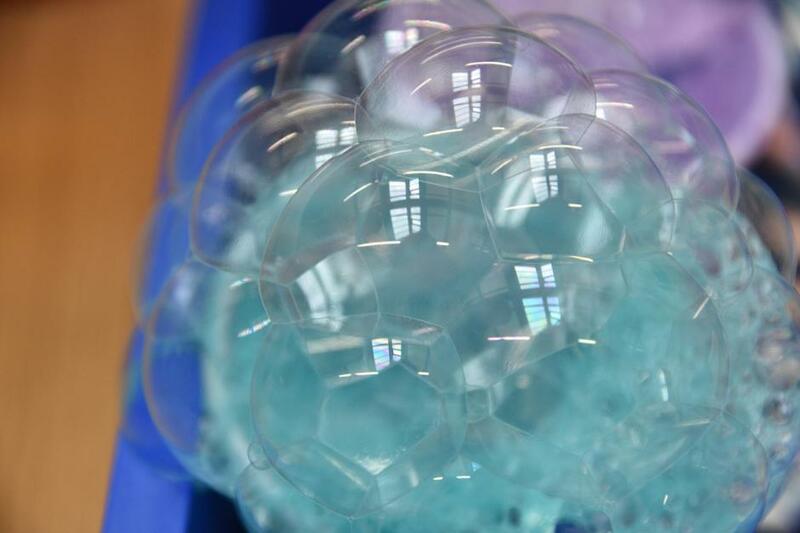 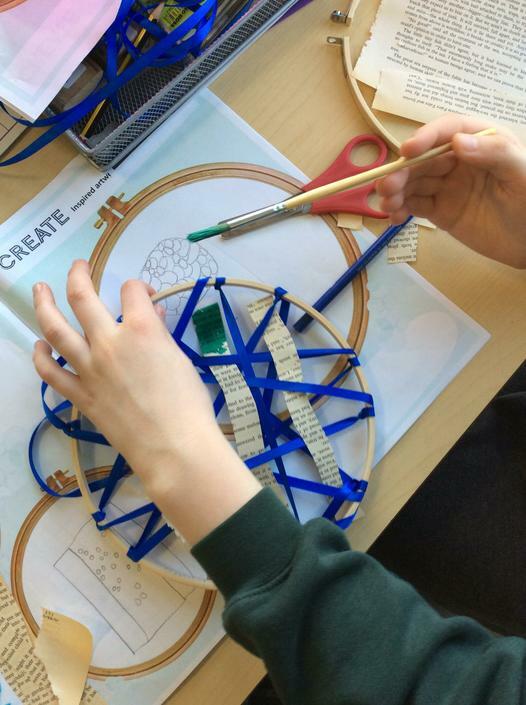 Since coming back in the New Year we have been busy with many different things, take a look at some of the exciting things year 4 have been working on. 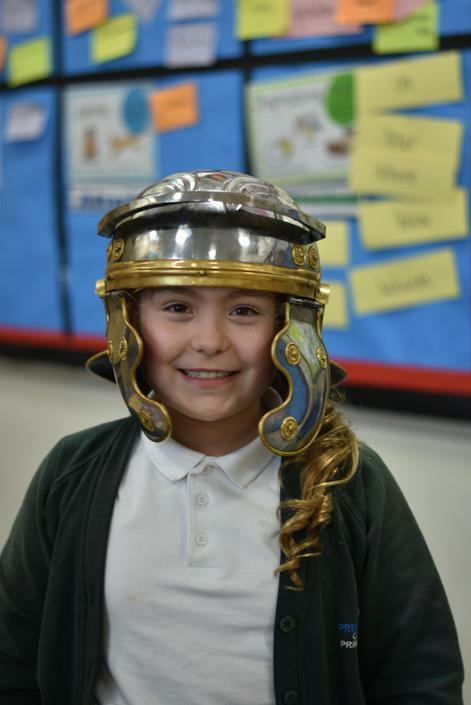 Class 4 had a fantastic day when a Roman came to visit us. 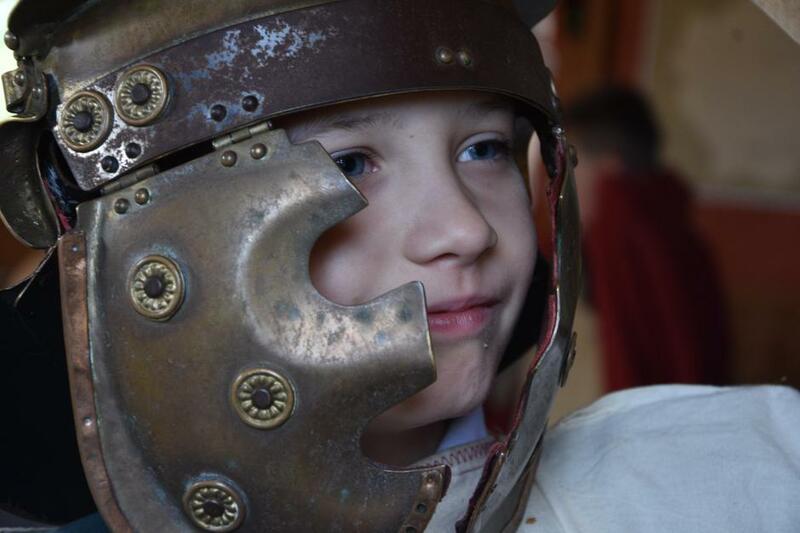 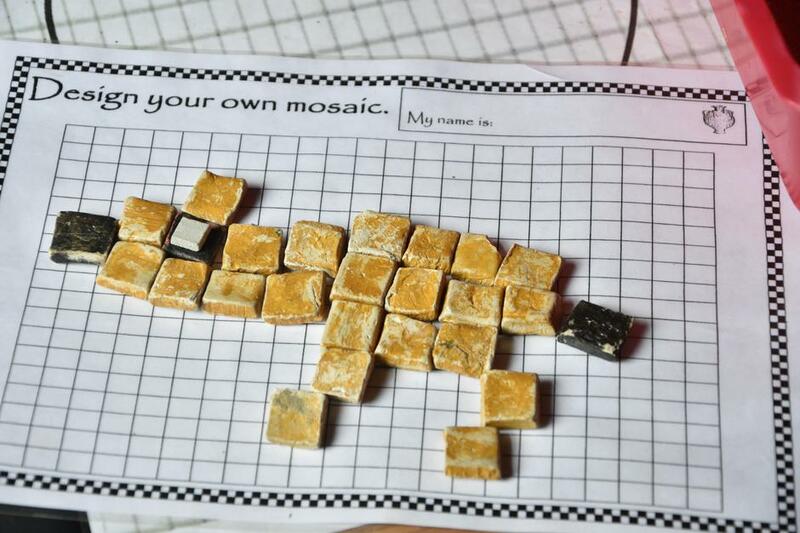 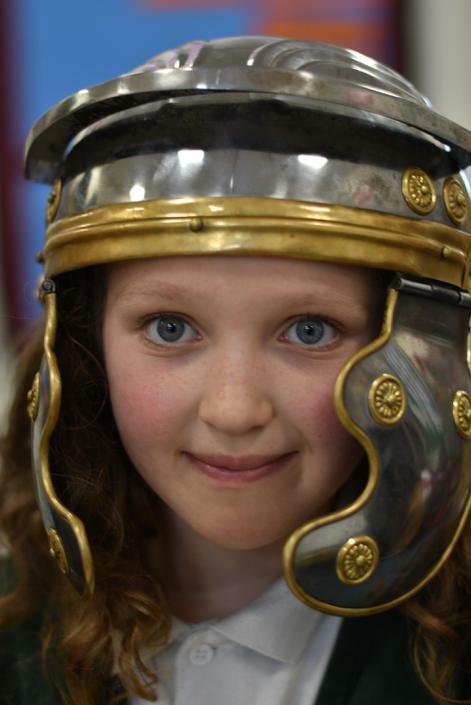 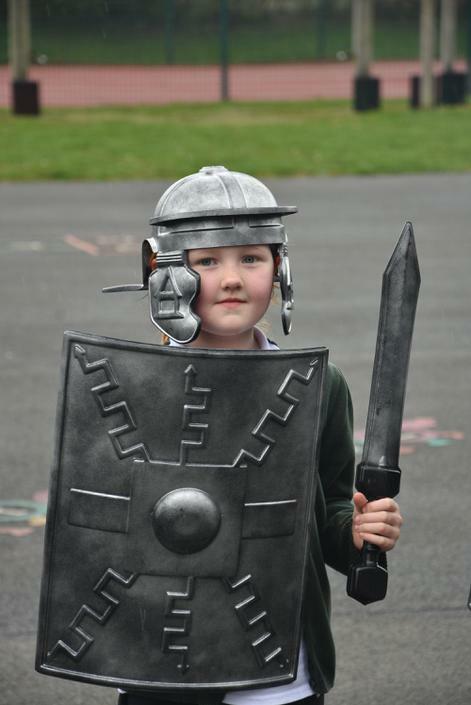 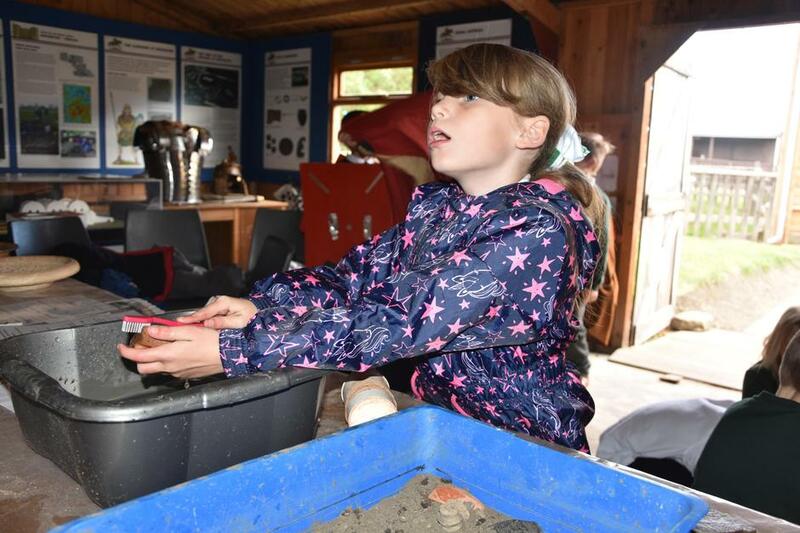 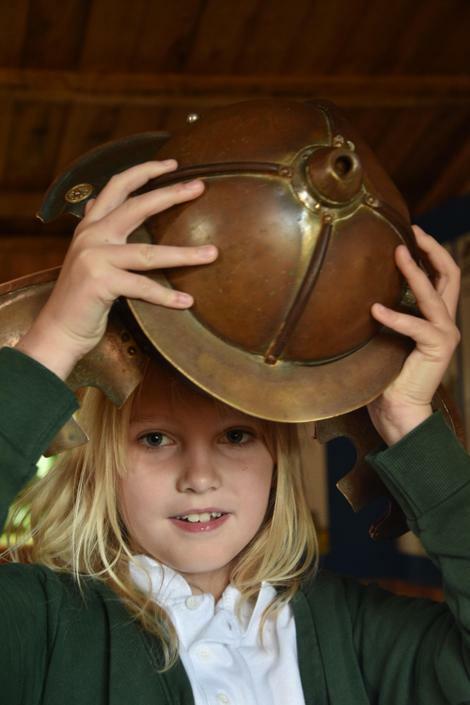 We were able to look at and handle weapons and armour, play Roman games, make mosaics and try our hand at Roman writing. 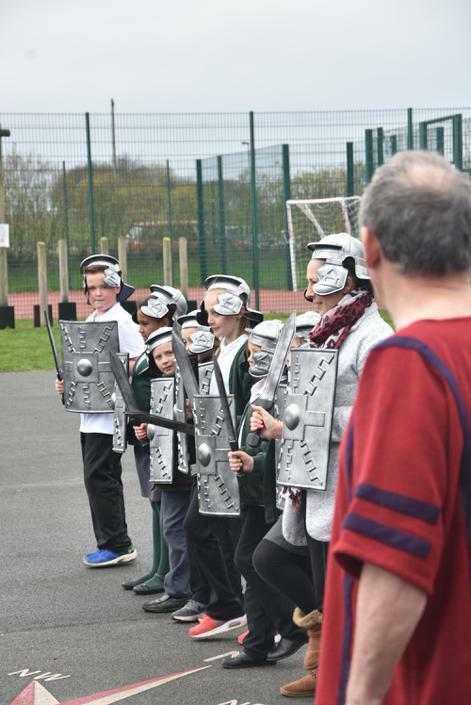 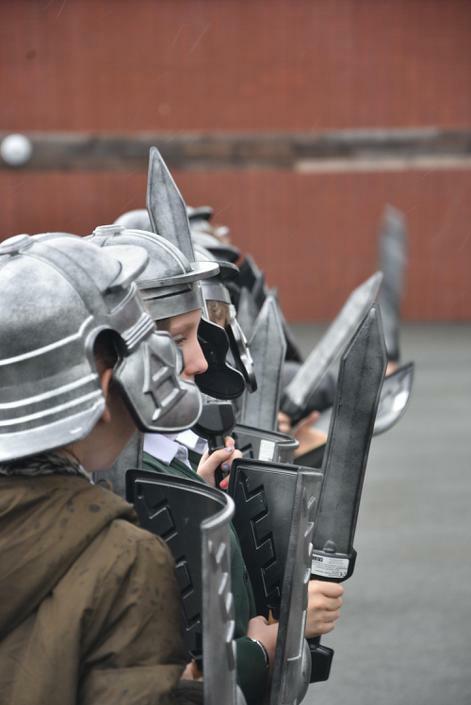 We really enjoyed learning about some of the armies tactics and drills in Latin. 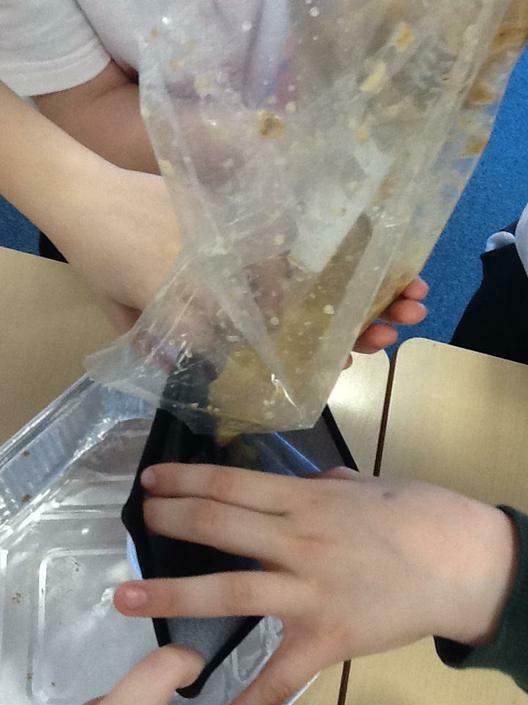 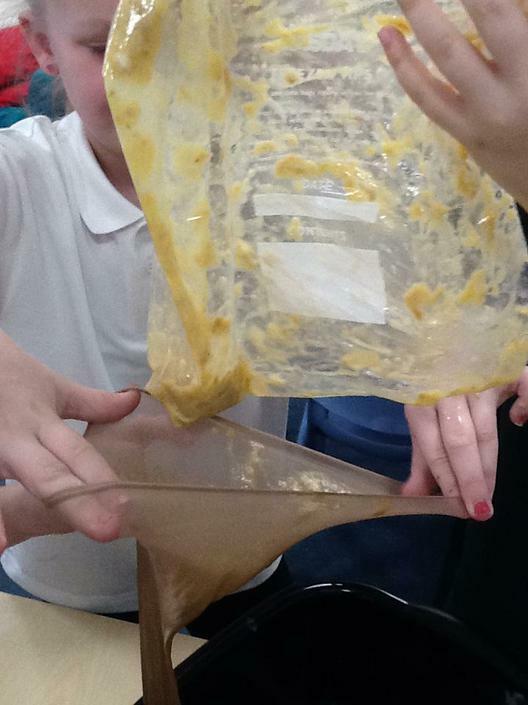 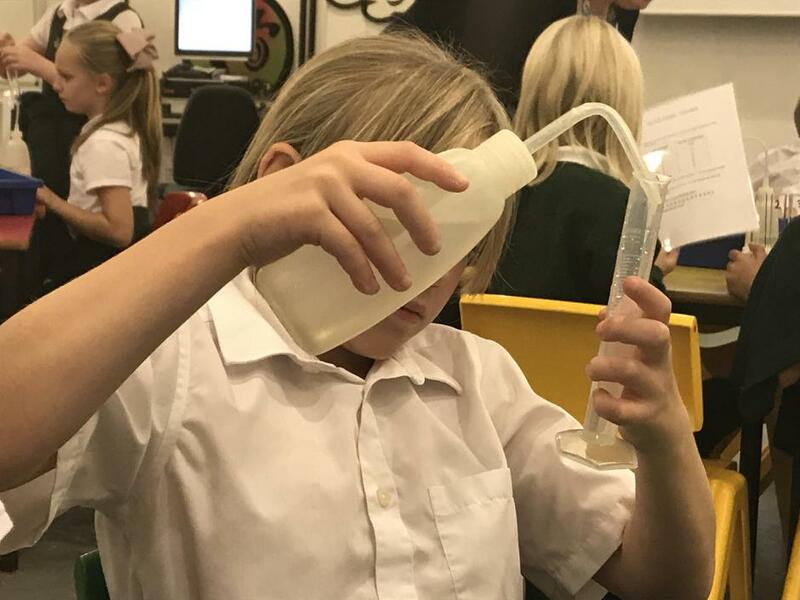 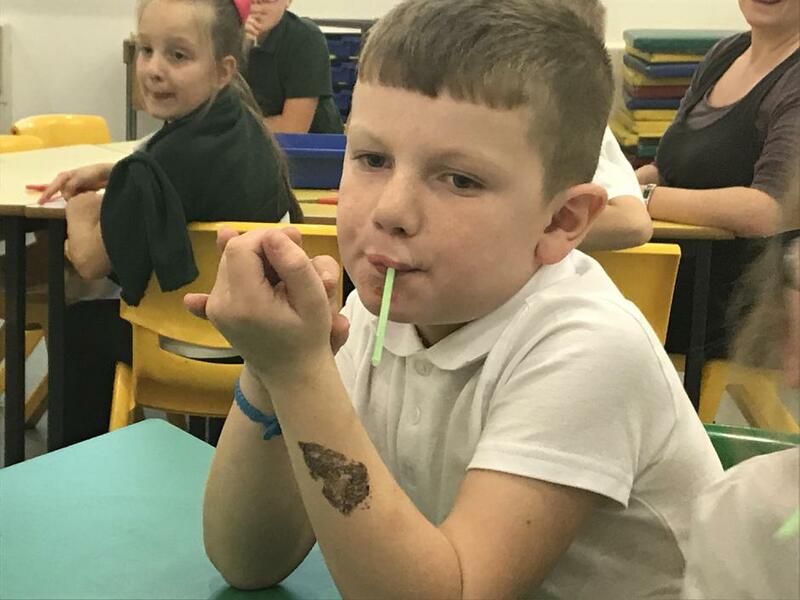 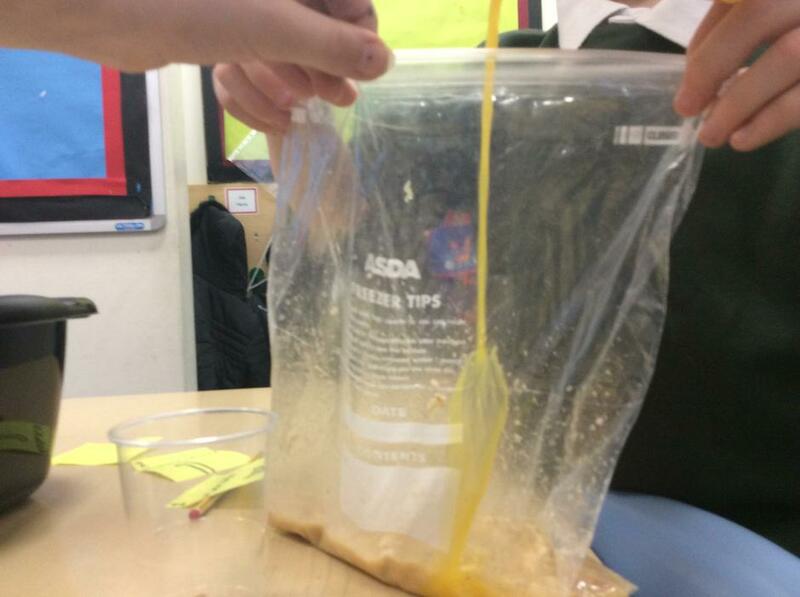 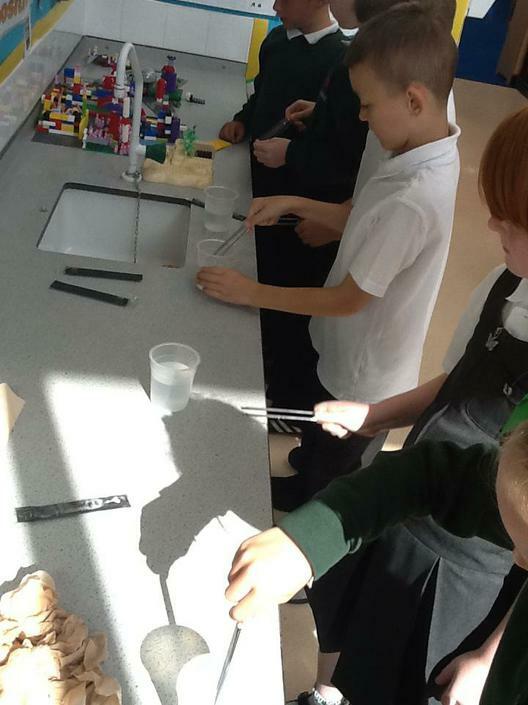 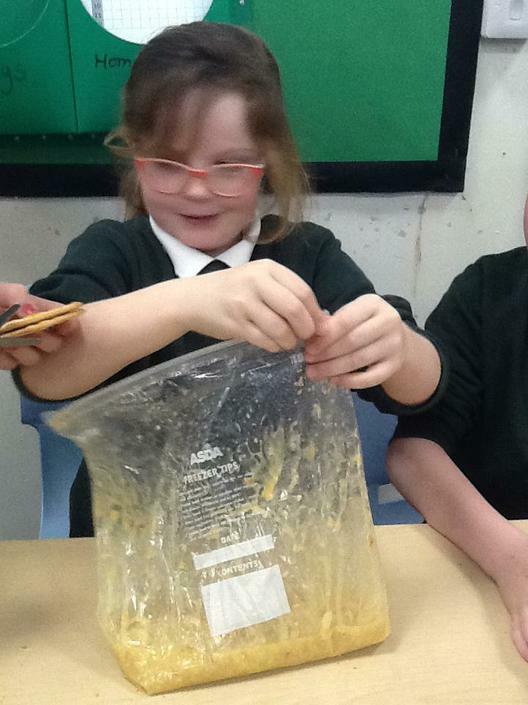 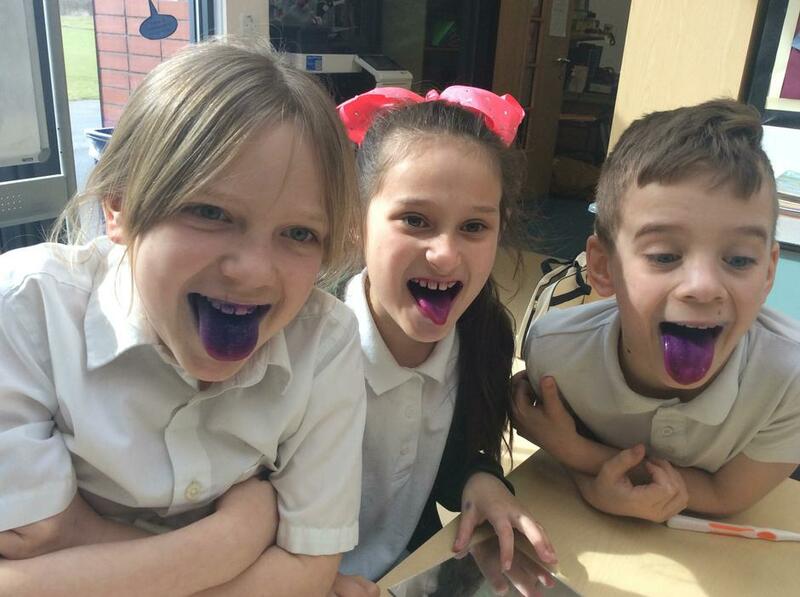 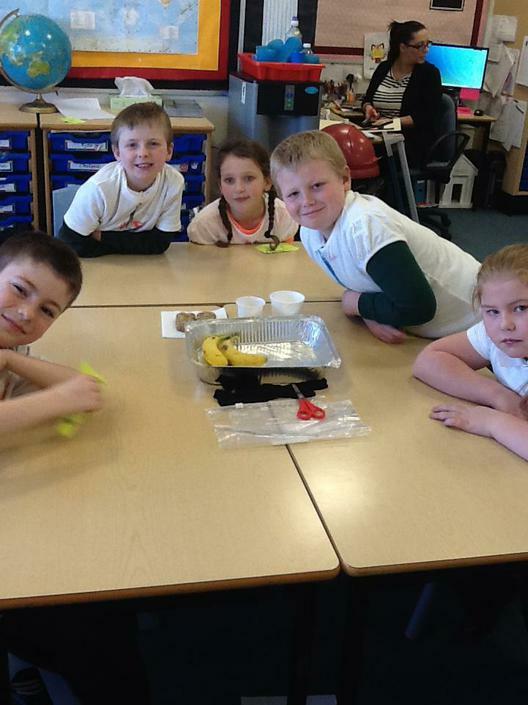 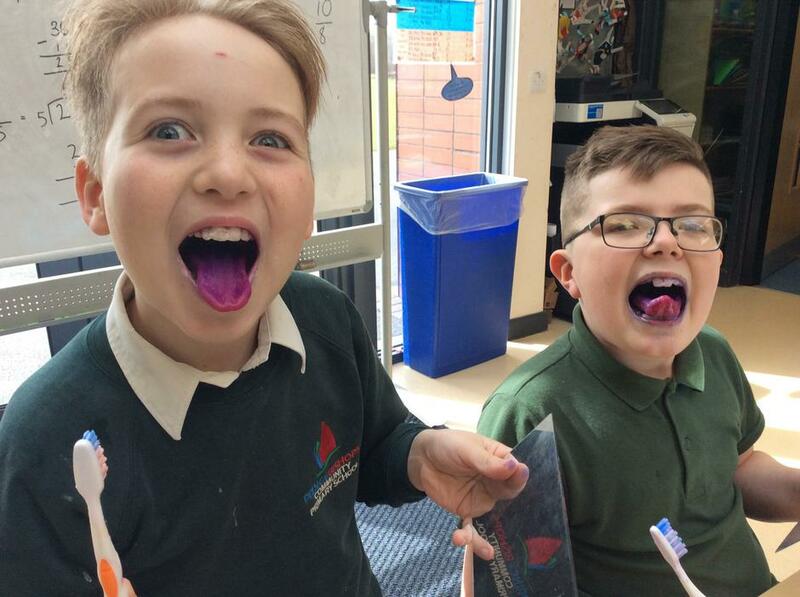 Class 4 have been learning about the digestive system and have carried out an experiment to show how food is carried through our bodies. 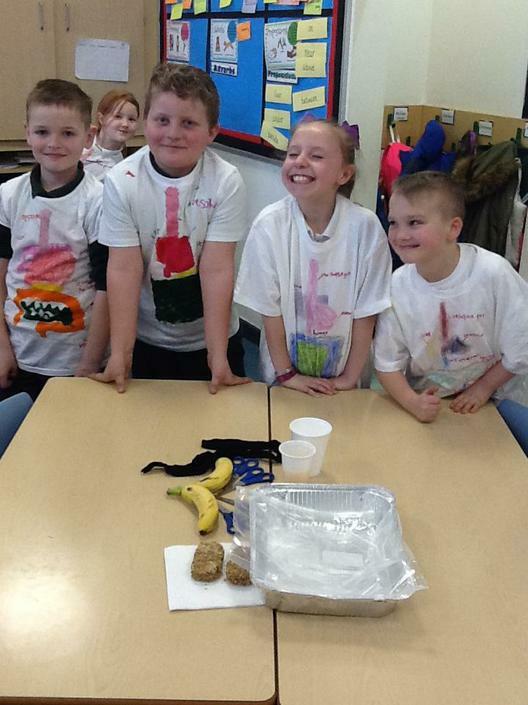 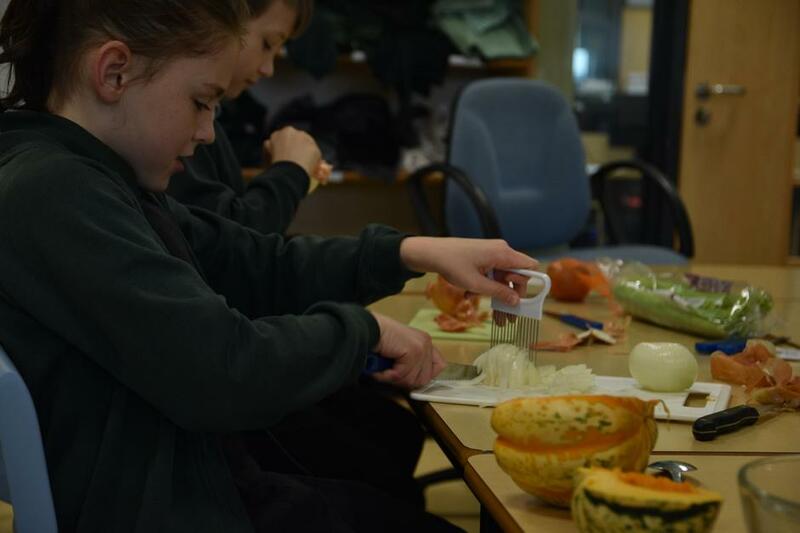 They have learnt what the different parts of the digestive system are called and the jobs they do. 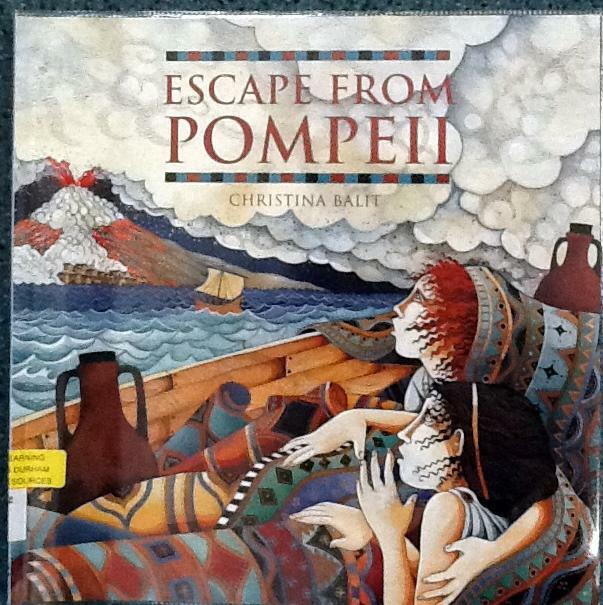 Our topic this term is the Romans, our class book is Escape from Pompeii. 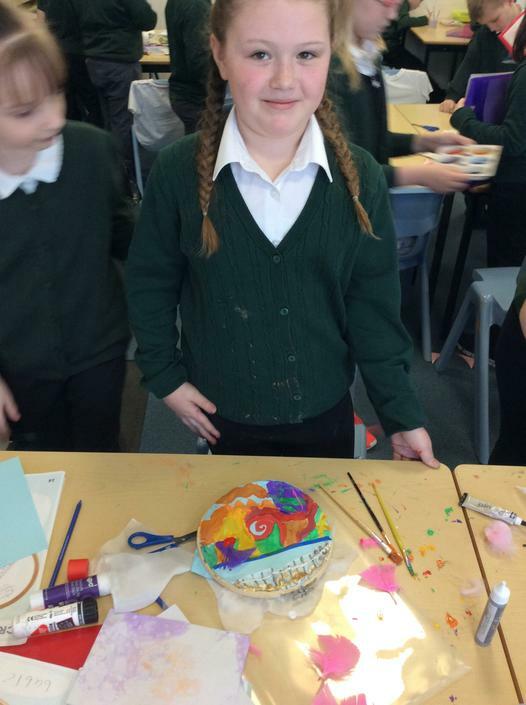 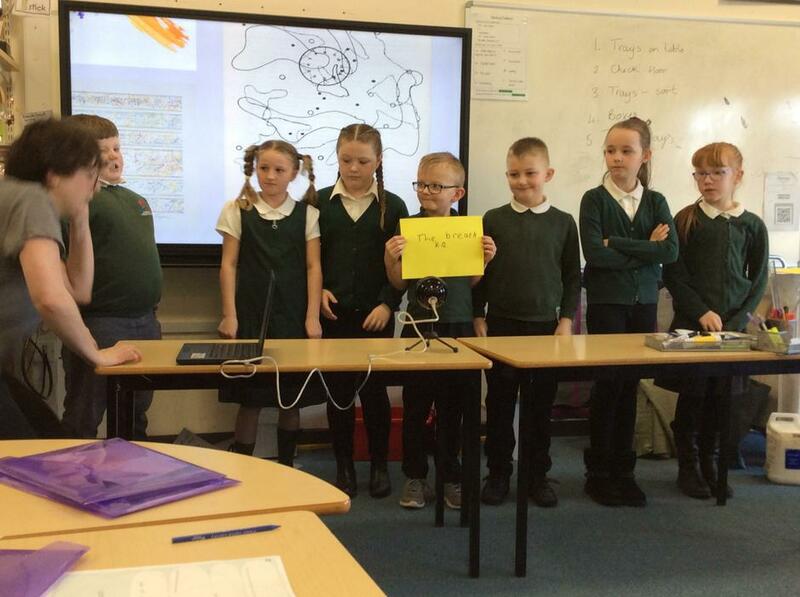 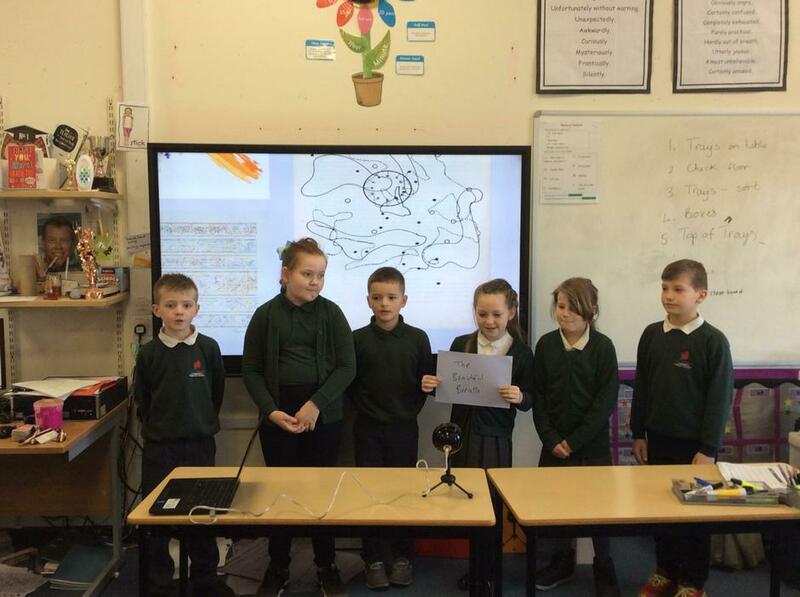 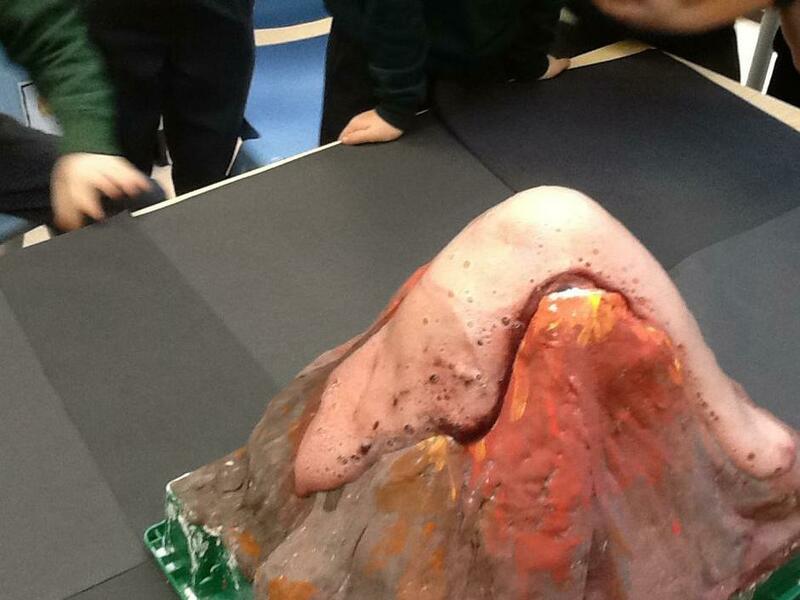 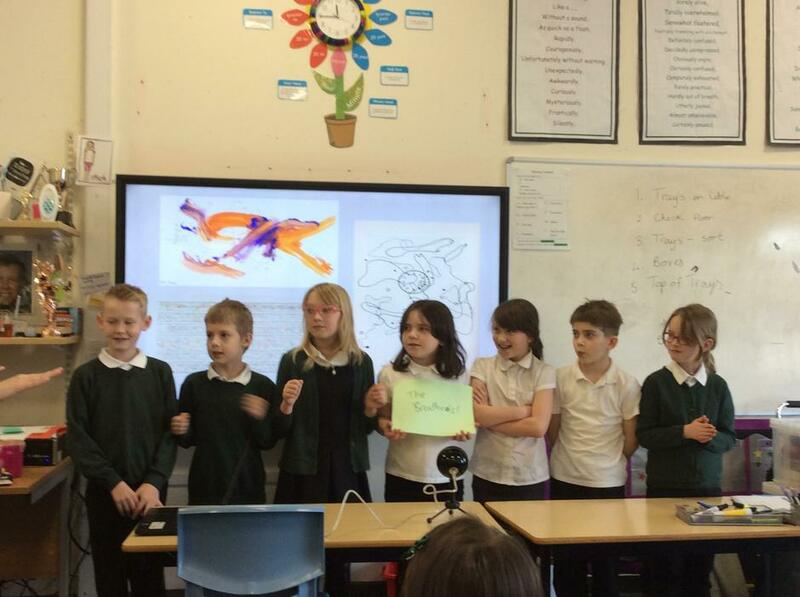 The class have been very interested learning about volcanoes, where they are in the world and how they are formed. 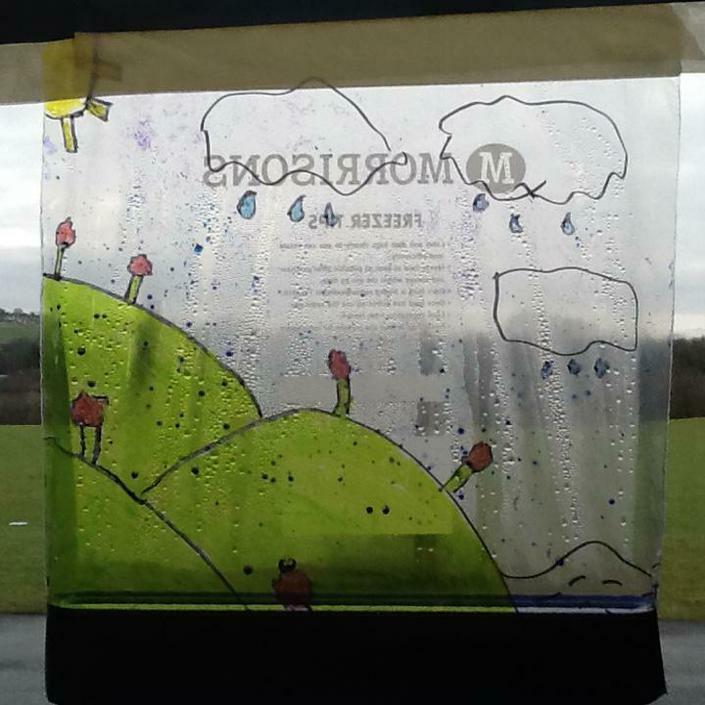 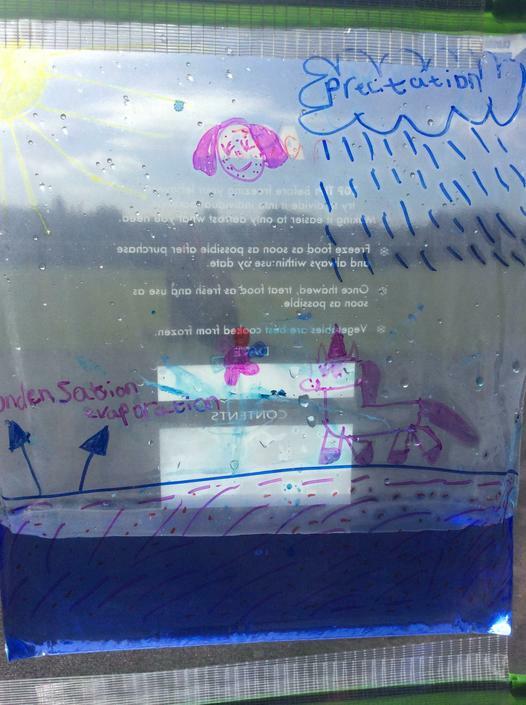 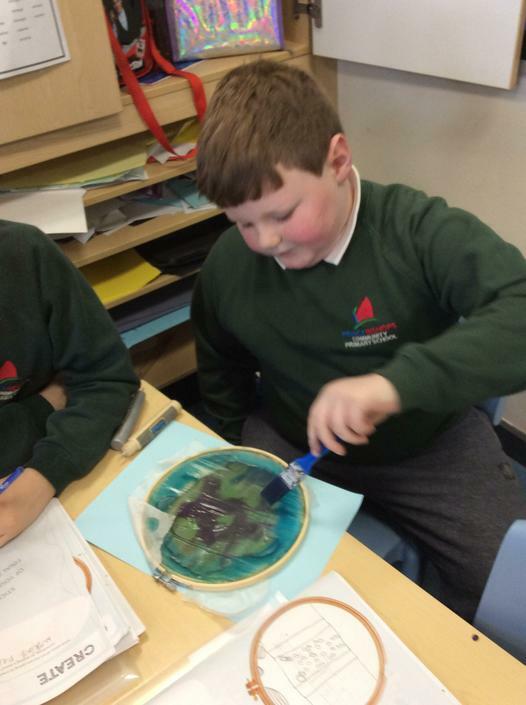 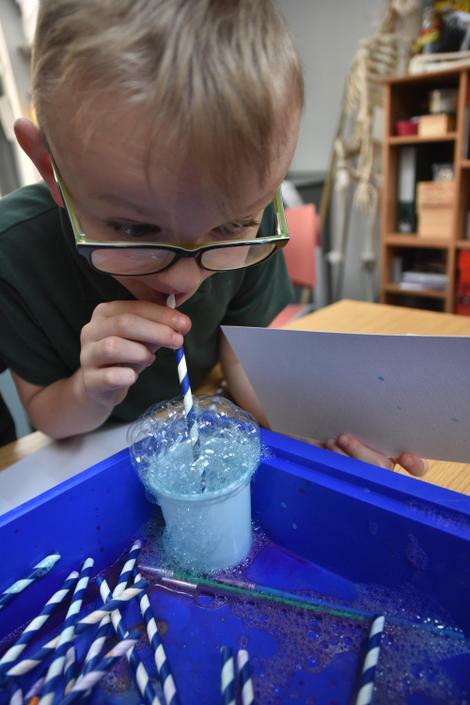 Class 4 have been learning about the water cycle, they all made a water cycle in bag, to show evaporation and condensation. 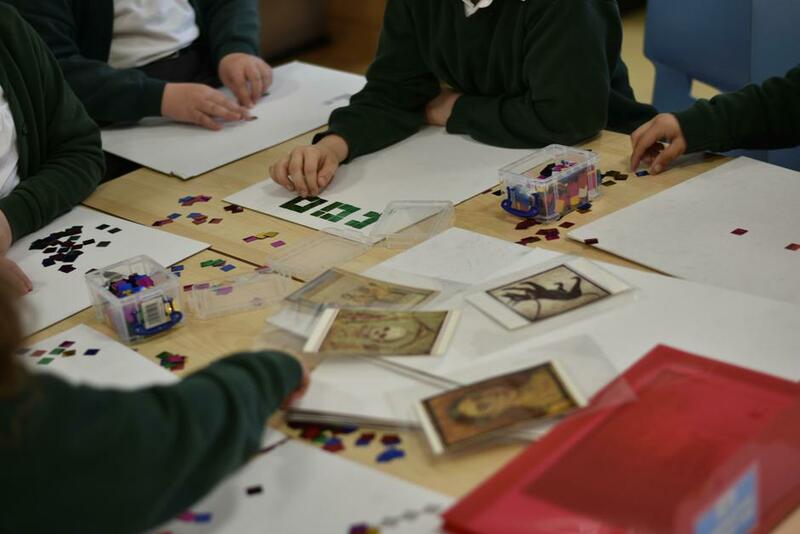 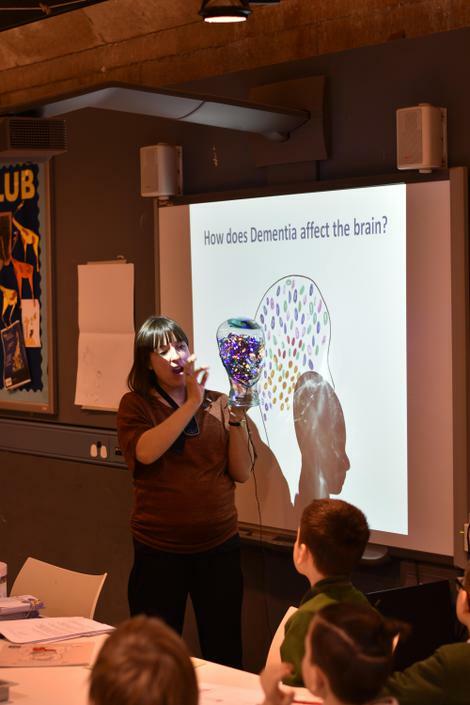 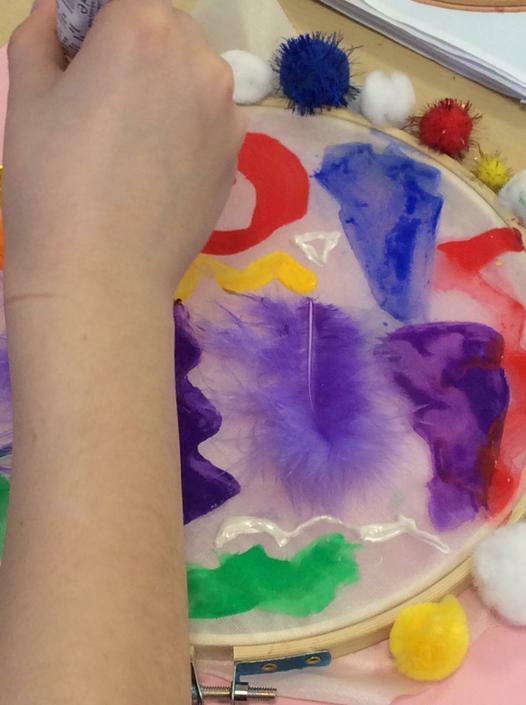 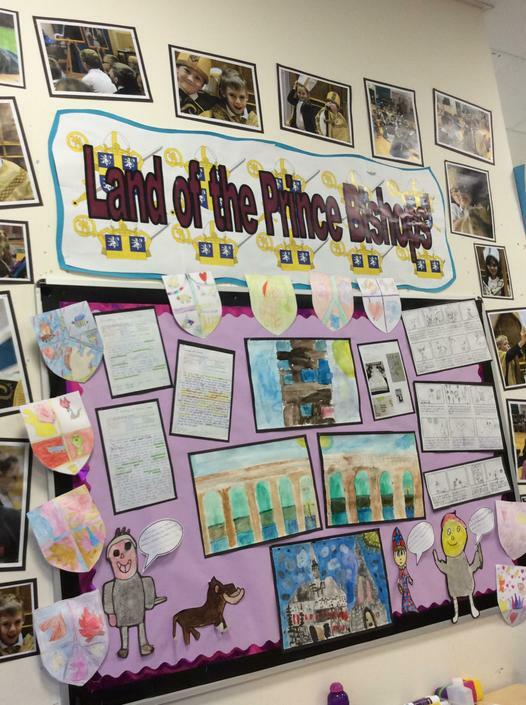 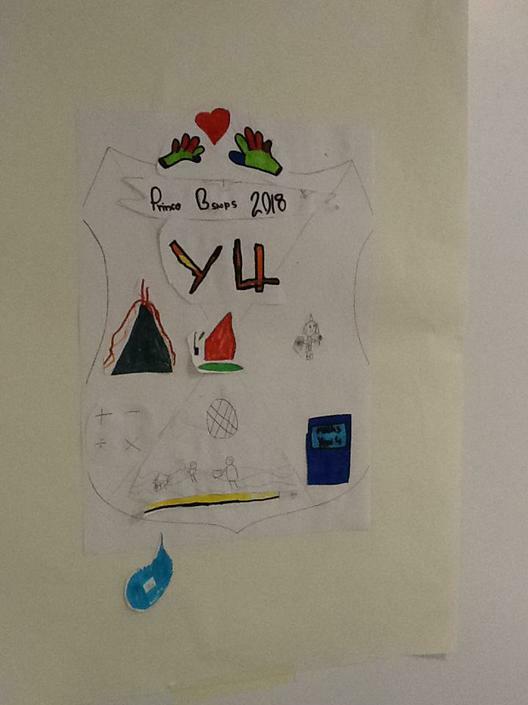 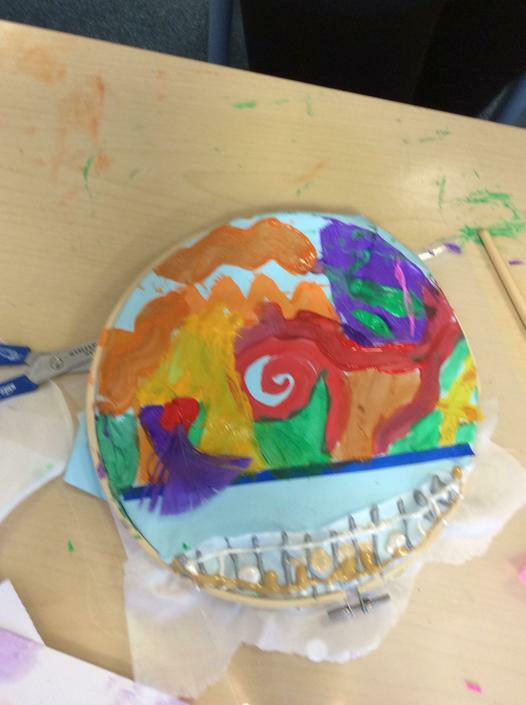 We have been very lucky to have the opportunity to visit Bowes to take part in an art project. 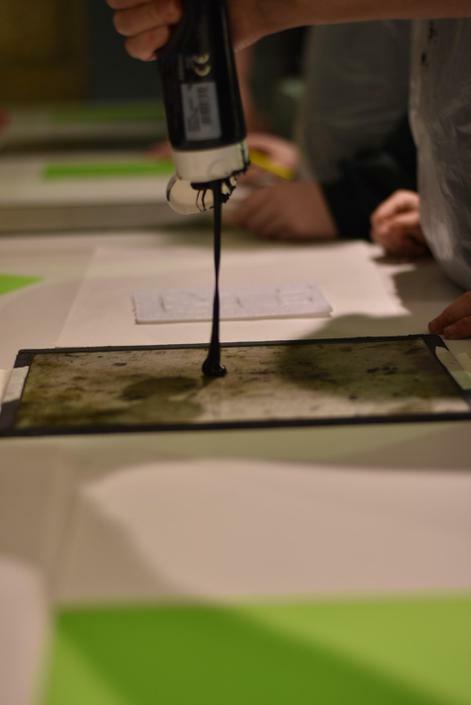 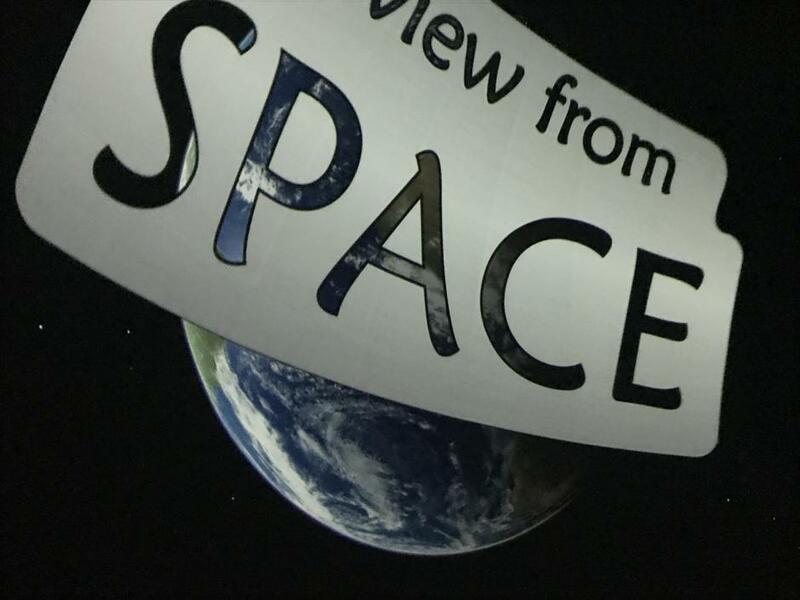 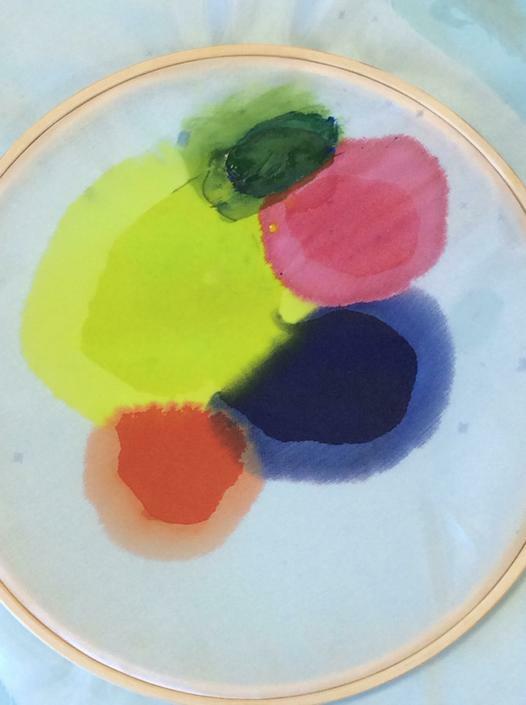 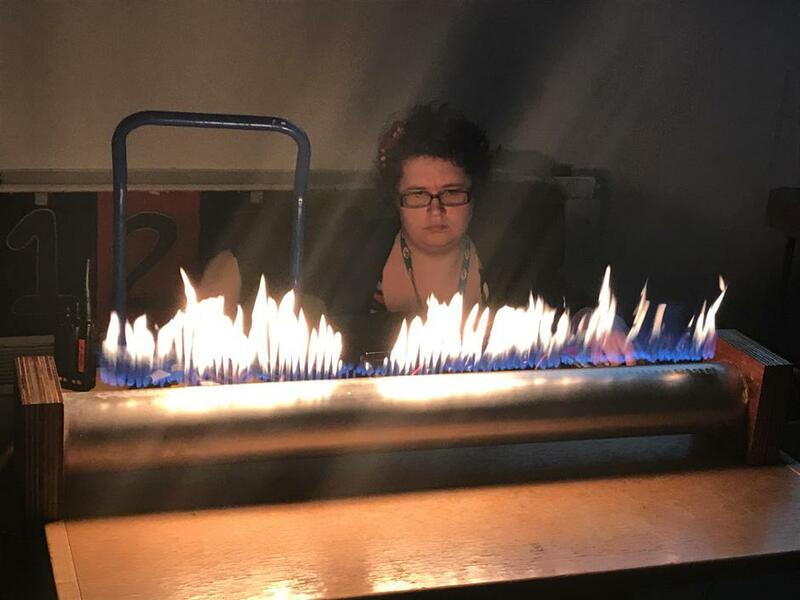 This project is in conjunction with artist Mark Clarke and author/illustrator Jessica Shepherd. 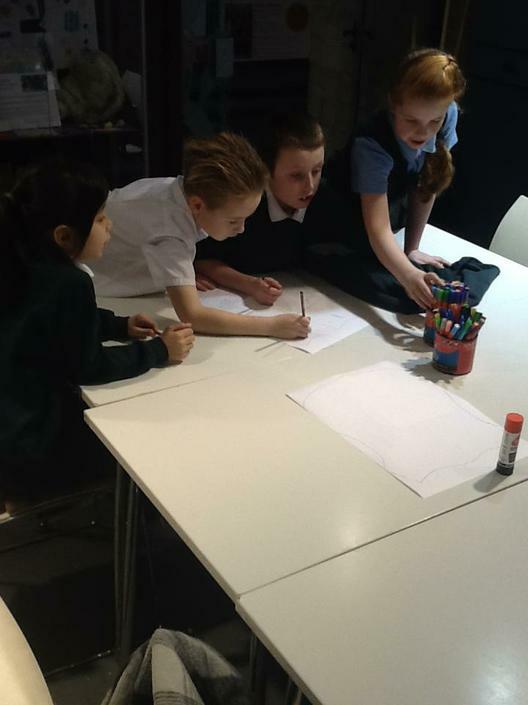 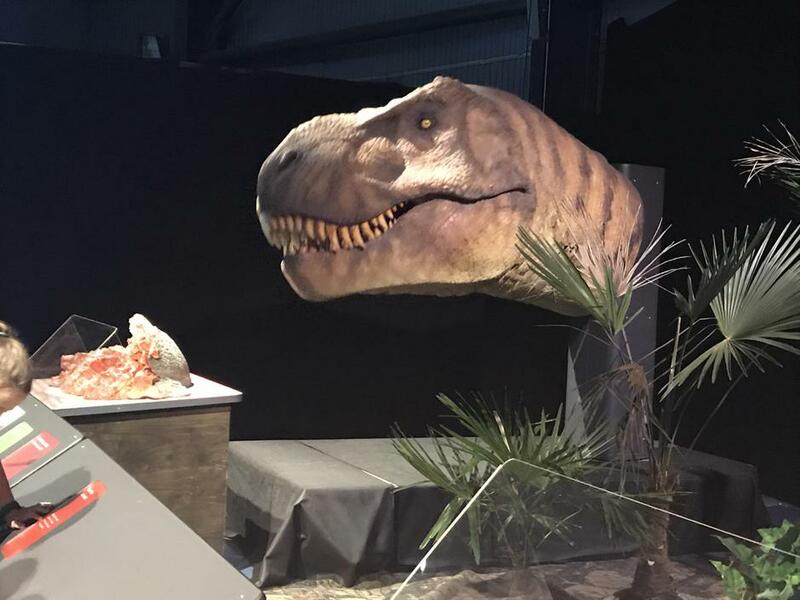 The children were able to look around the exhibition and meet Jessica, the children had the opportunity to sketch and make prints of their sketches. 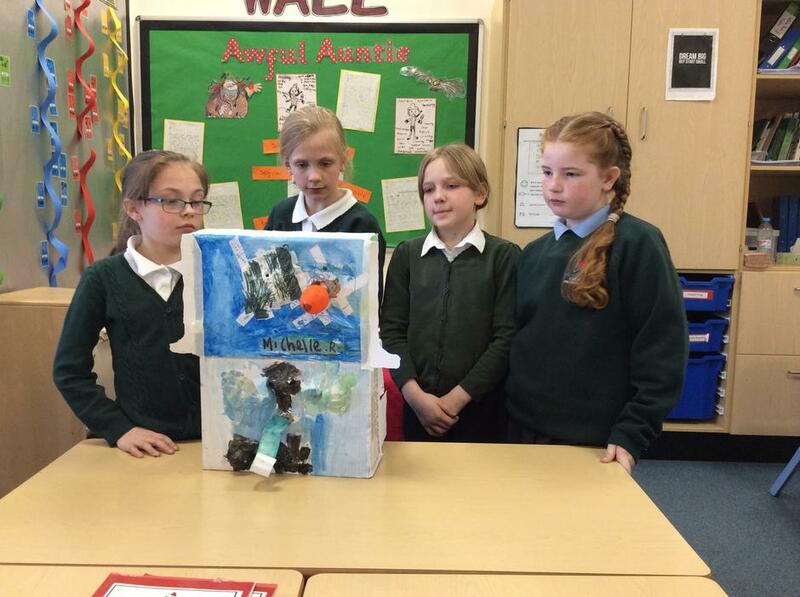 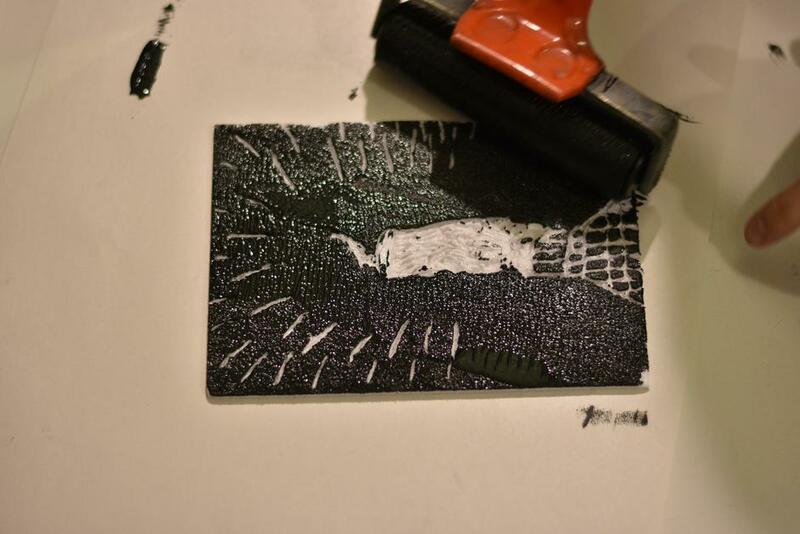 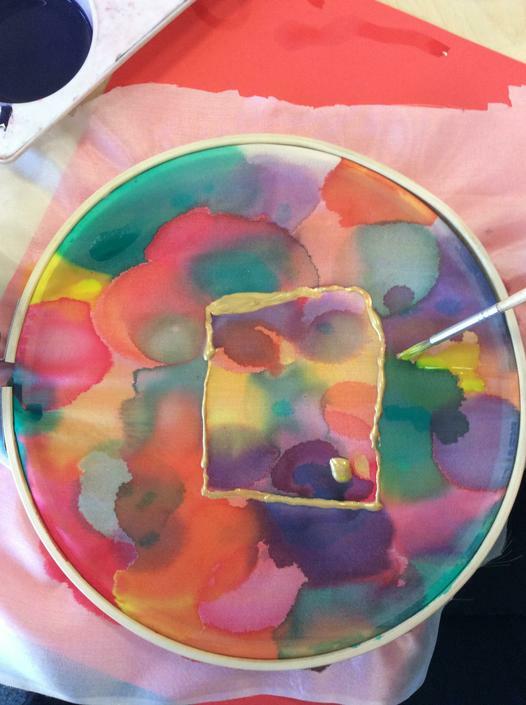 Our final piece of work will be displayed in the gallery as part of the exhibition. 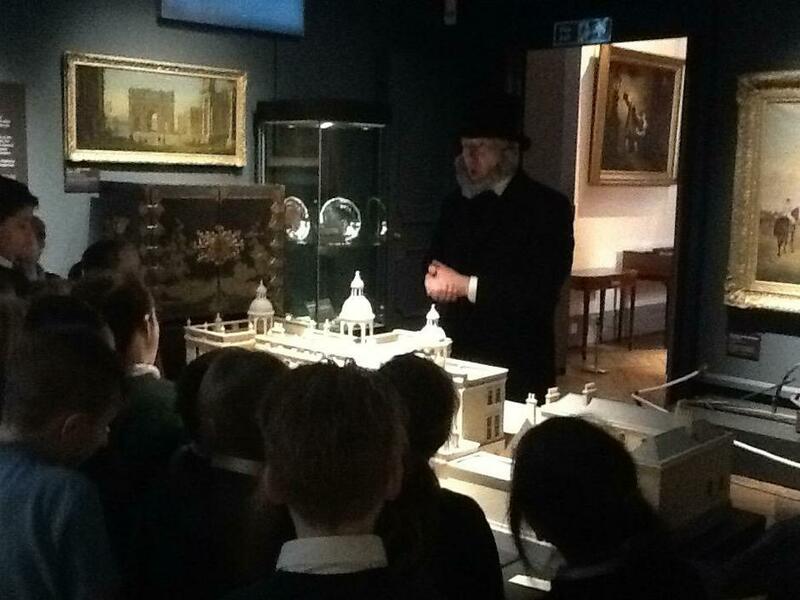 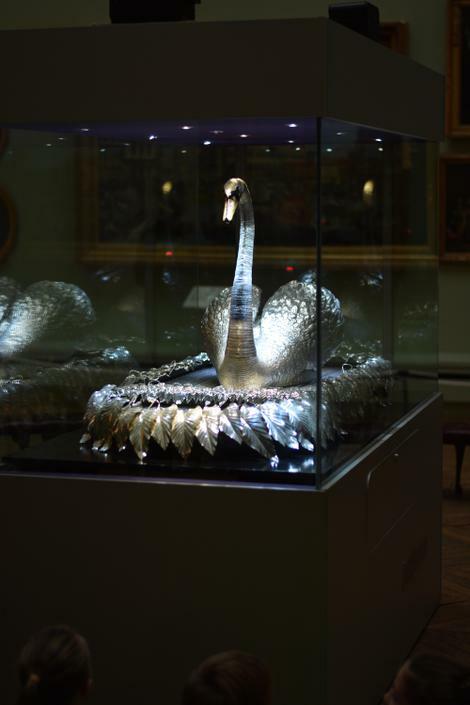 More photographs of our visit to Bowes Museum to follow. 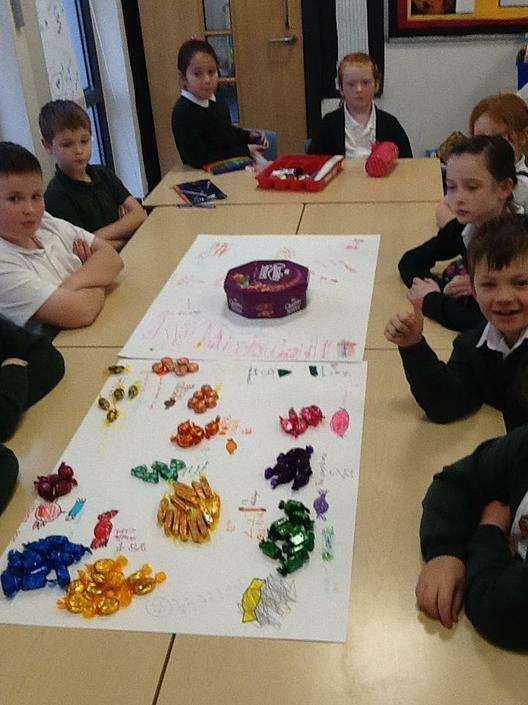 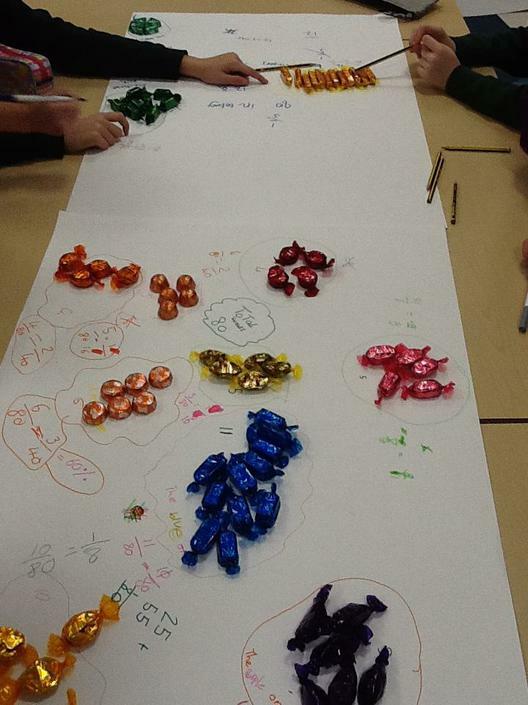 Class 4 carried out an investigation to see if all boxes of Quality Street are equal. 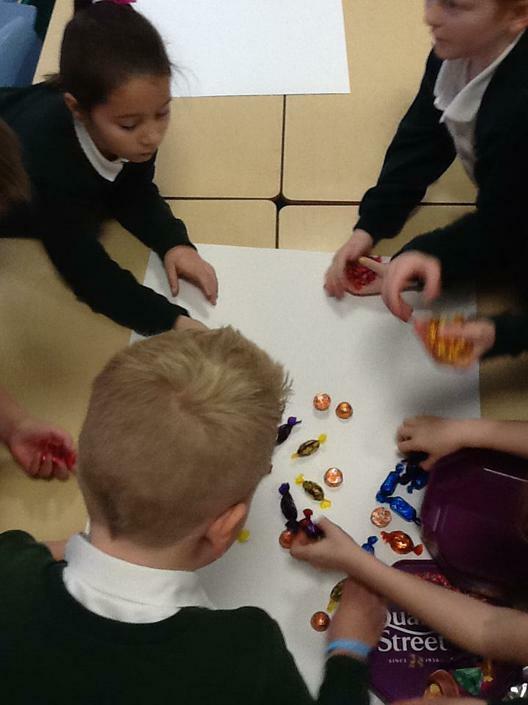 We counted each tub and then the fraction of each type of sweet. 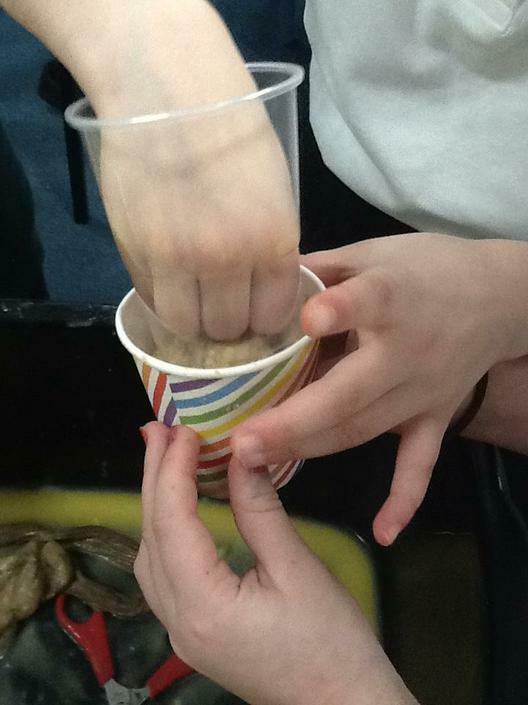 The results were interesting. 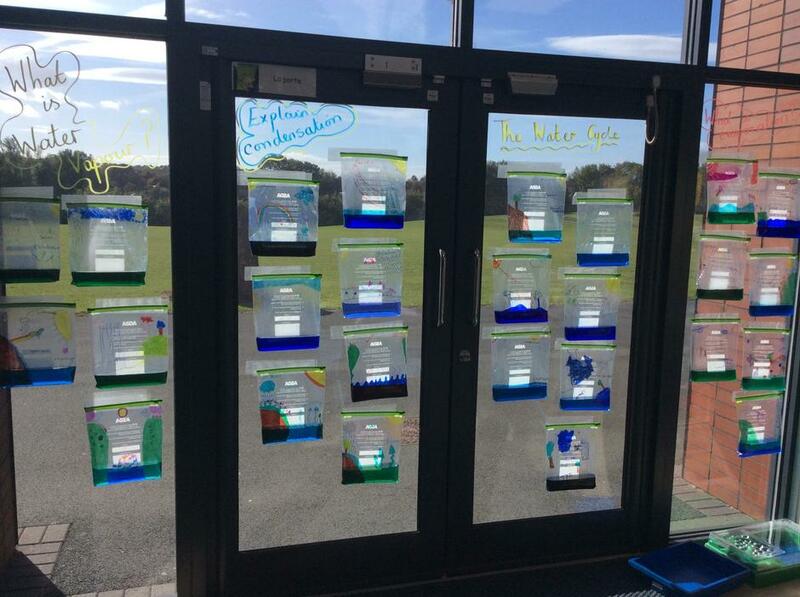 Our new reading challenge has started this half term and new prizes are up for grabs. 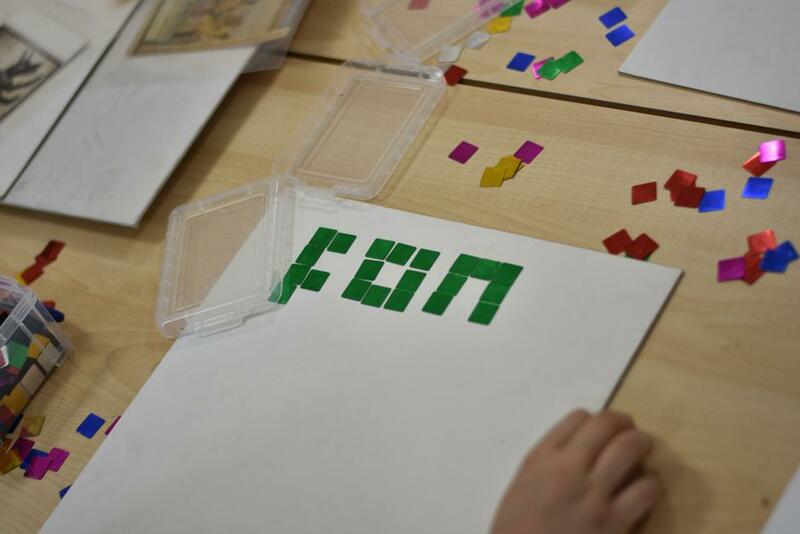 Who is going to read the most words this half term? 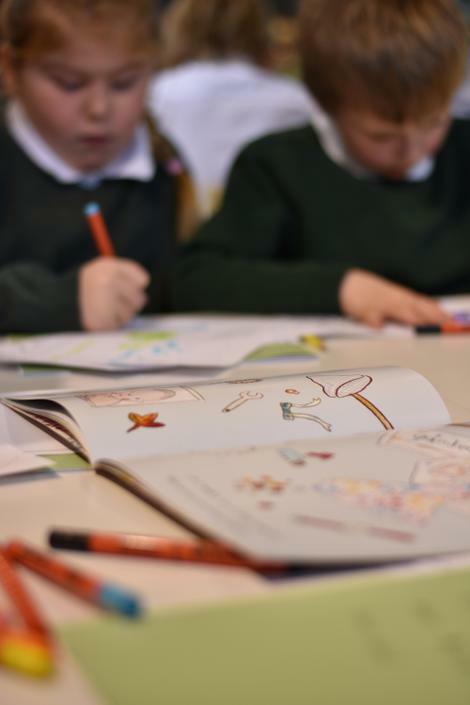 Children are expected to read every night and have opportunities in school to read and are given time to take reading quizzes. 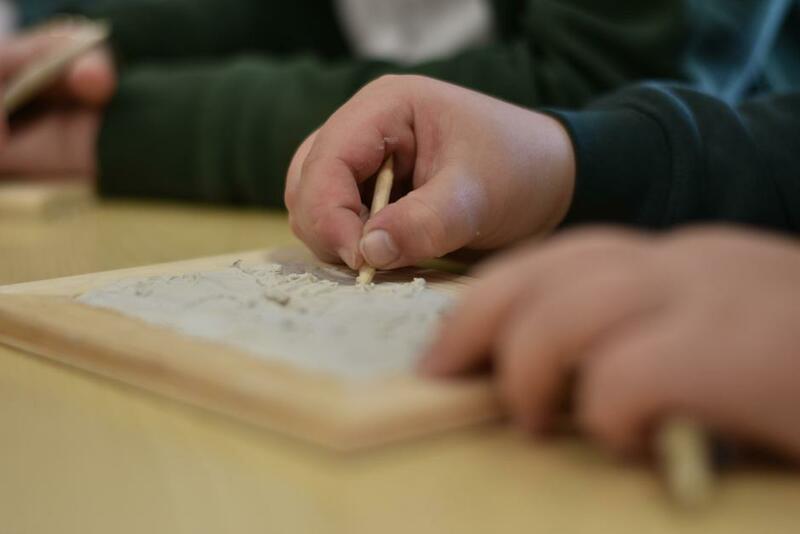 How many words have you read this half term? 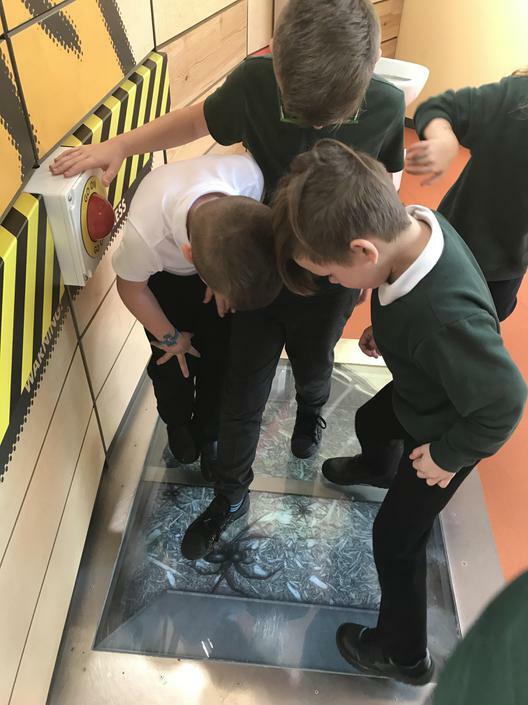 Can you beat 200,000? 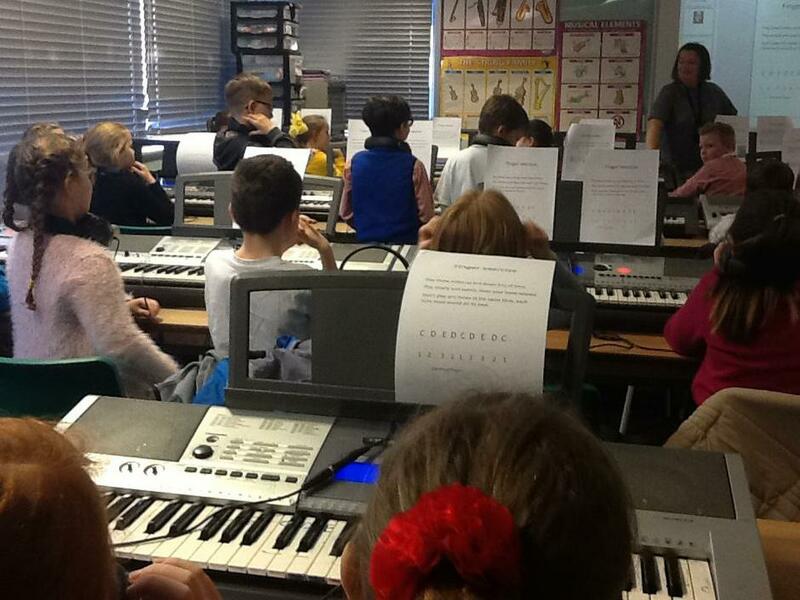 Class 4 have been to Bishop Barrington for a session of singing and learning to play the keyboards. 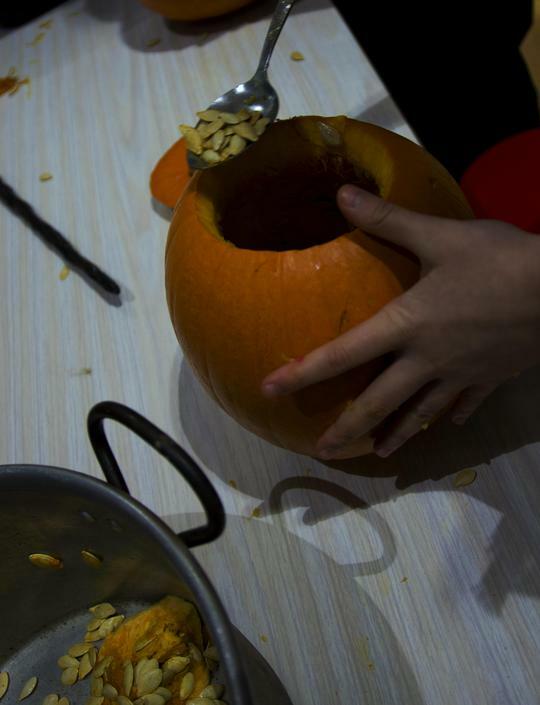 It was great fun, learning a new skill. 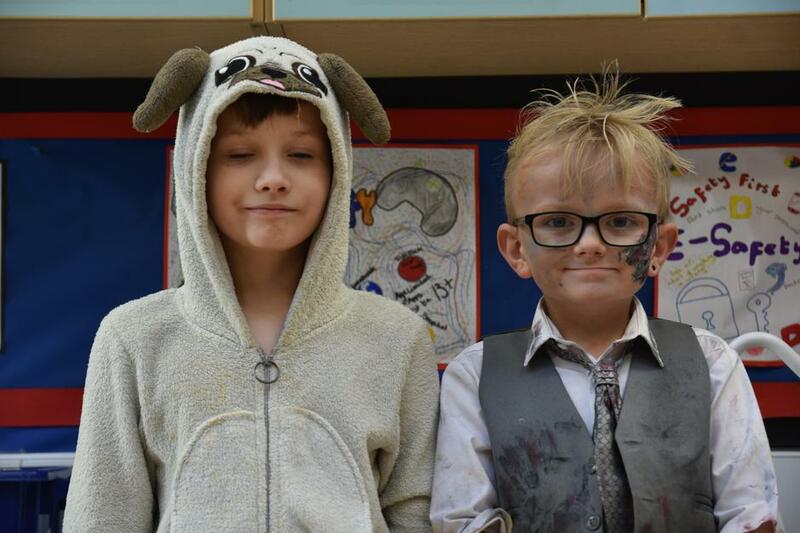 This half term we have been looking at The BFG and Horrid Henry which the children have loved. 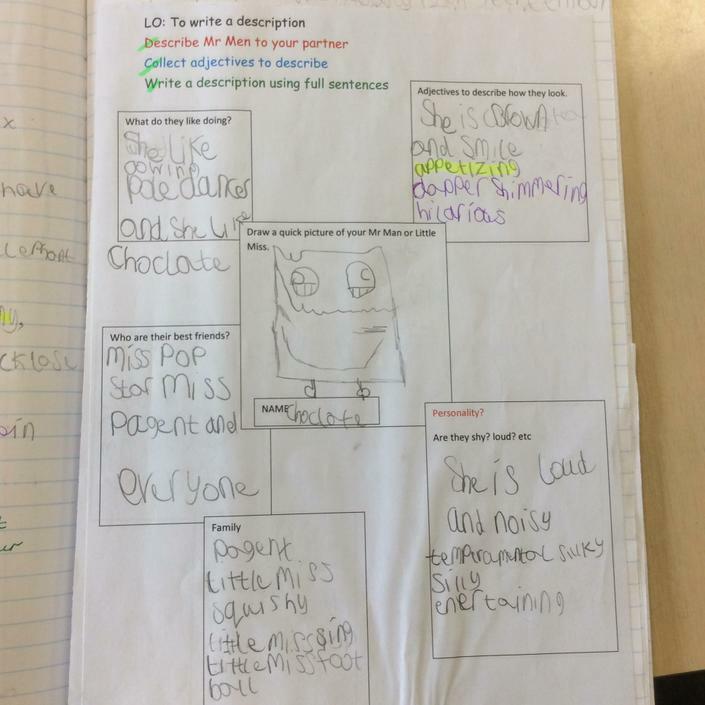 They have looked at character descriptions, settings, wrote their own story. 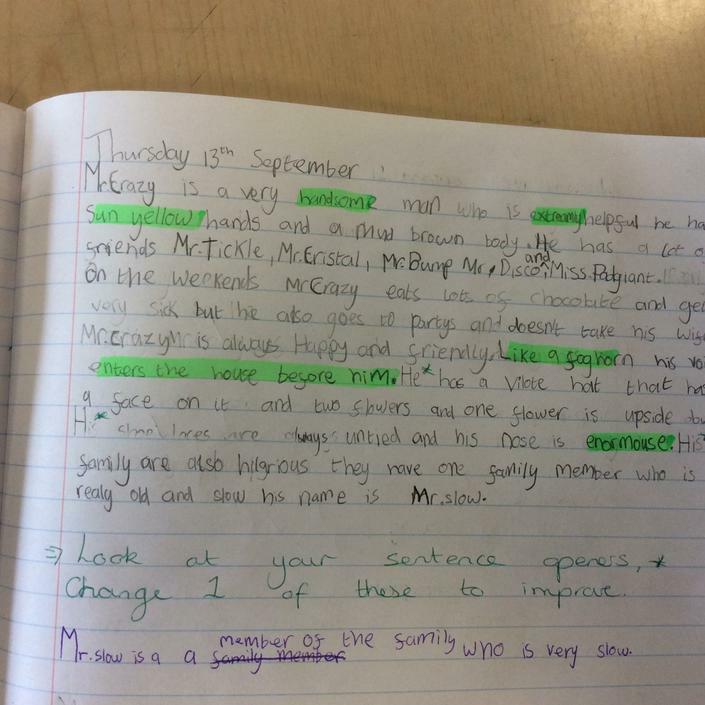 We have looked at technical vocabulary such as alliteration, nouns, verbs, prepositions and have used similes and metaphors in our writing. 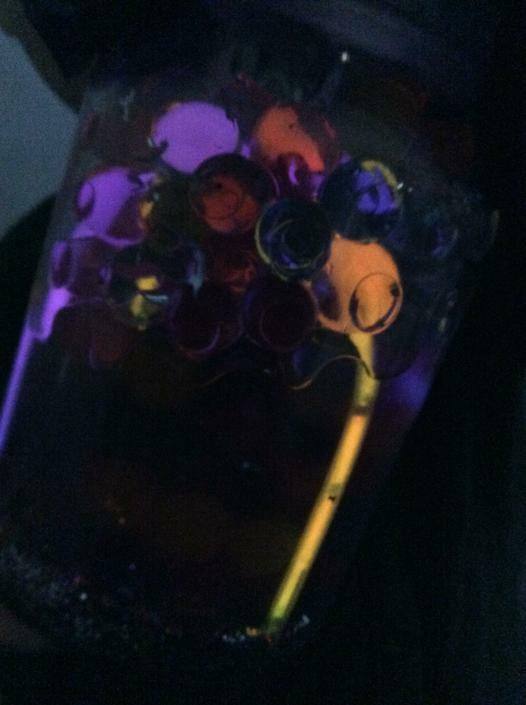 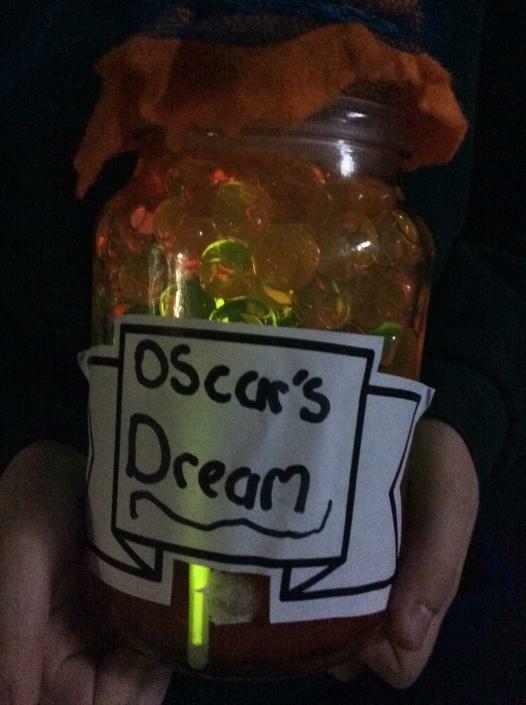 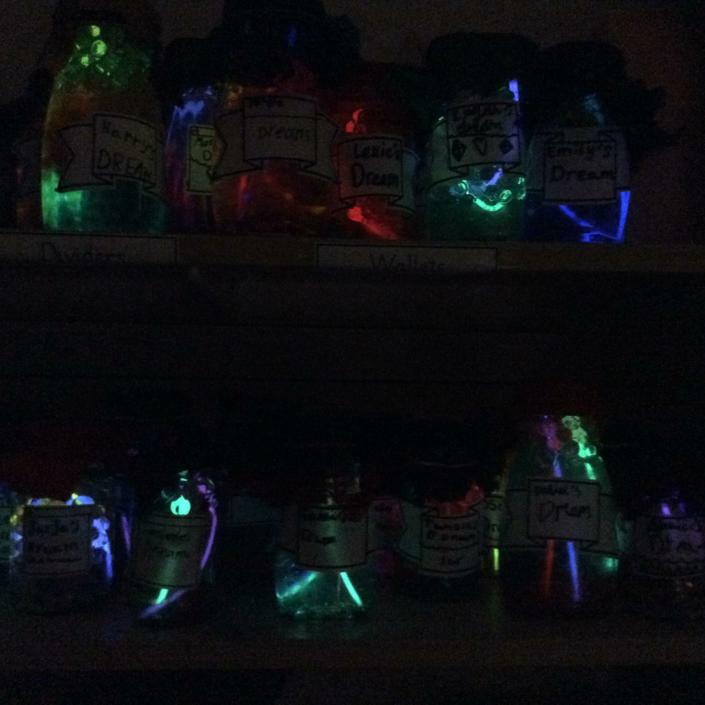 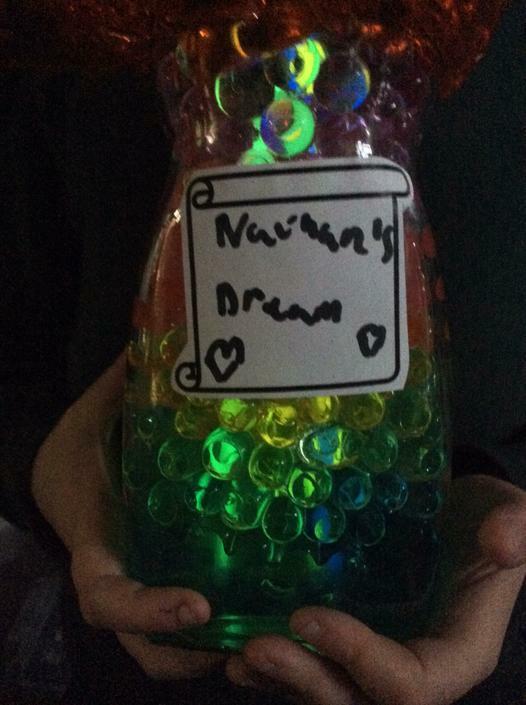 Some children have produced Dream Jars, to go alongside our work on The BFG by Roald Dahl. 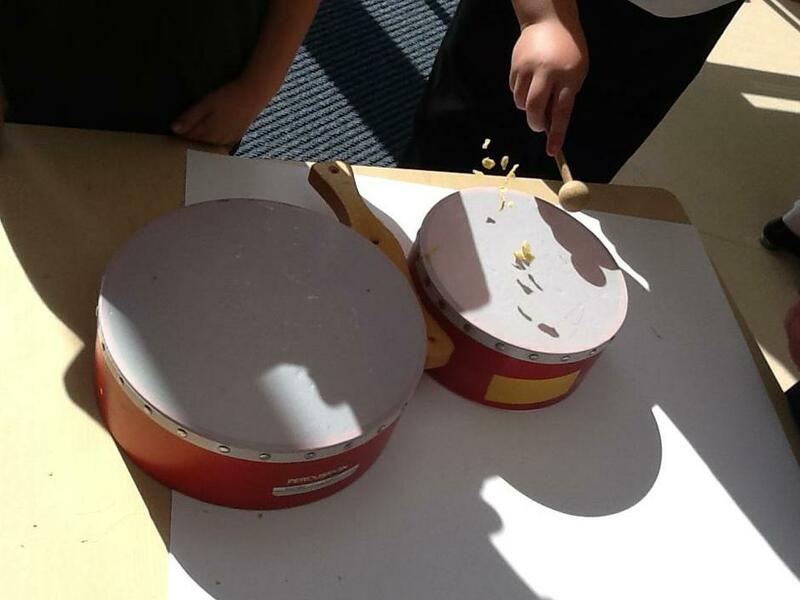 This half term we have been looking at sound, the children have been looking at how sound is produced and how it travels. 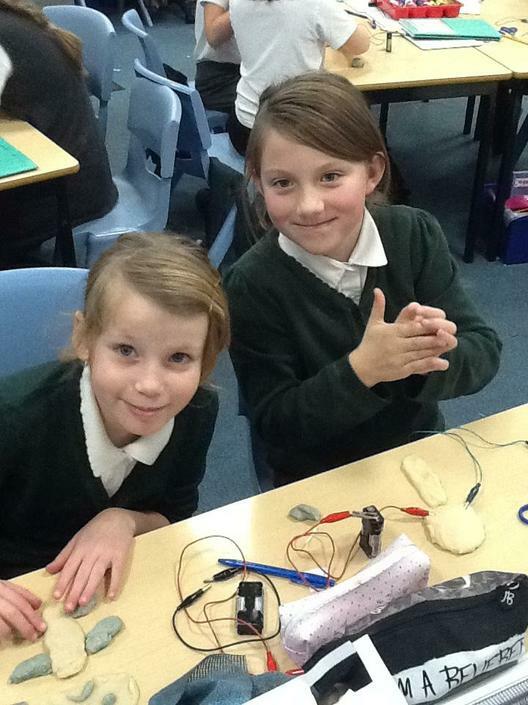 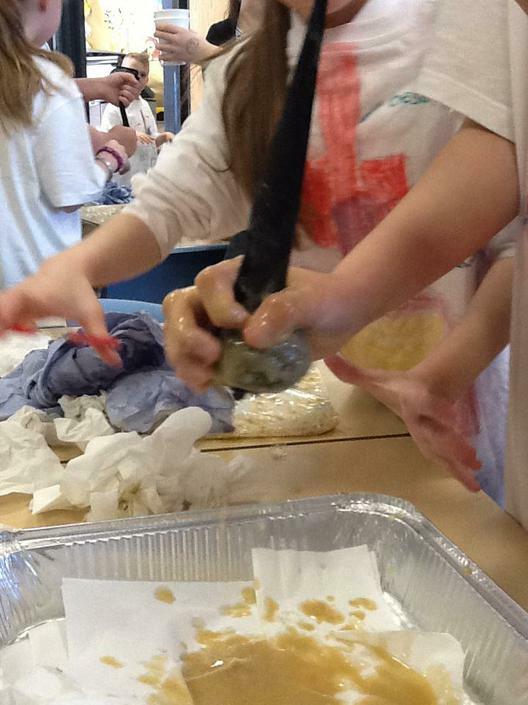 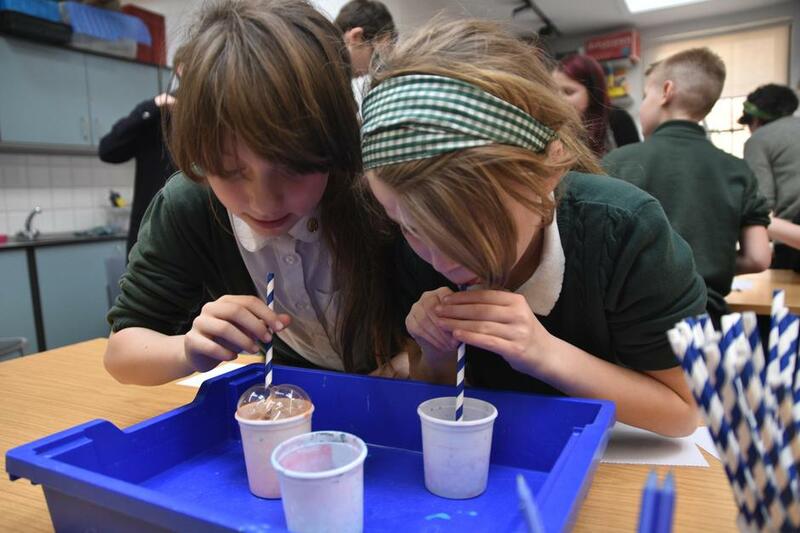 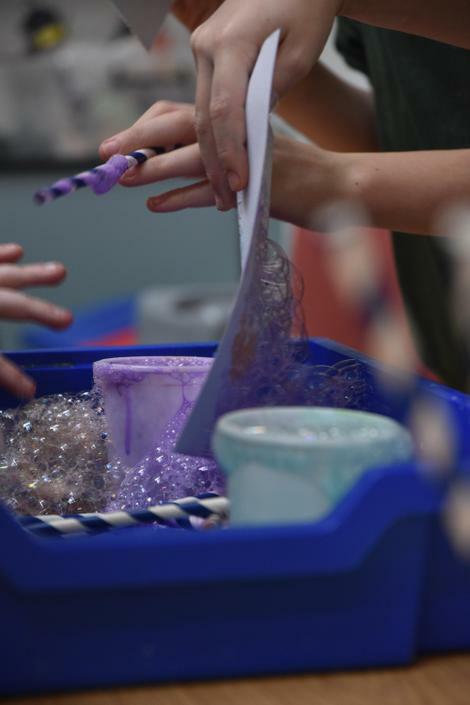 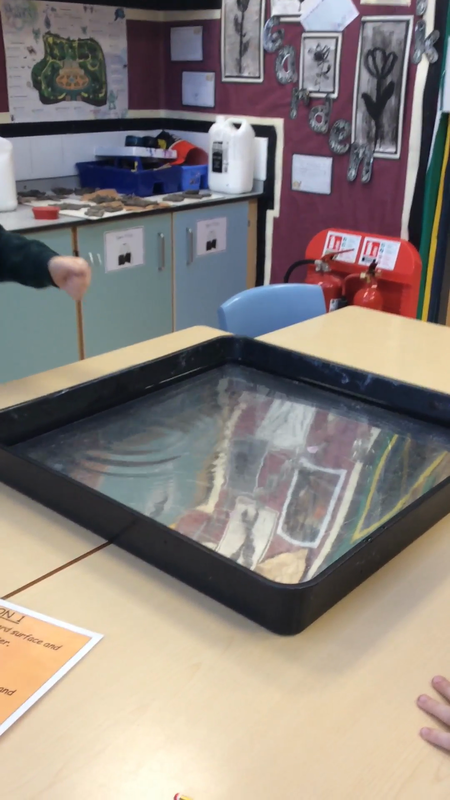 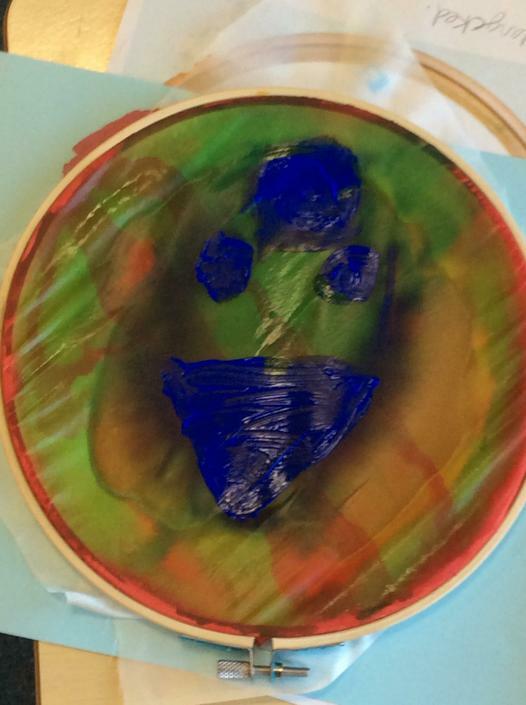 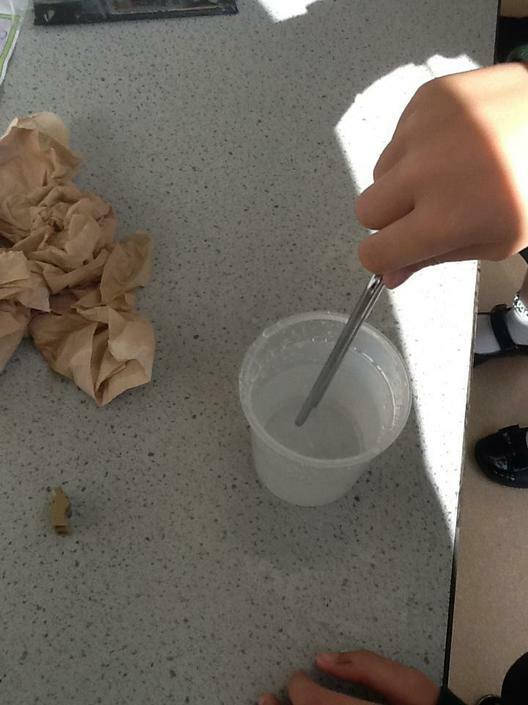 They have worked on a variety of investigations to show the vibrations involved in sound. 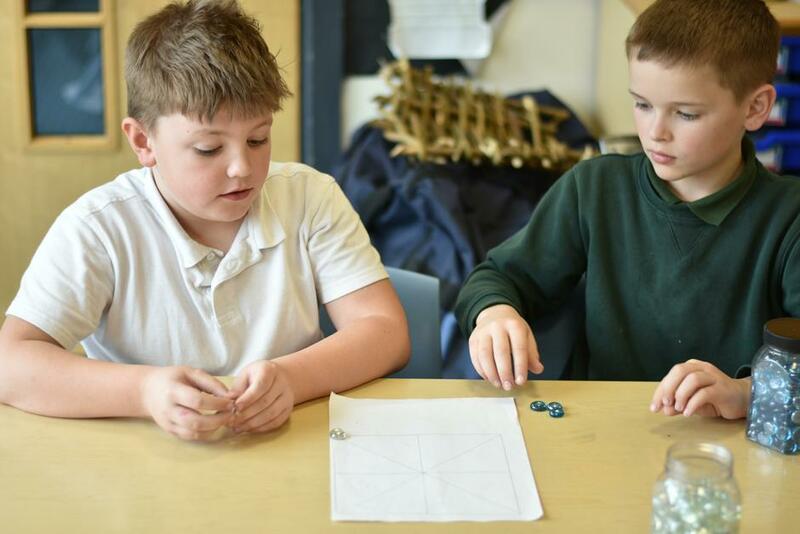 These websites, games and puzzles are fun to visit and support the learning of Year 4 pupils. 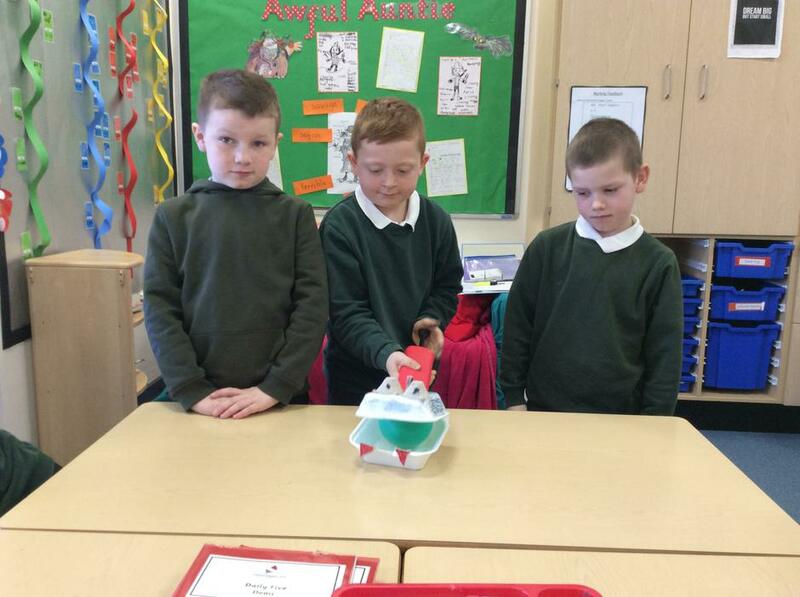 Learning to read with phonics games and activities. 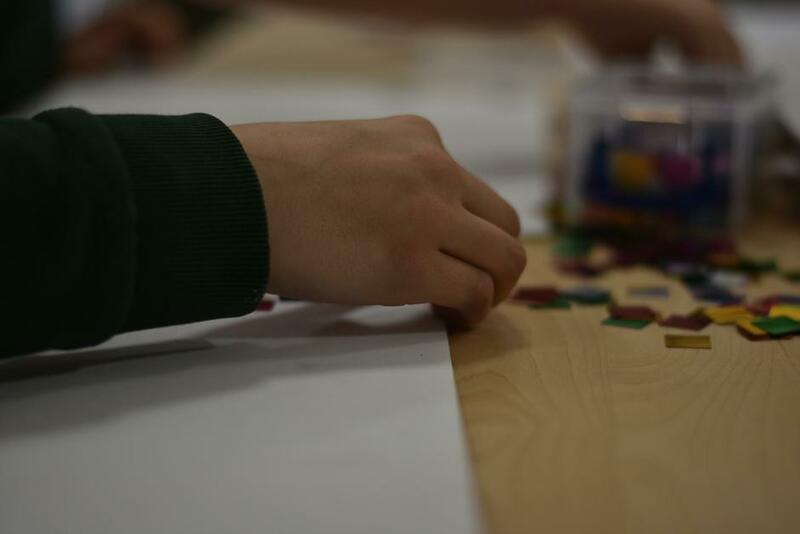 Multiplication tables activities to print, cut and learn with. 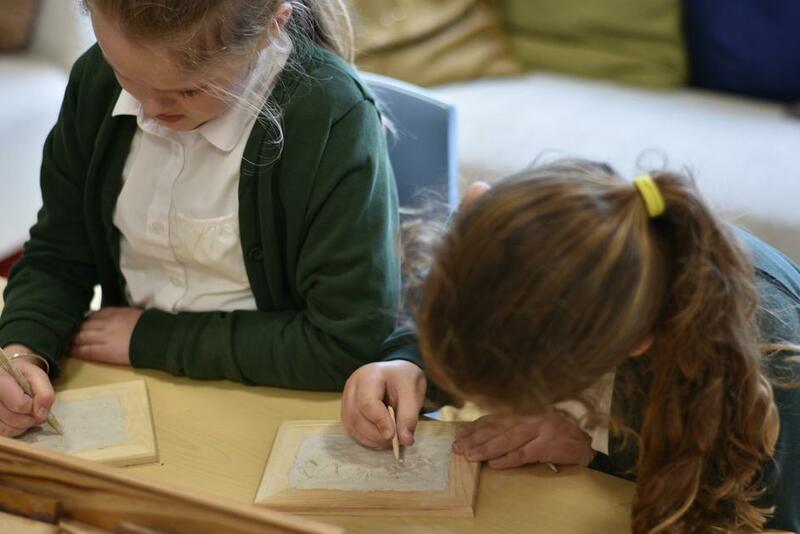 Reading books must be brought to school daily so we can keep a record of the children’s progress. 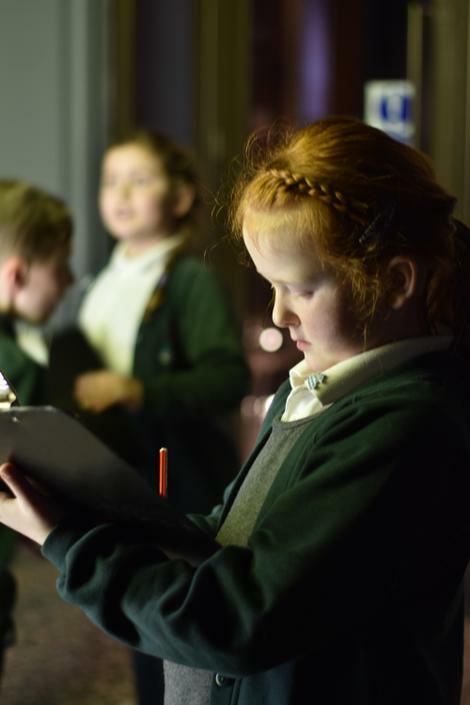 Many children in Year 4 can read and record their reading independently but we ask that you listen to them as often as possible too as it is helpful for their progression. 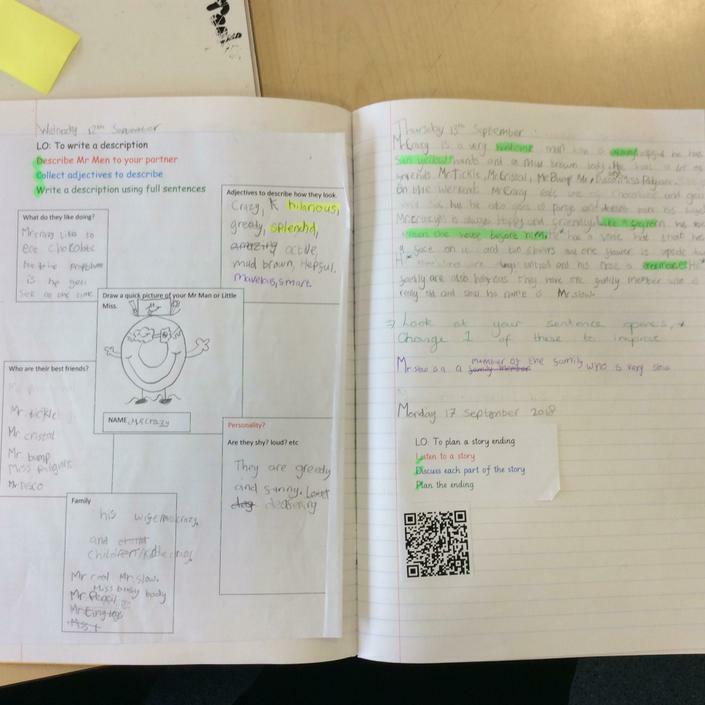 We are using Reciprical Reading in class and details of this are in the front of your child's Reading Journal. 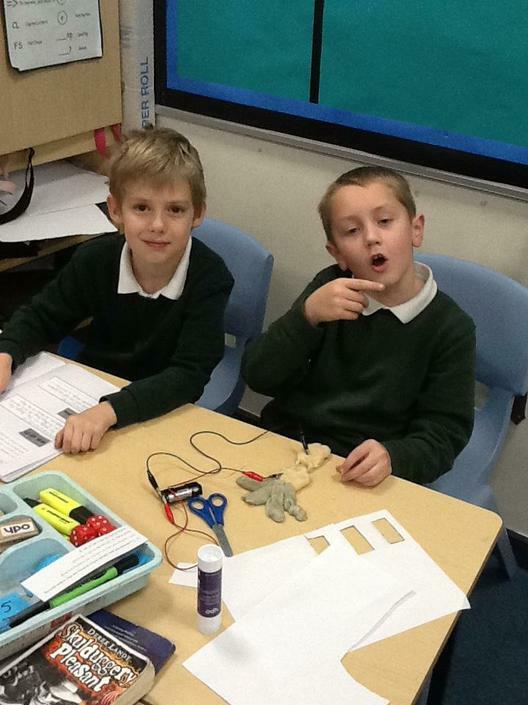 Times tables will be practised and tested regularly throughout the school day. 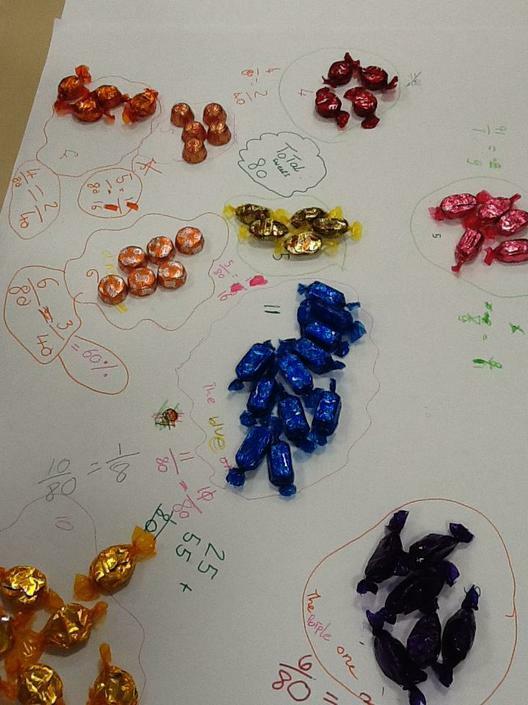 It is important the children also practise these at home to encourage success in maths. 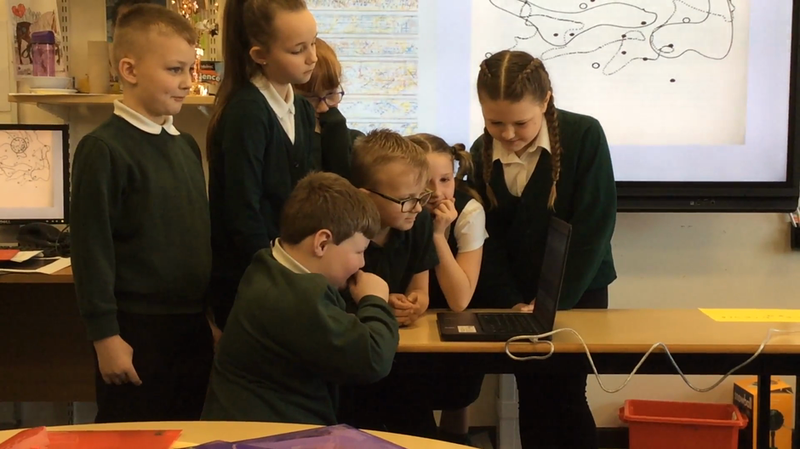 We do a times tables test every other week and it is expected at the end of Year 4 that children know all times tables to 12x12 and the related division facts. 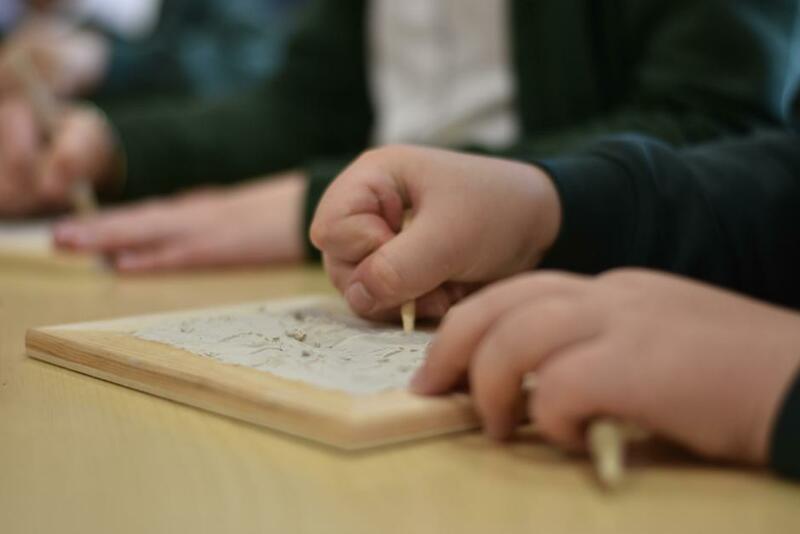 Spellings will be sent out weekly on a Friday and tested the following Friday. 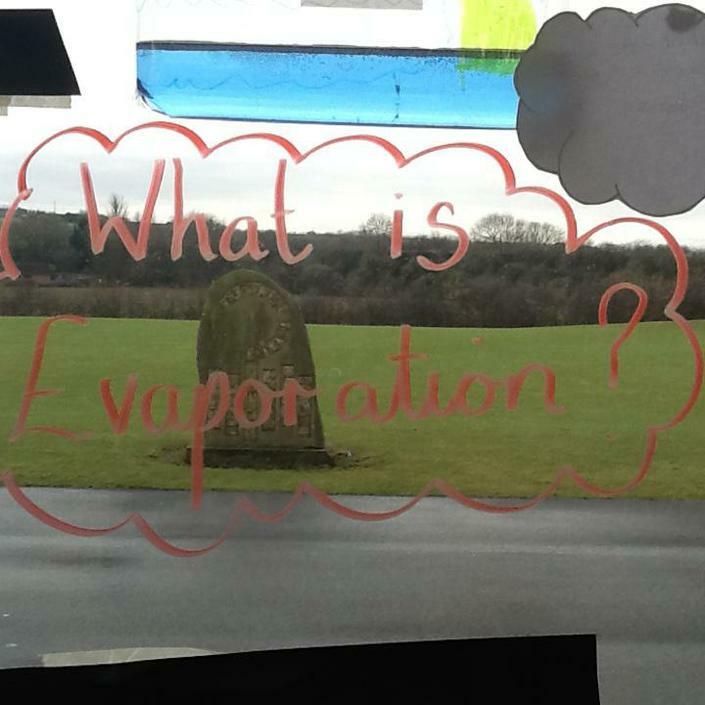 Short and often revision of these is best. 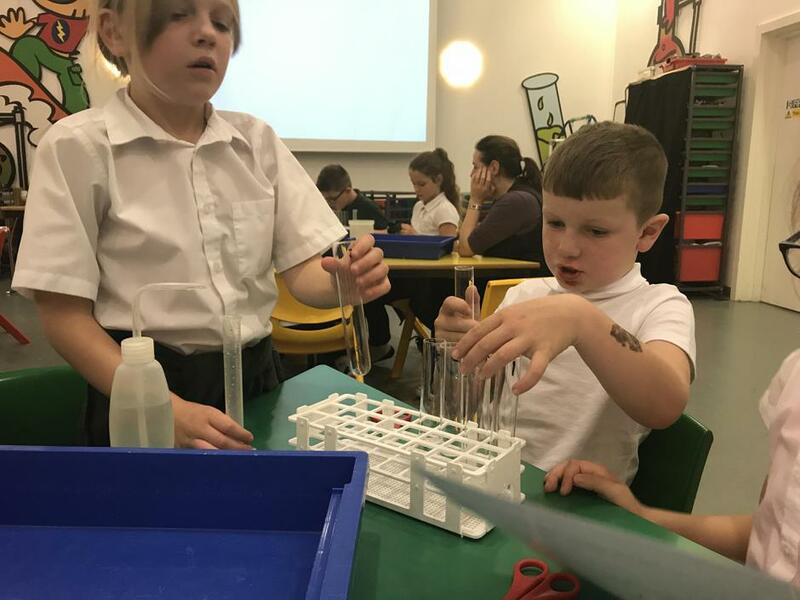 Full PE kits are needed on Tuesday, Mrs Jones (P.E Teacher) asks for every child to bring their kit in on Mondays to ensure they are prepared for their lesson. 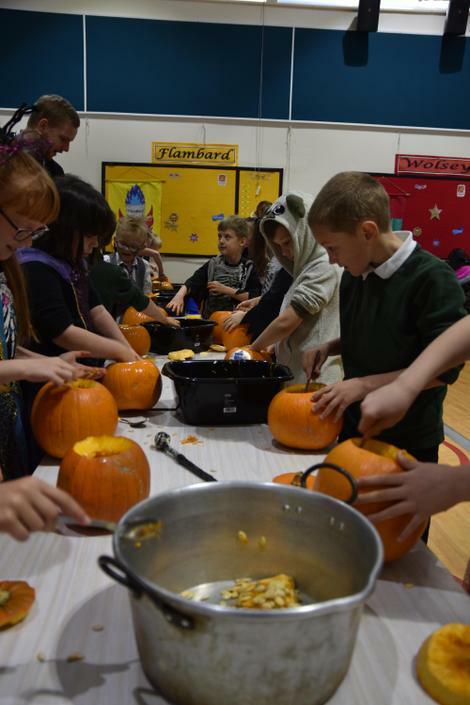 Celebration assemblies are held on Fridays at 2:35. 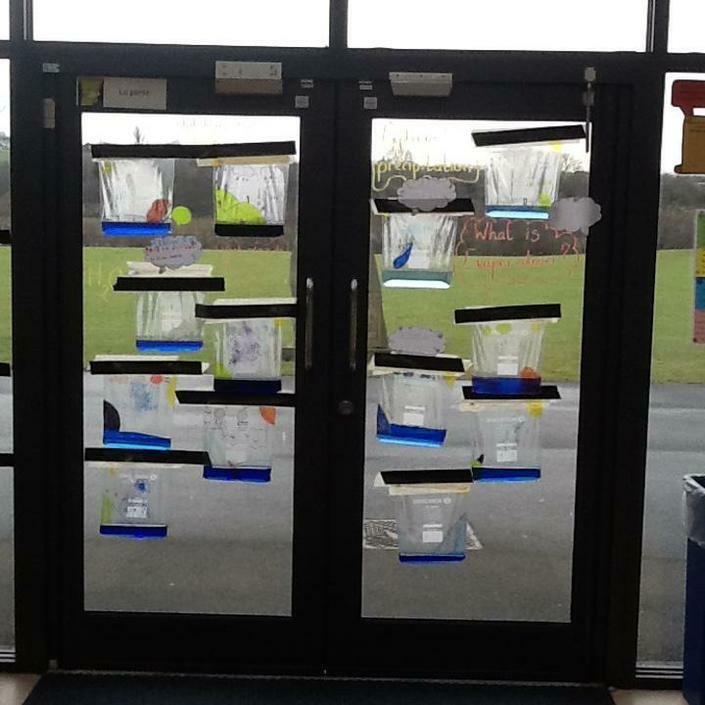 If your child is a ‘Pupil’ or ‘Achiever’ of the week they will bring home a letter on Thursday. 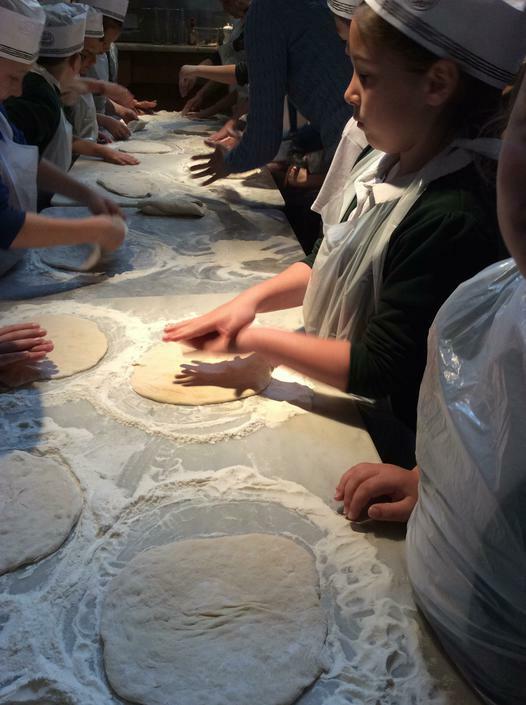 Year 4 pupils can have tuck for 50p per week. 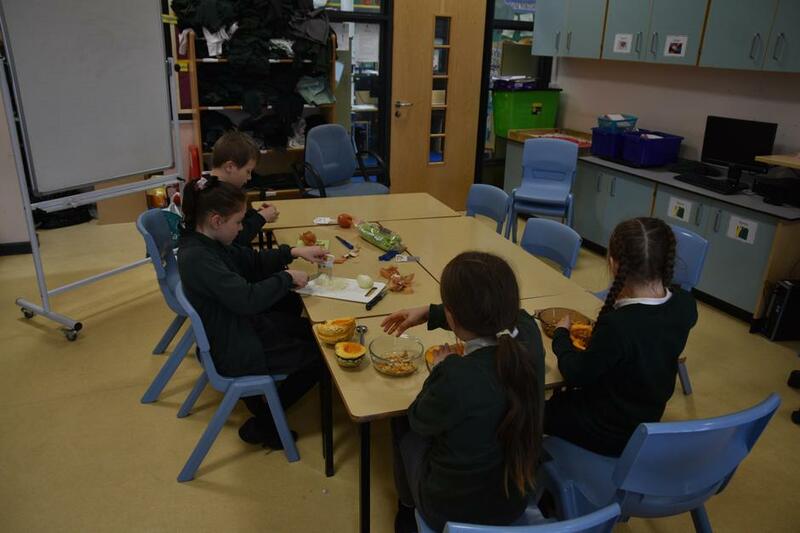 They will receive biscuits or fruit at break time.